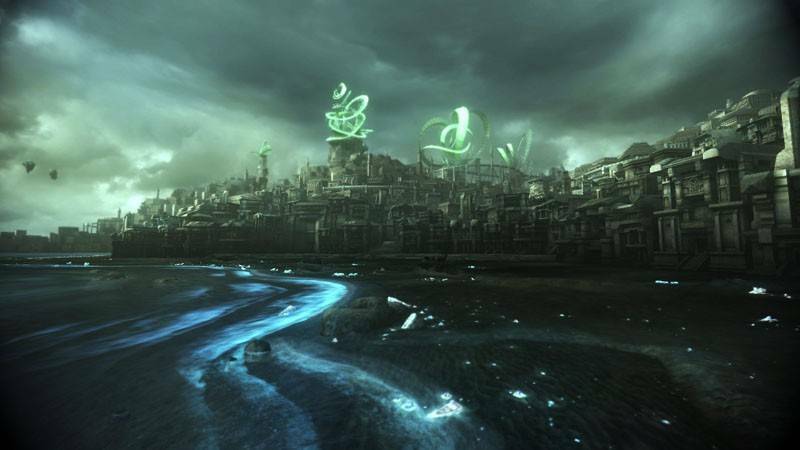 find yourself in a familiar-yet-different world, with new and old characters, but a brand new plot unfurling. 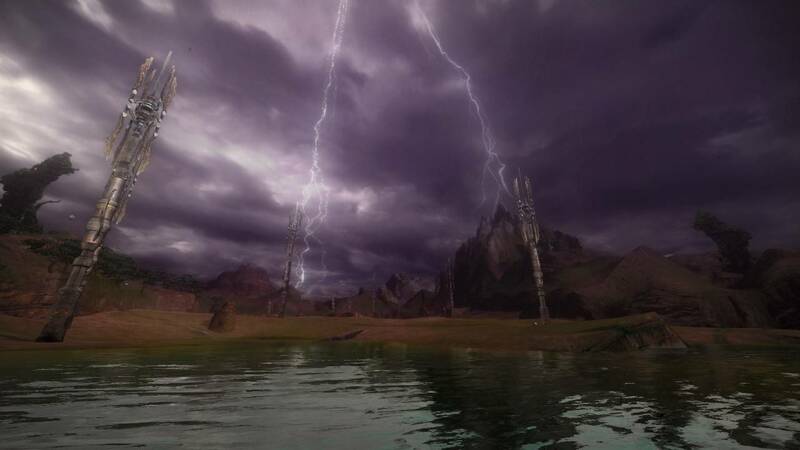 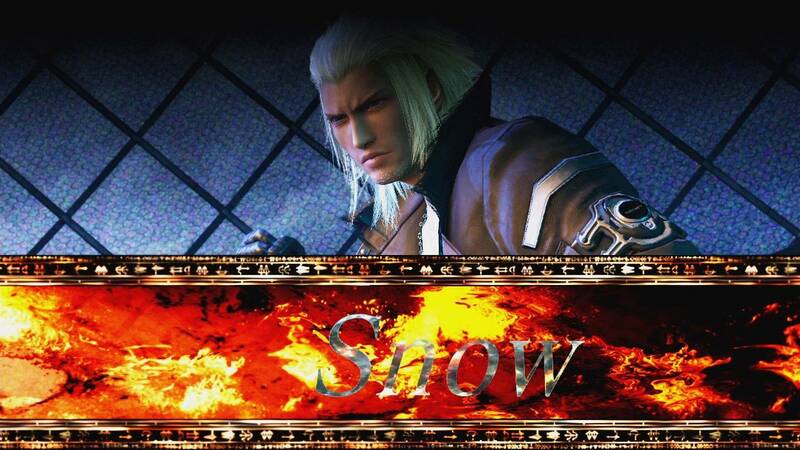 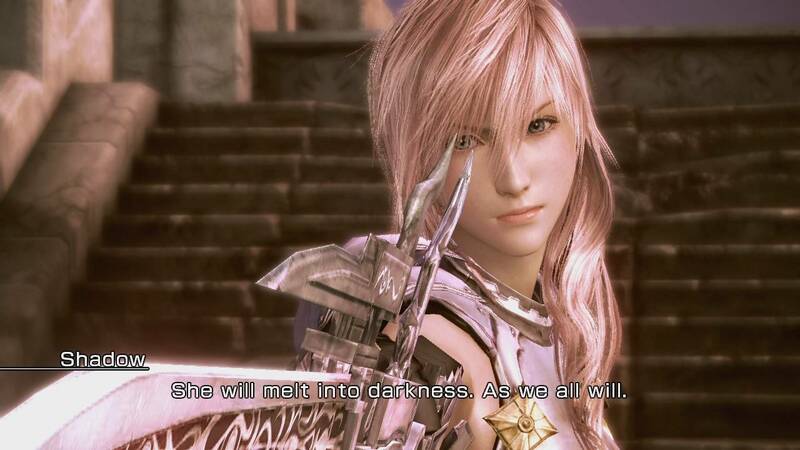 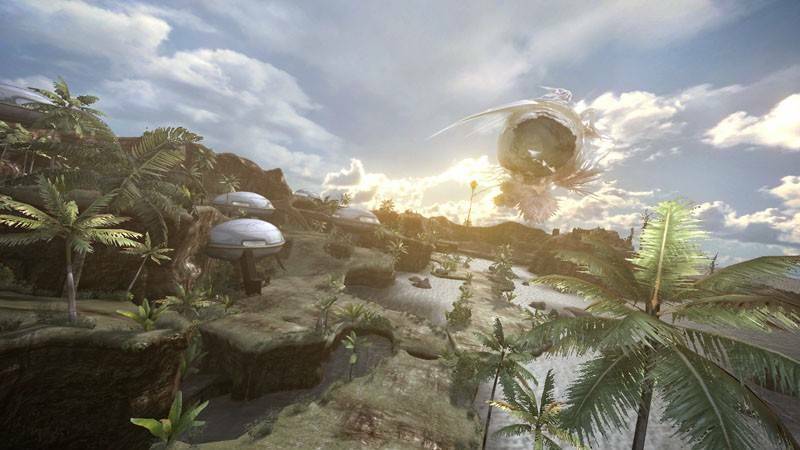 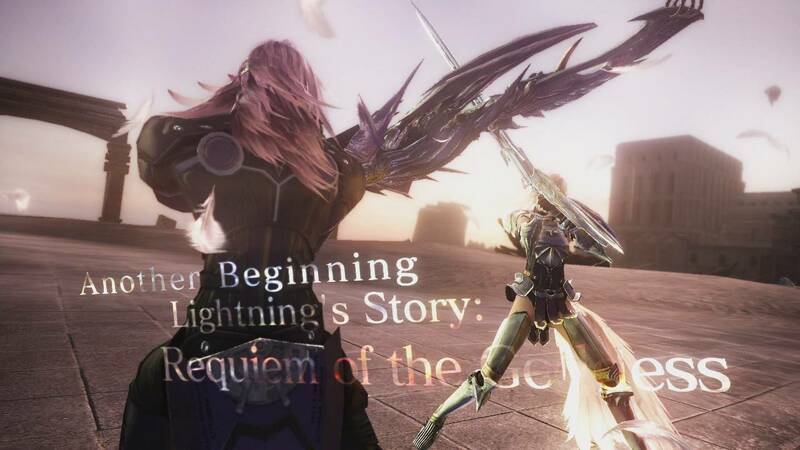 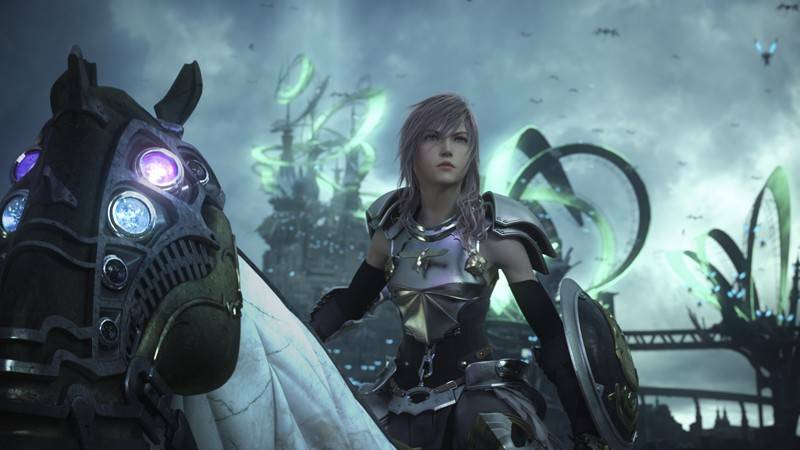 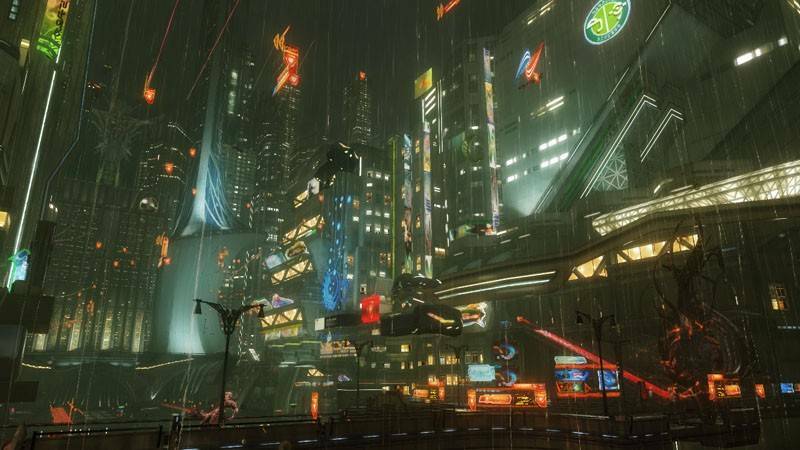 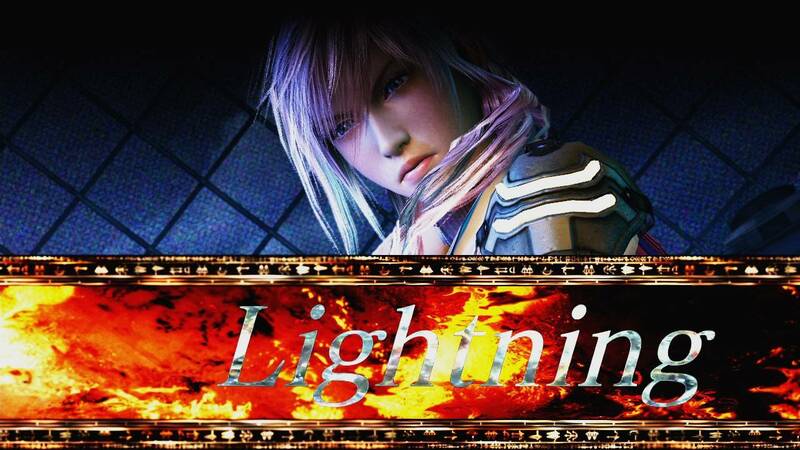 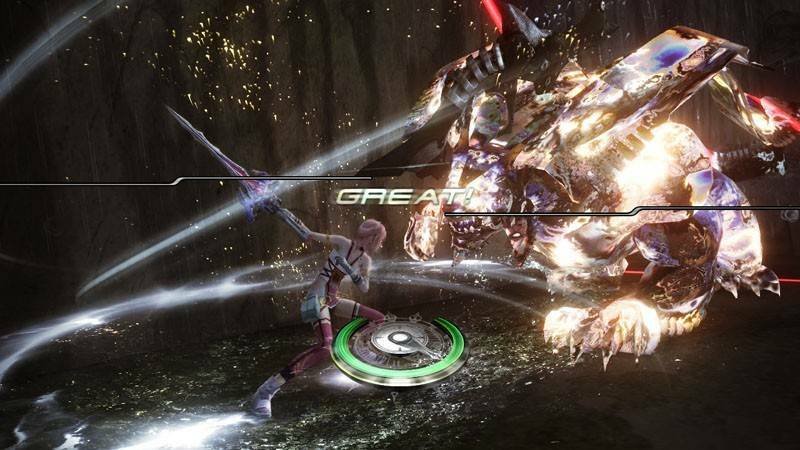 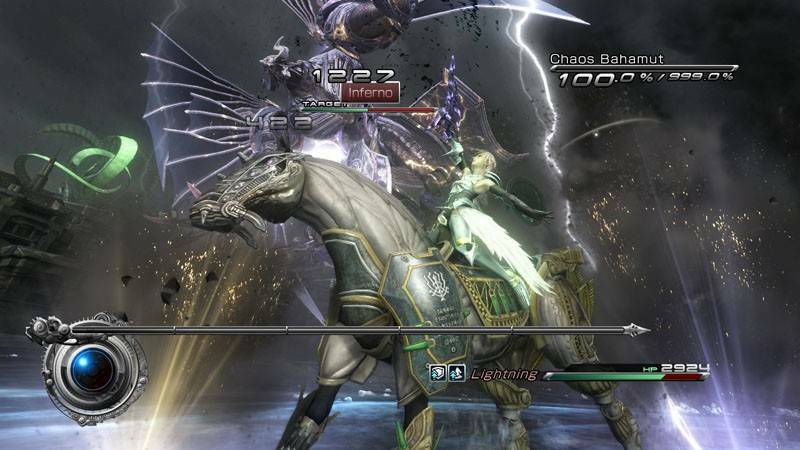 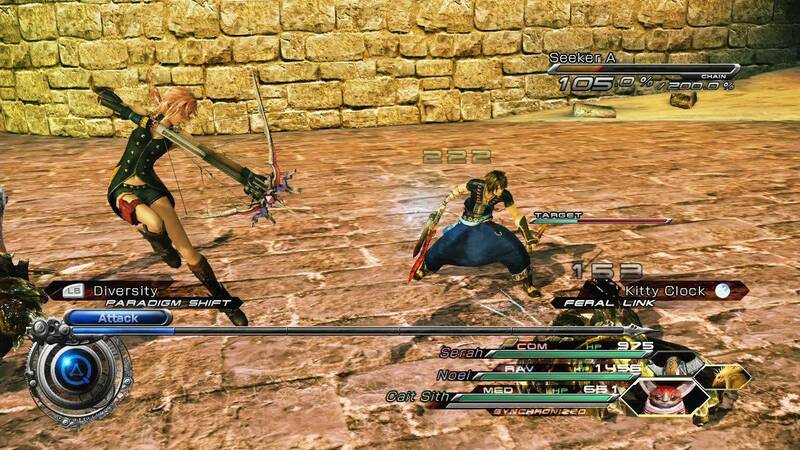 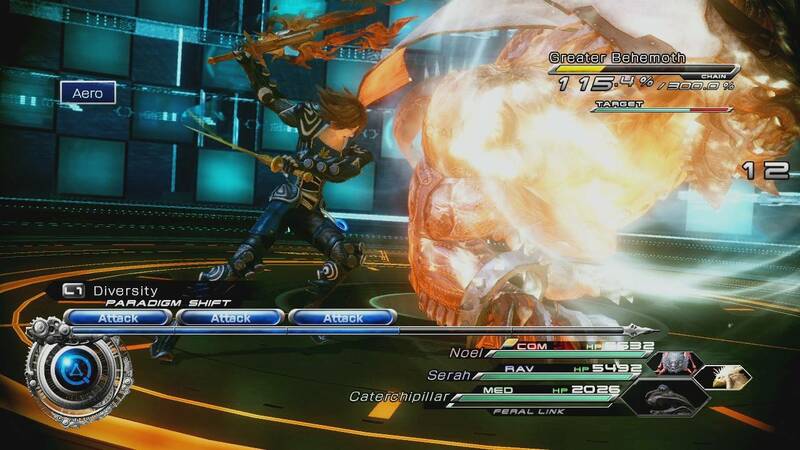 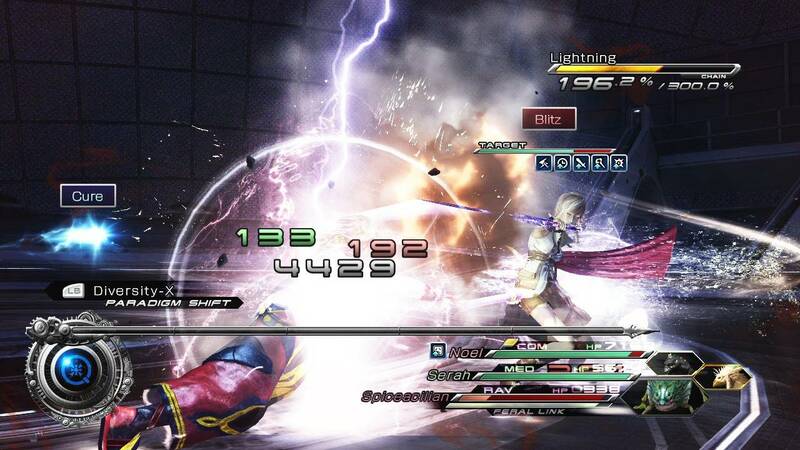 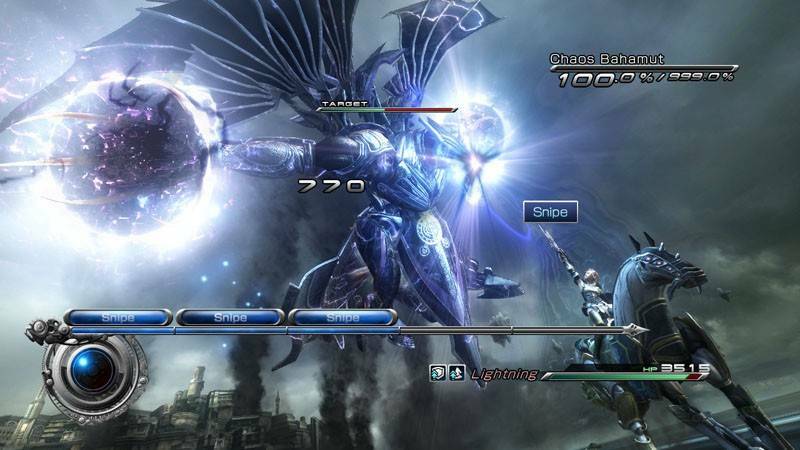 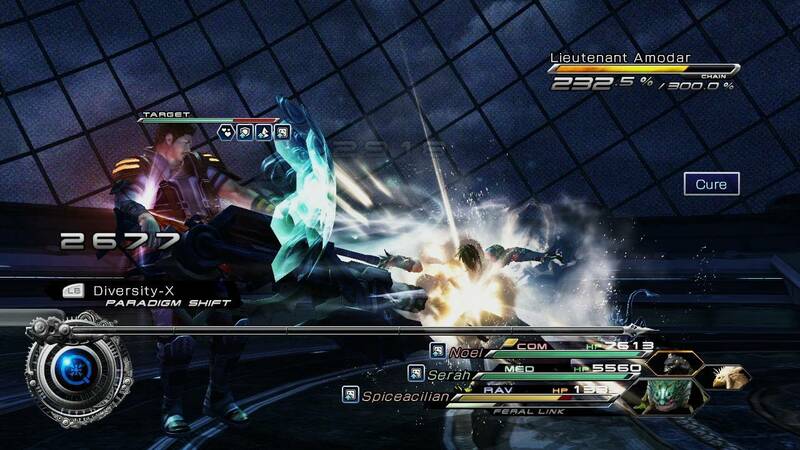 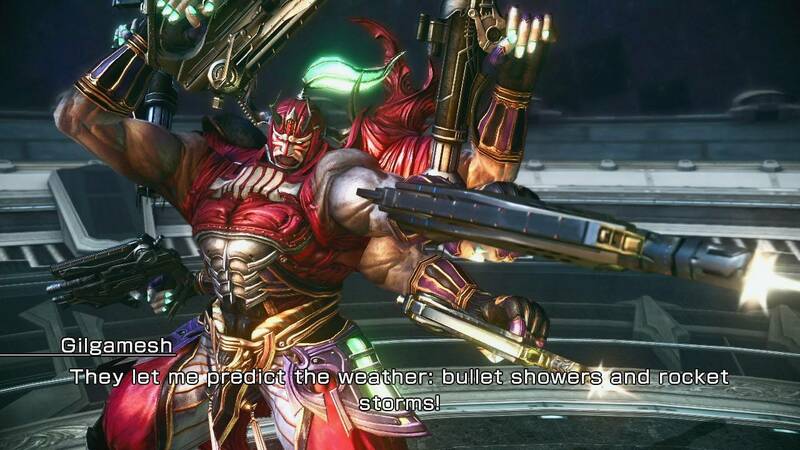 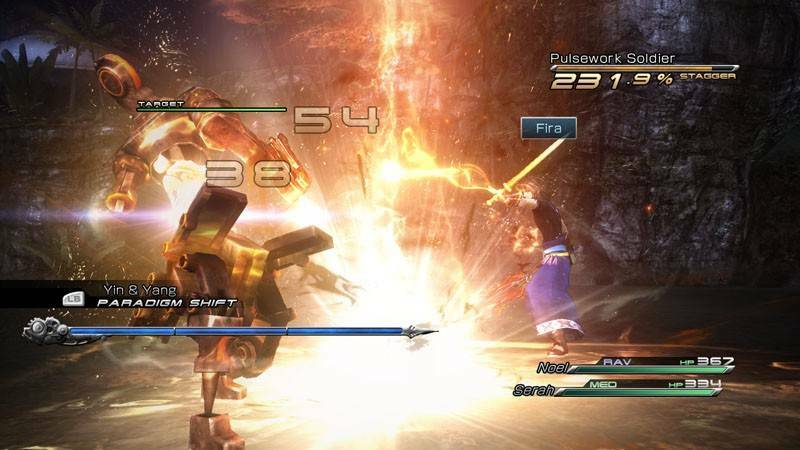 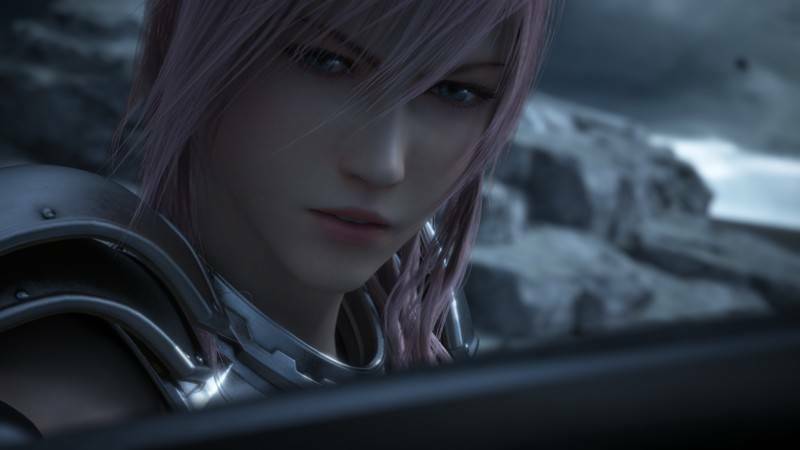 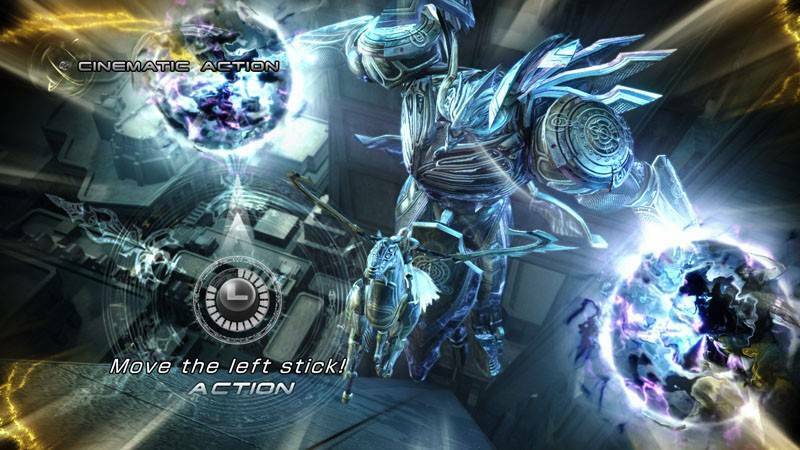 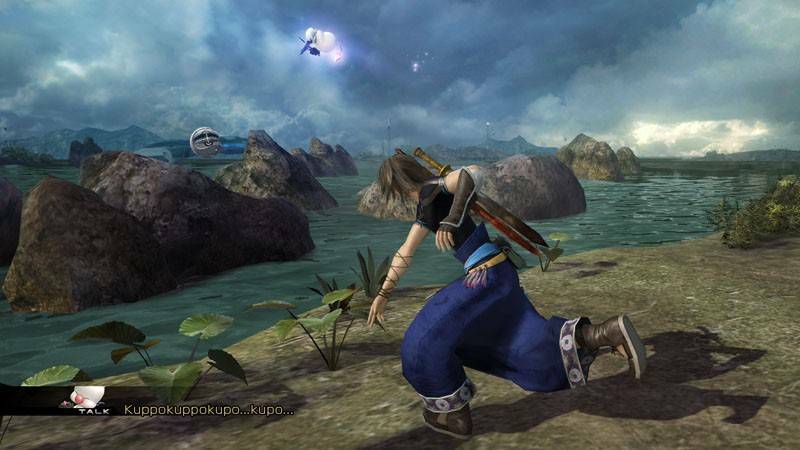 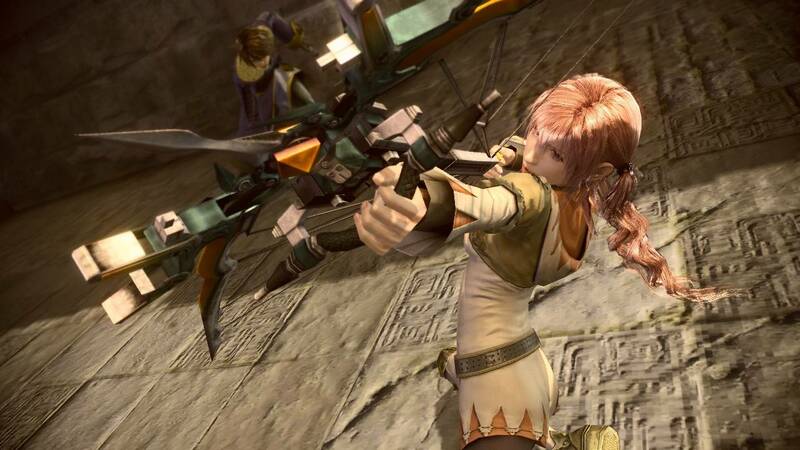 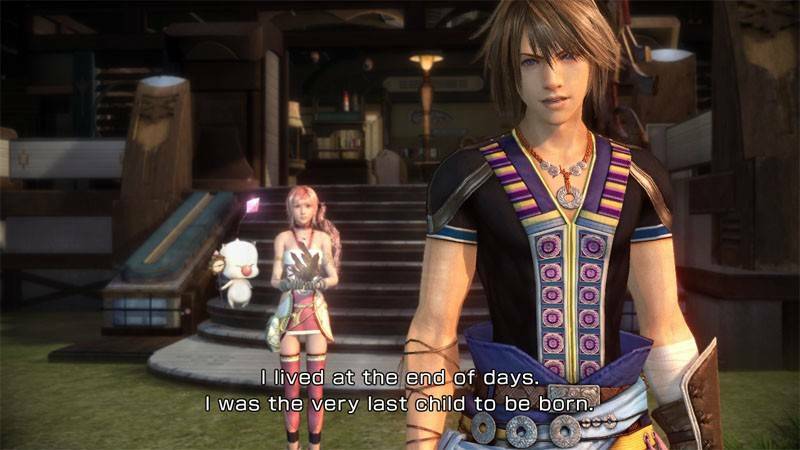 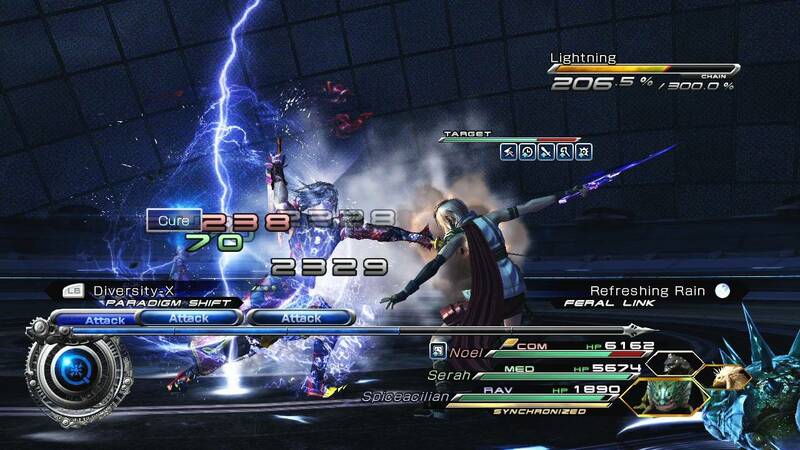 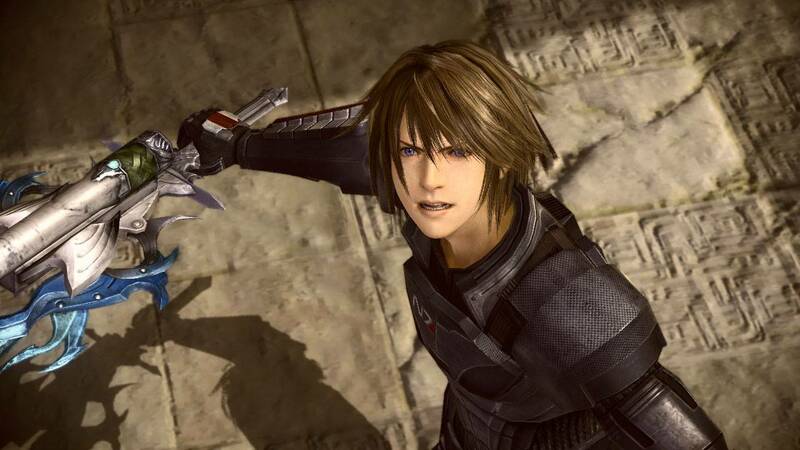 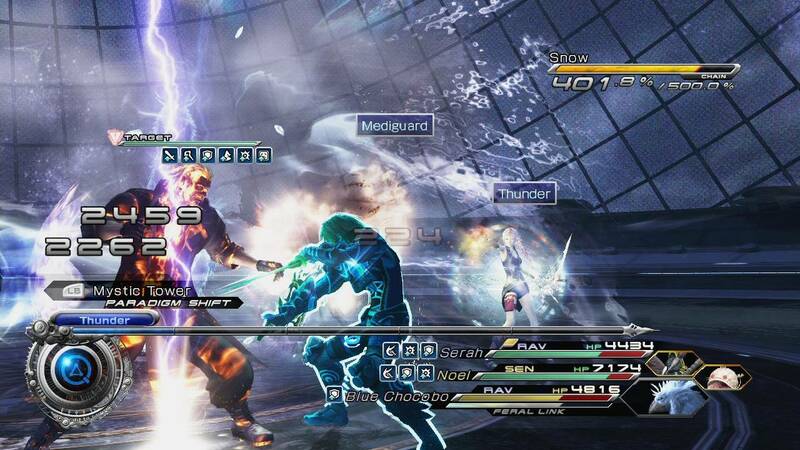 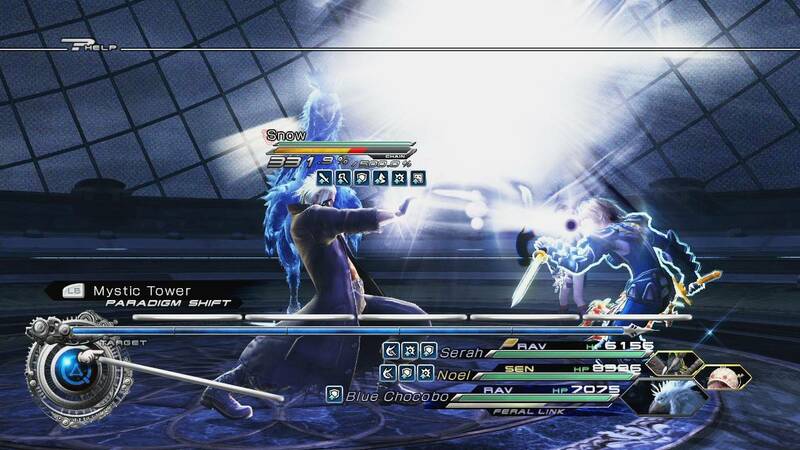 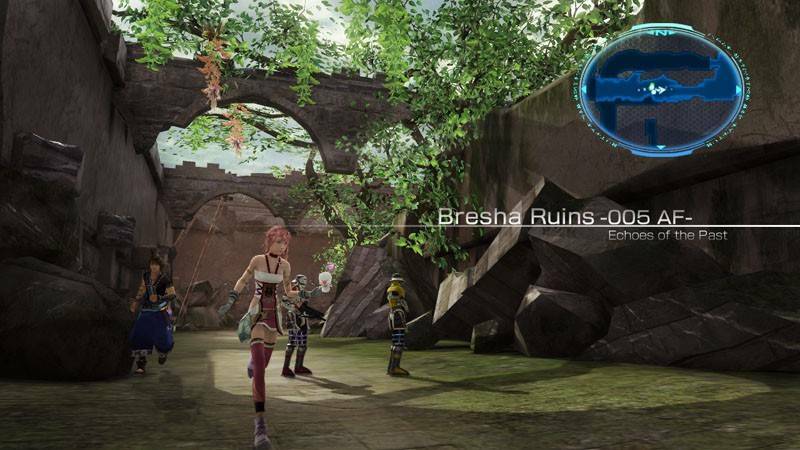 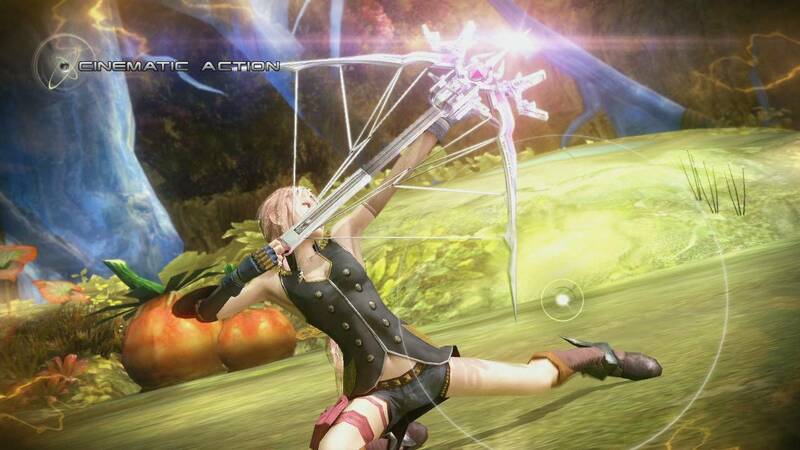 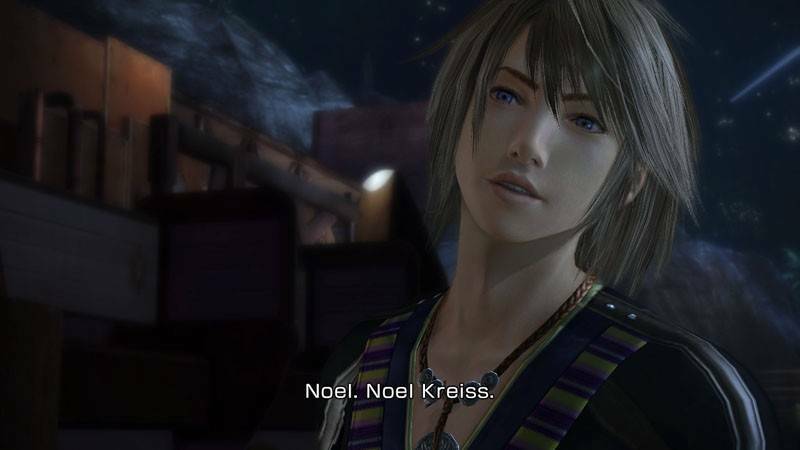 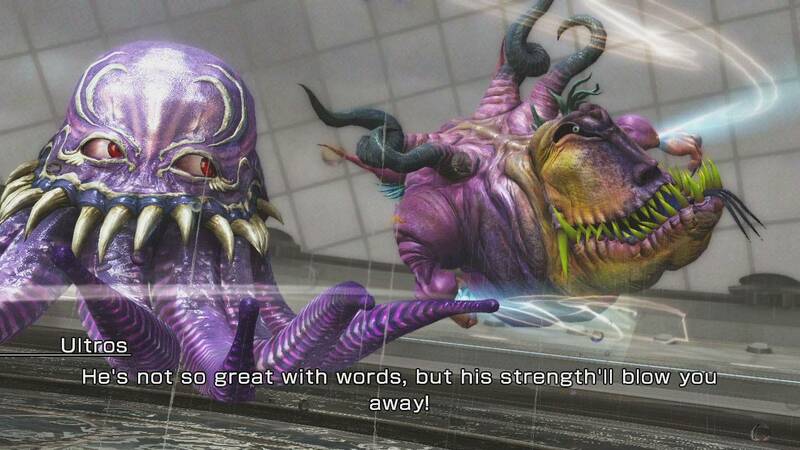 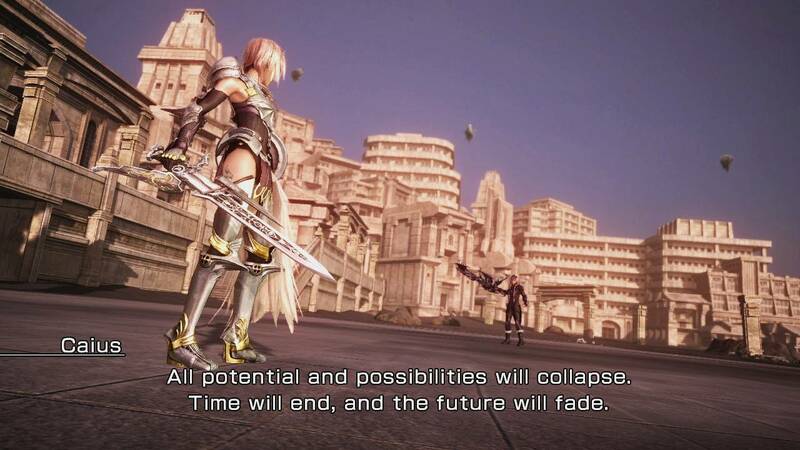 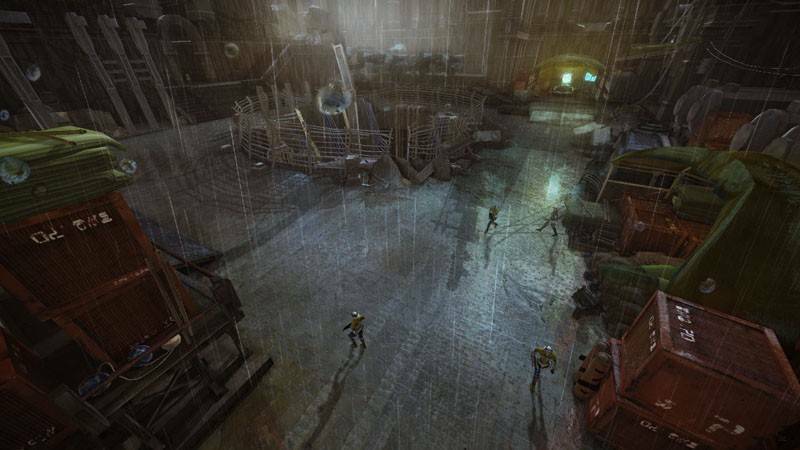 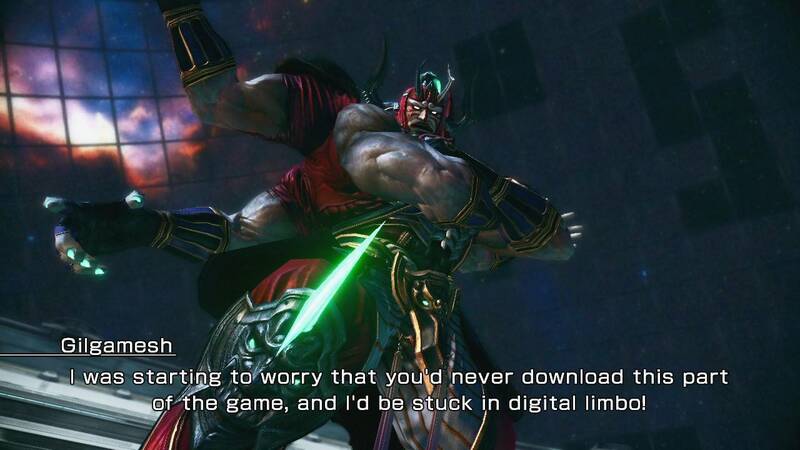 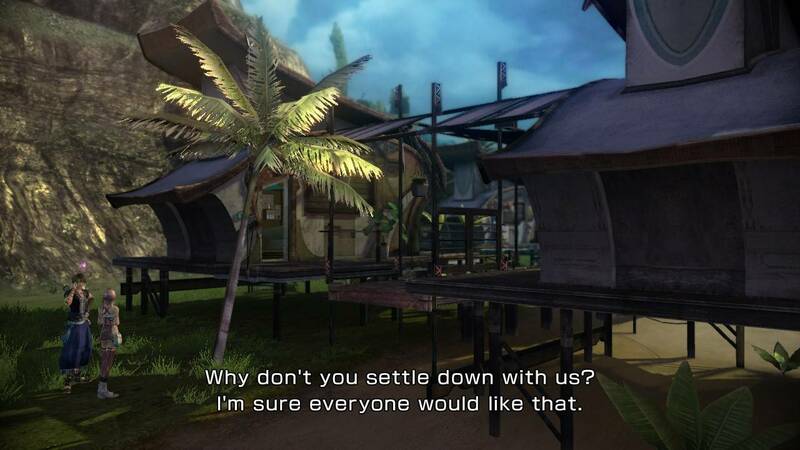 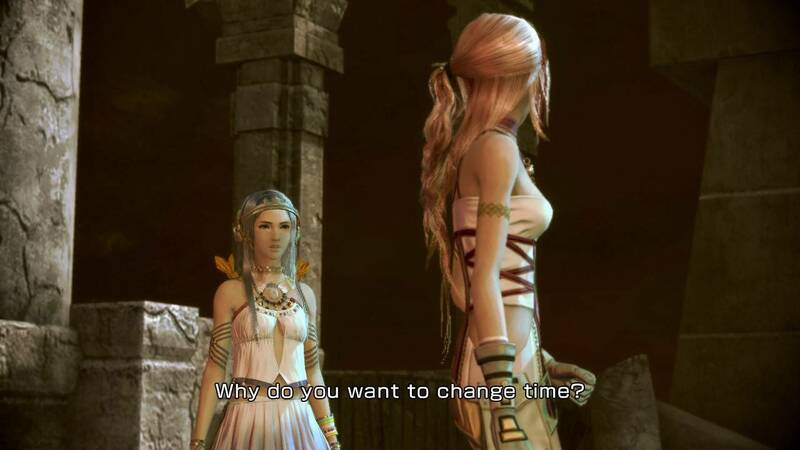 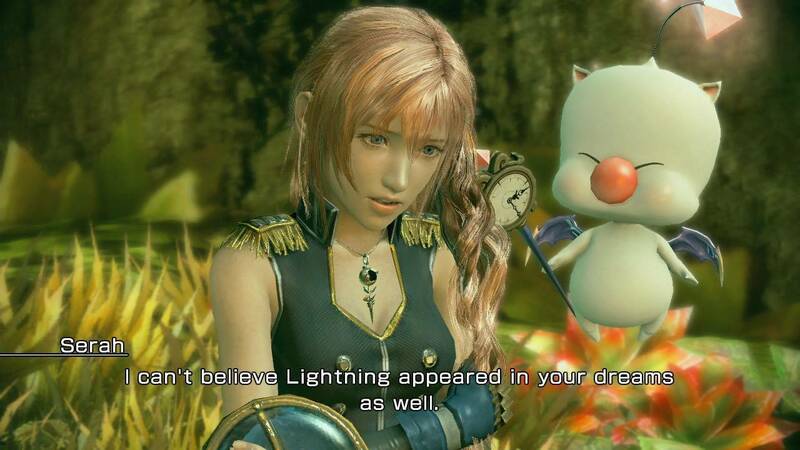 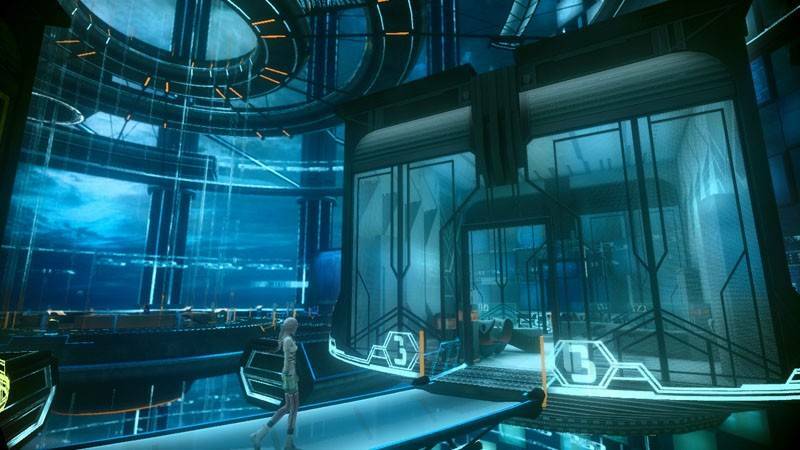 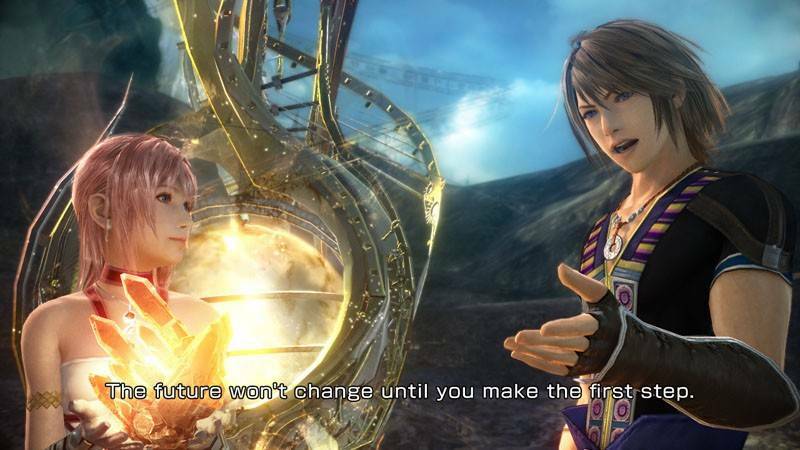 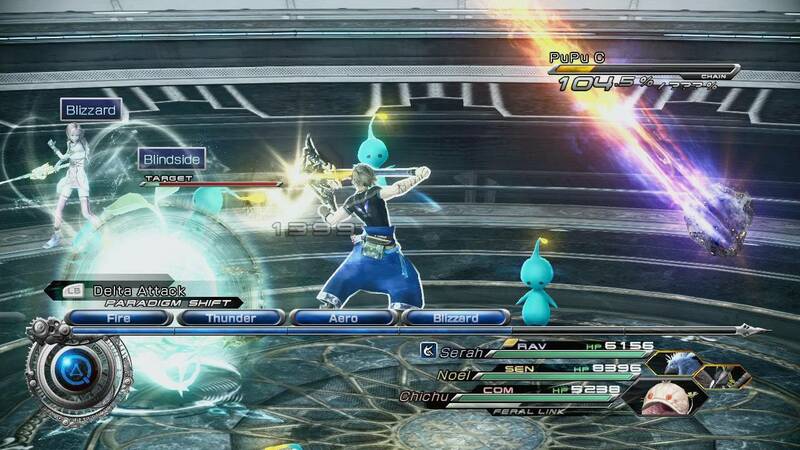 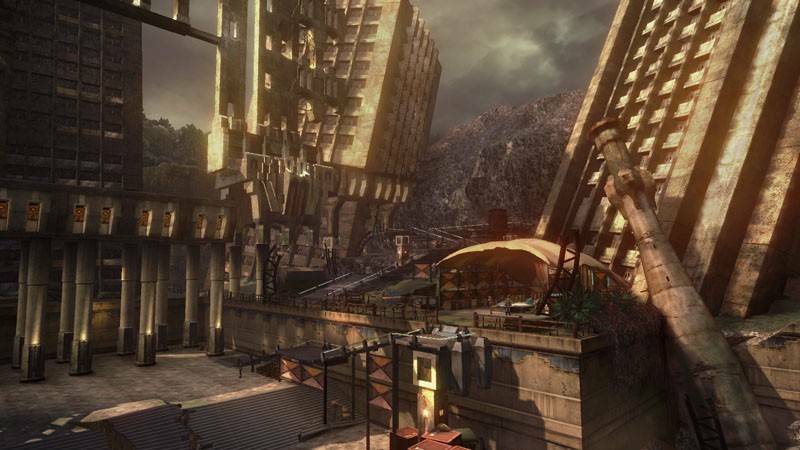 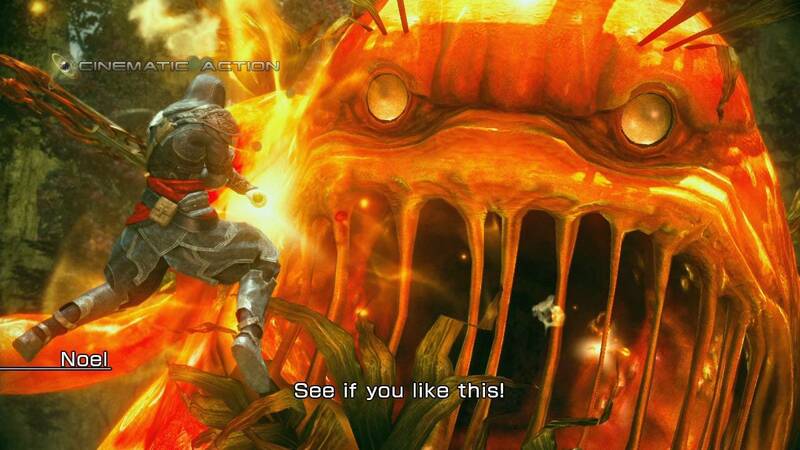 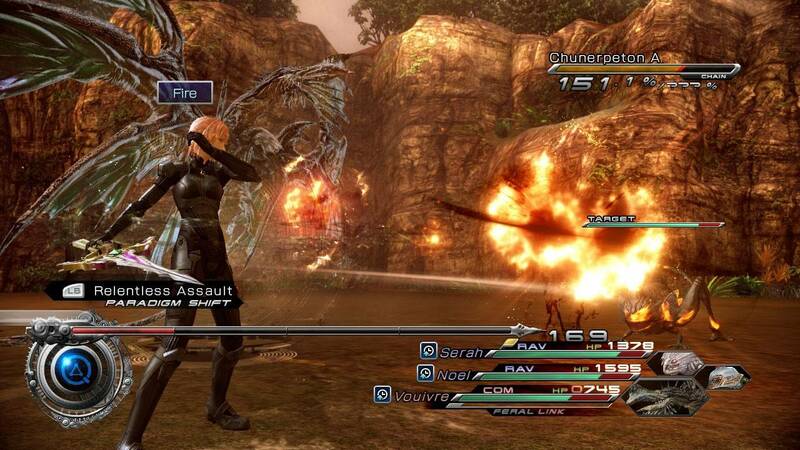 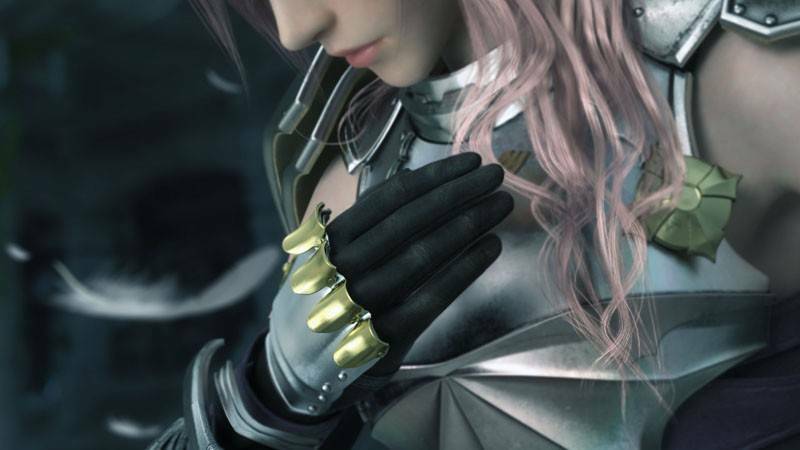 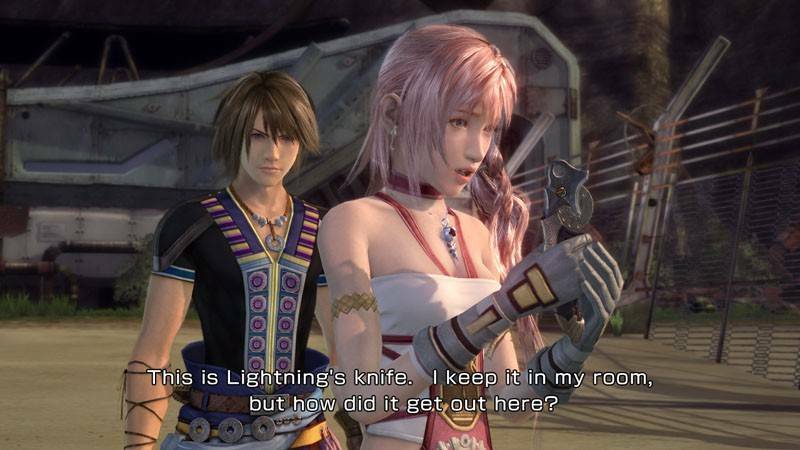 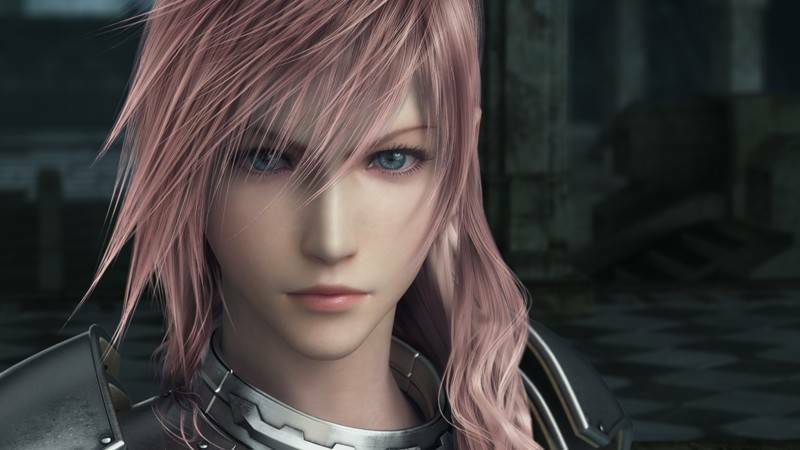 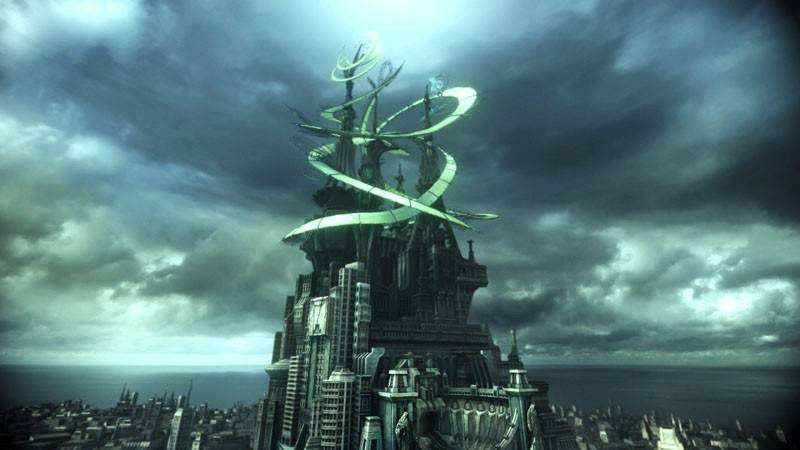 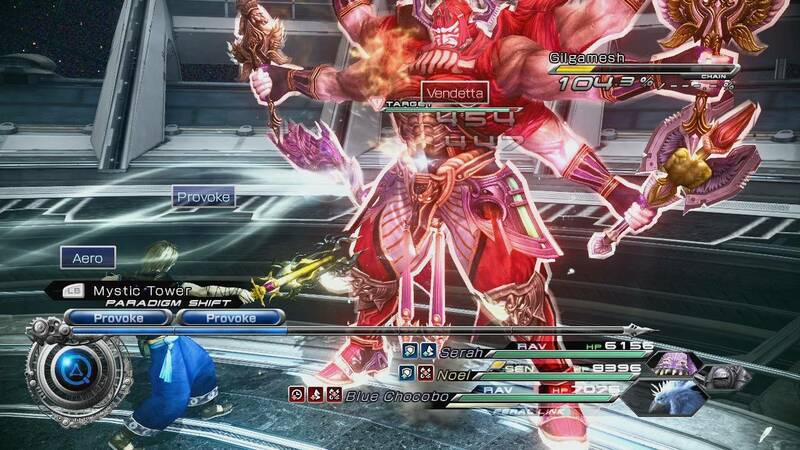 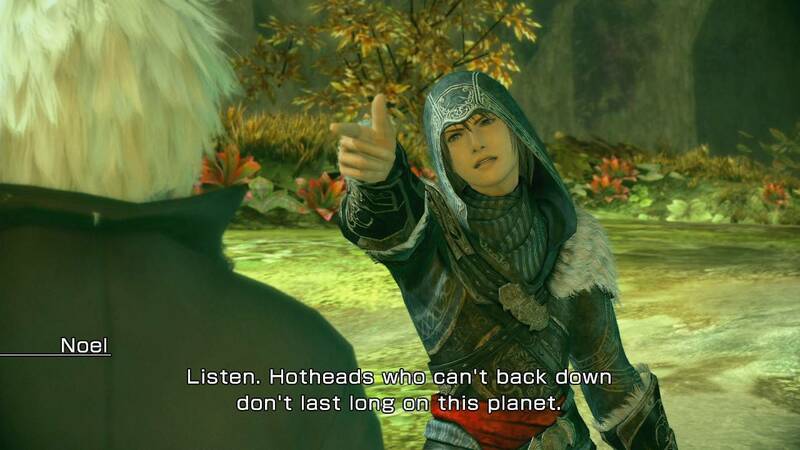 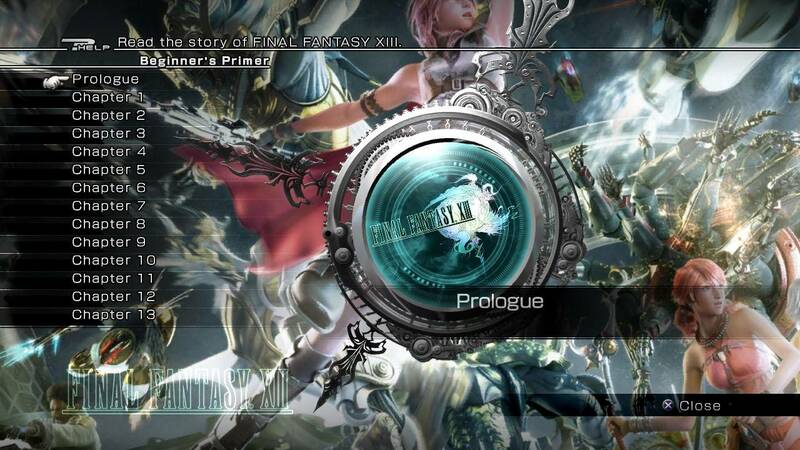 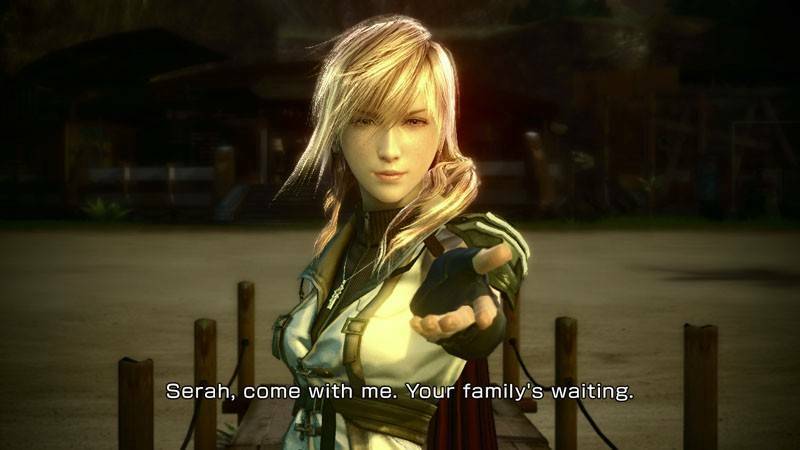 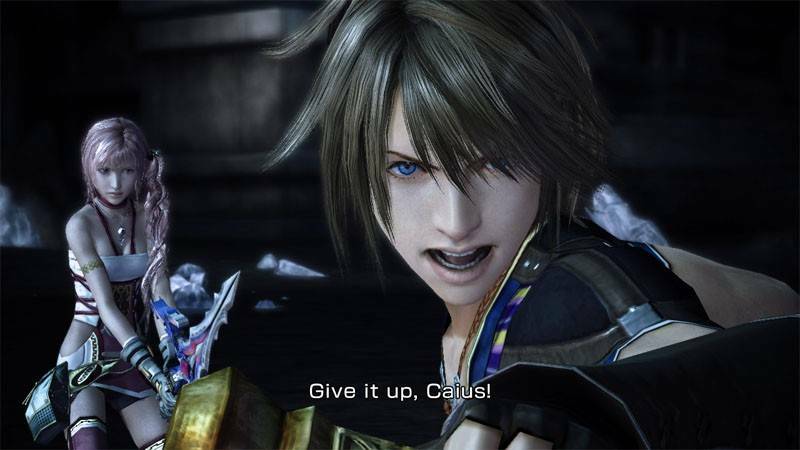 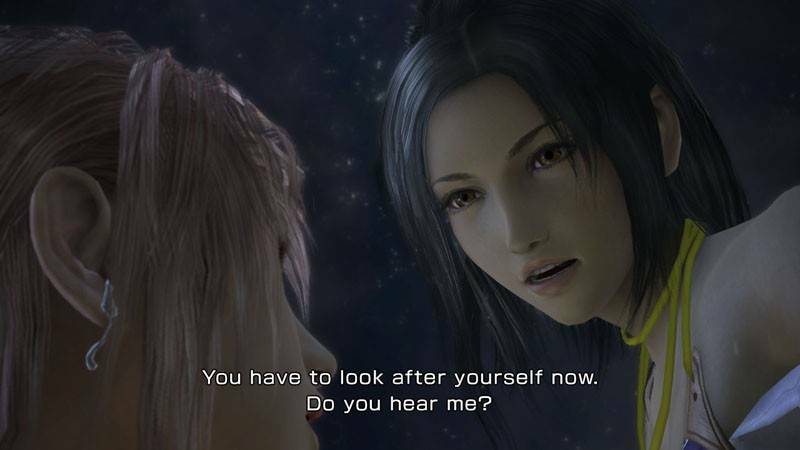 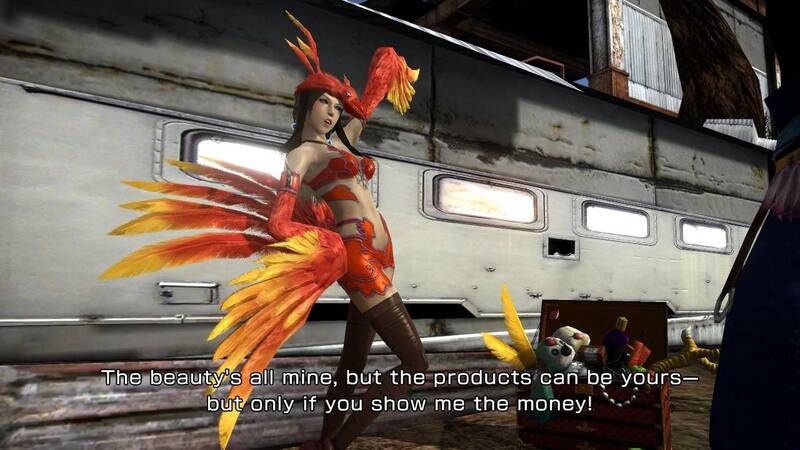 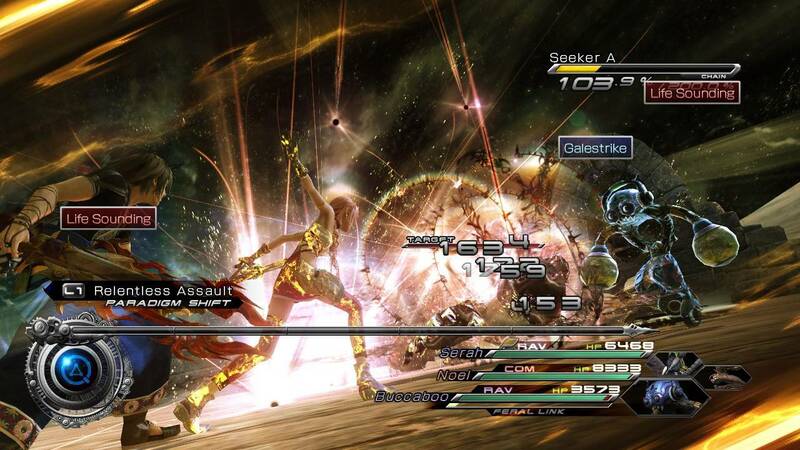 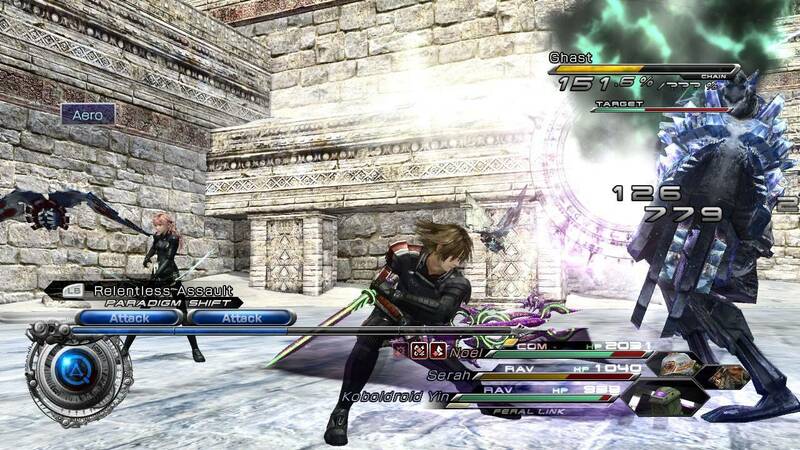 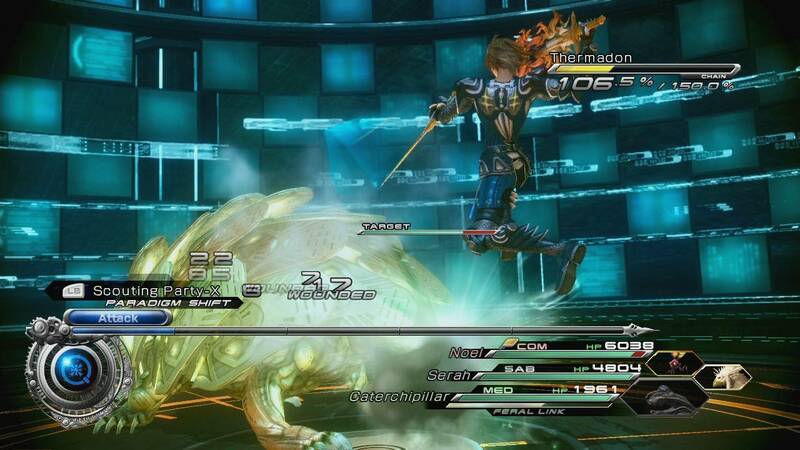 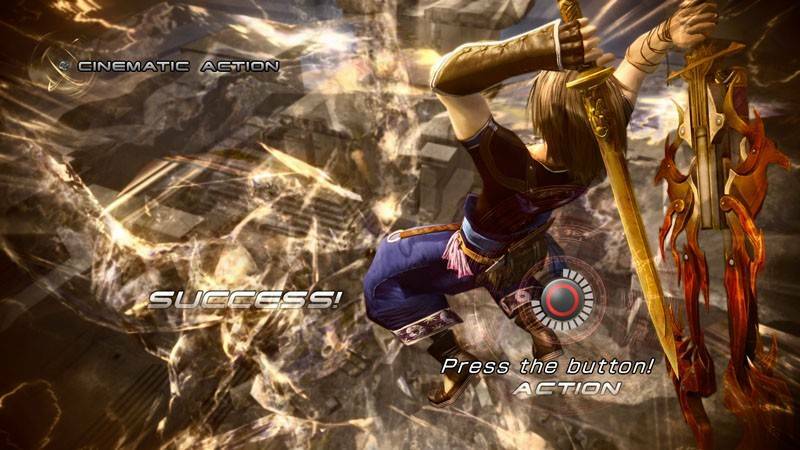 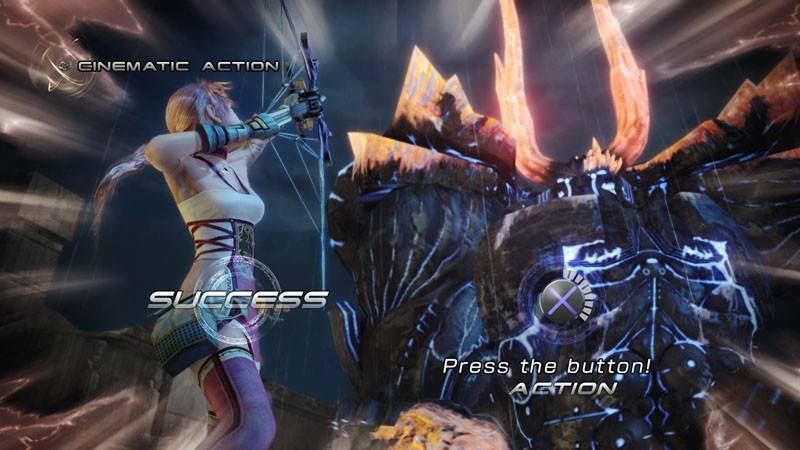 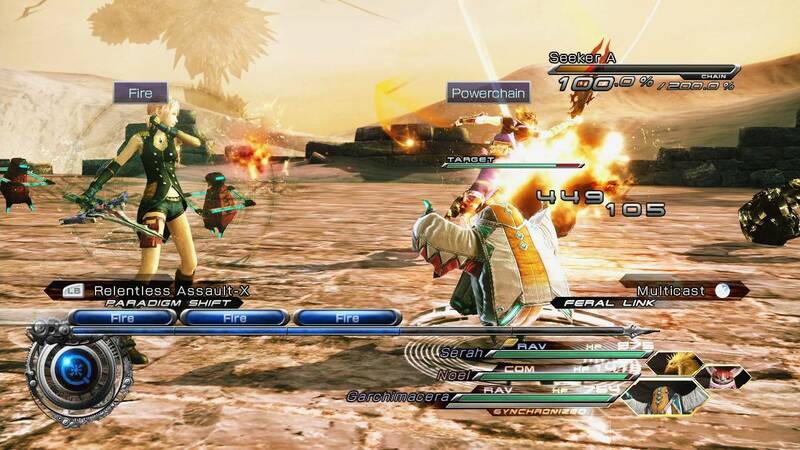 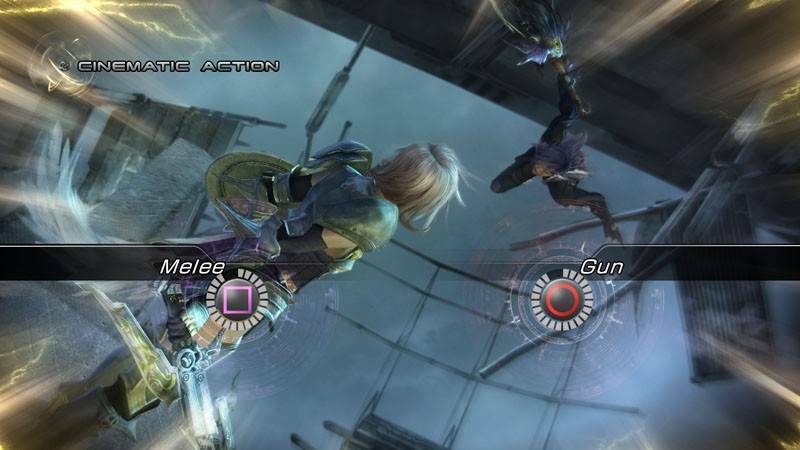 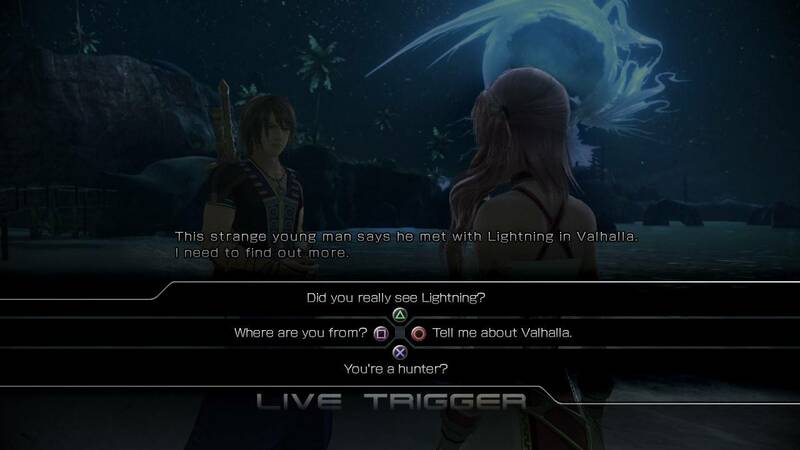 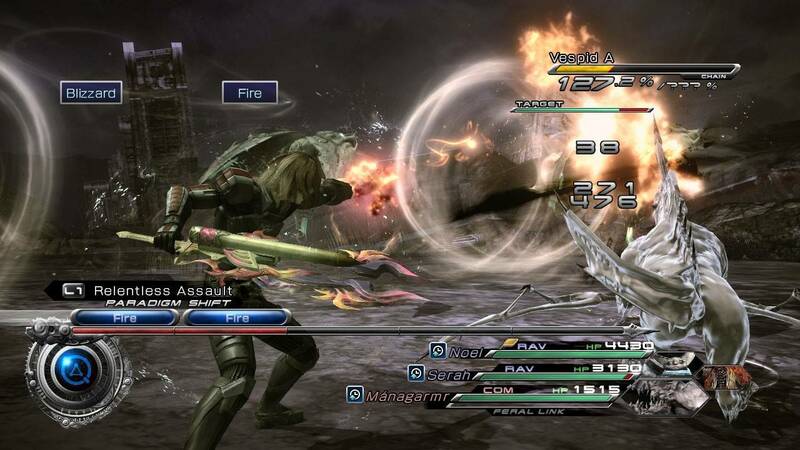 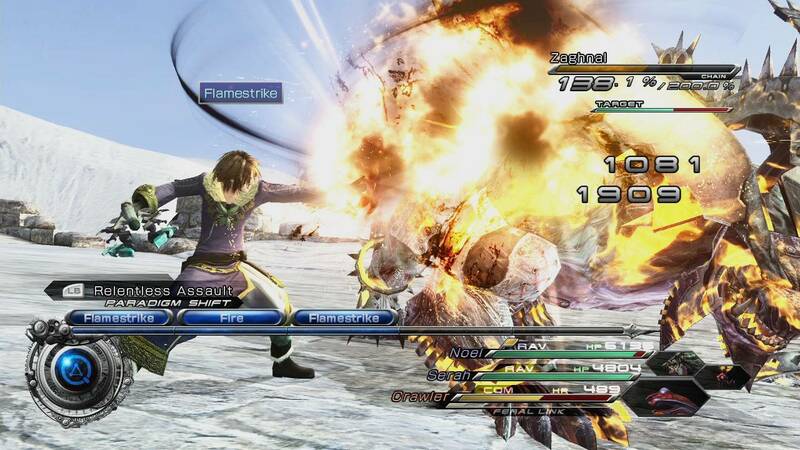 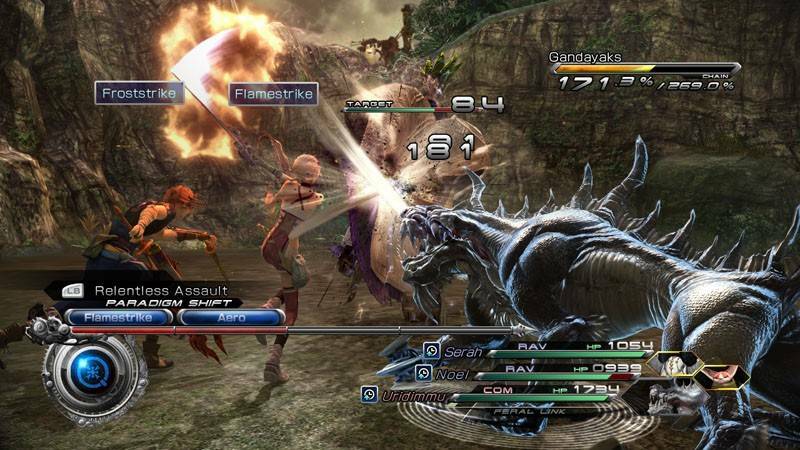 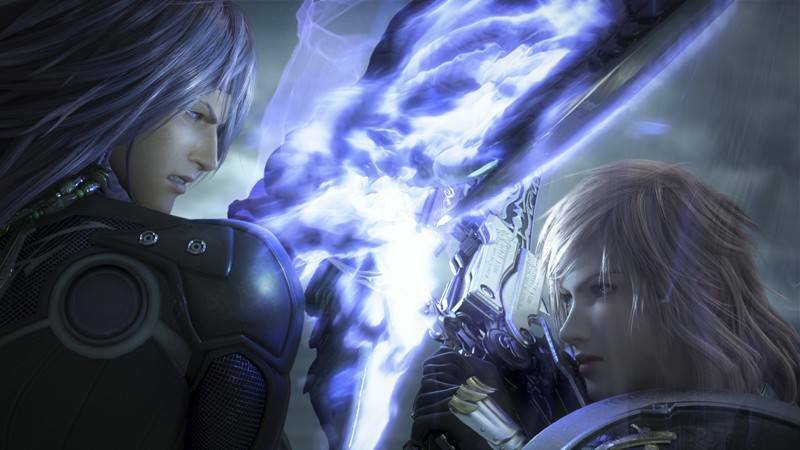 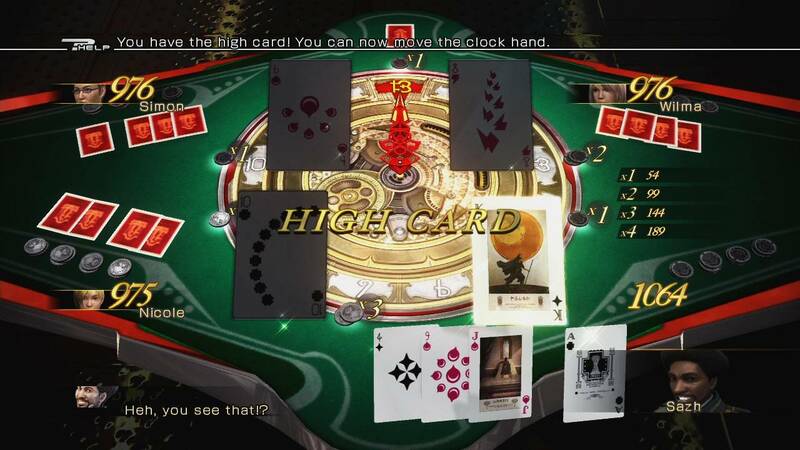 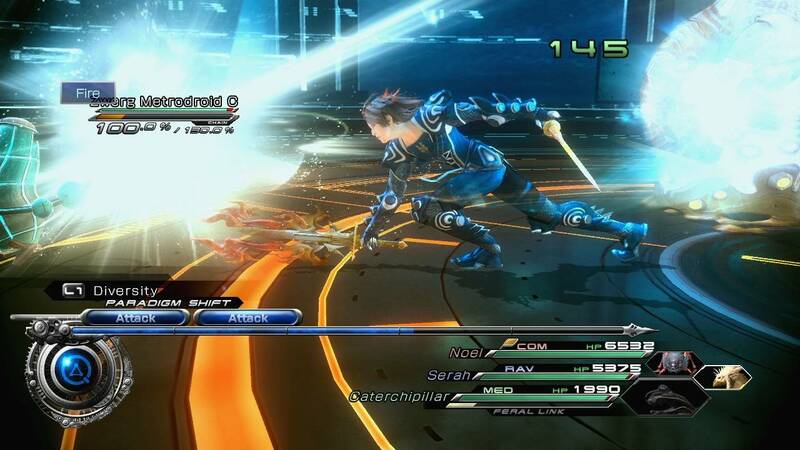 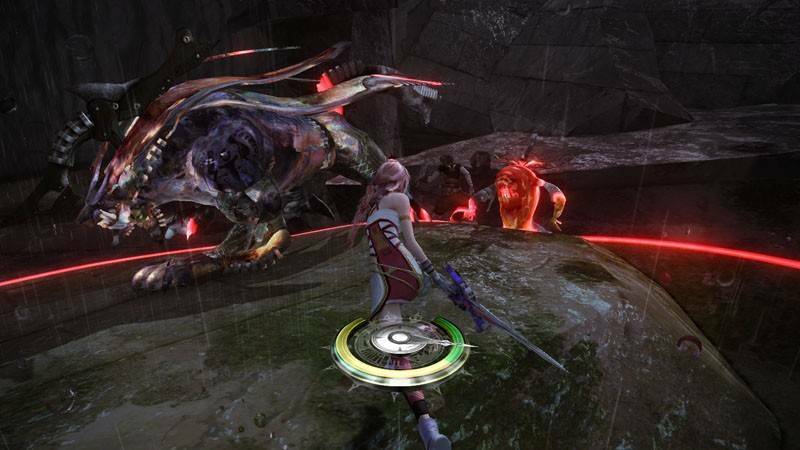 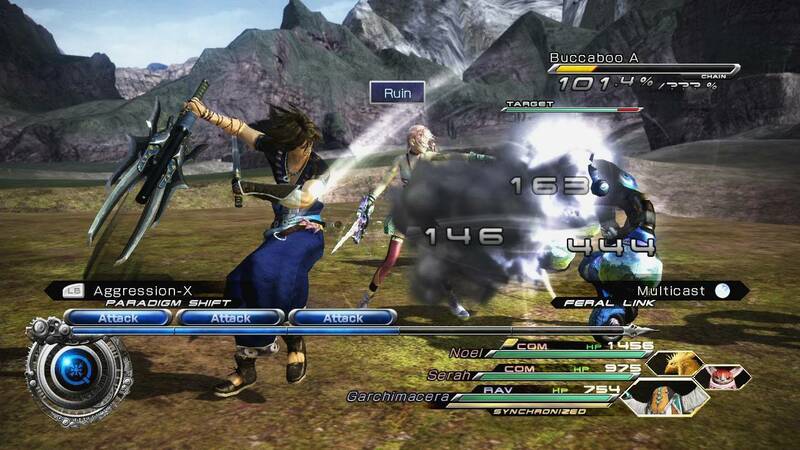 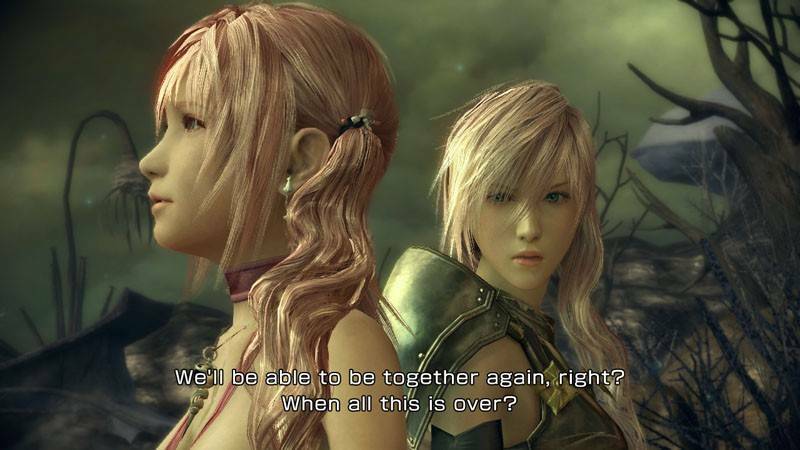 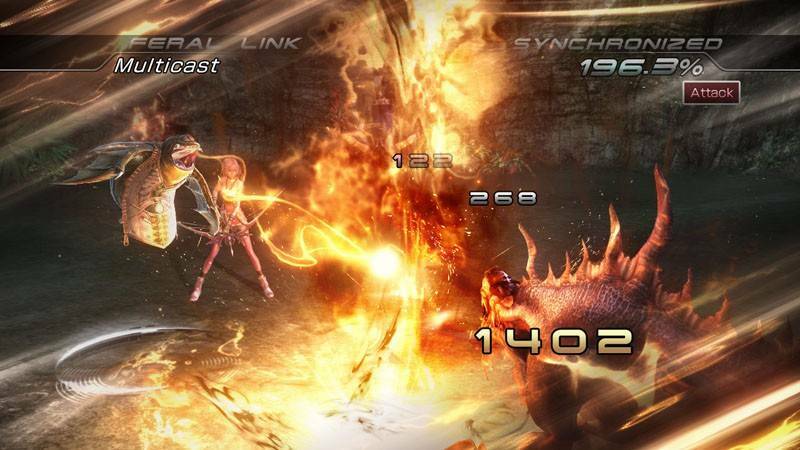 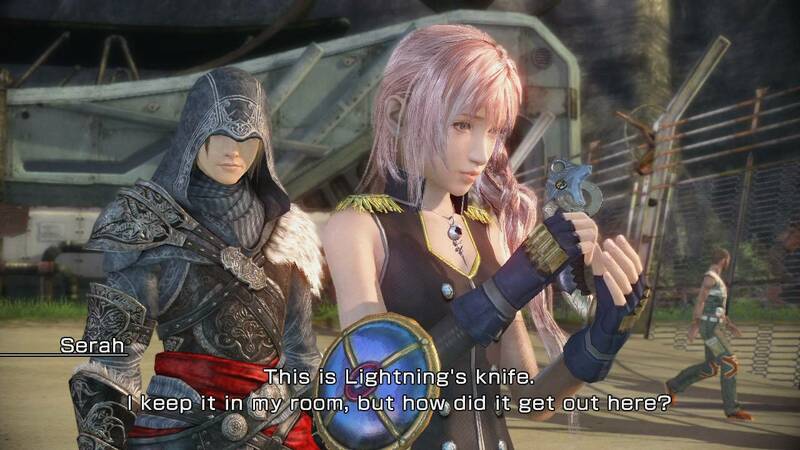 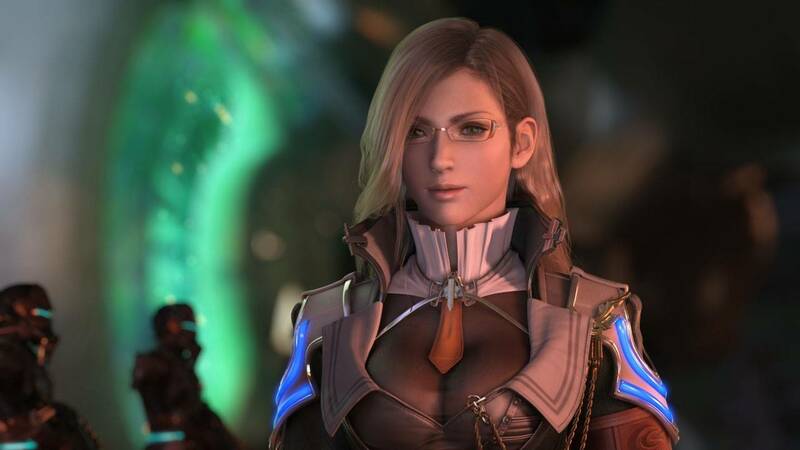 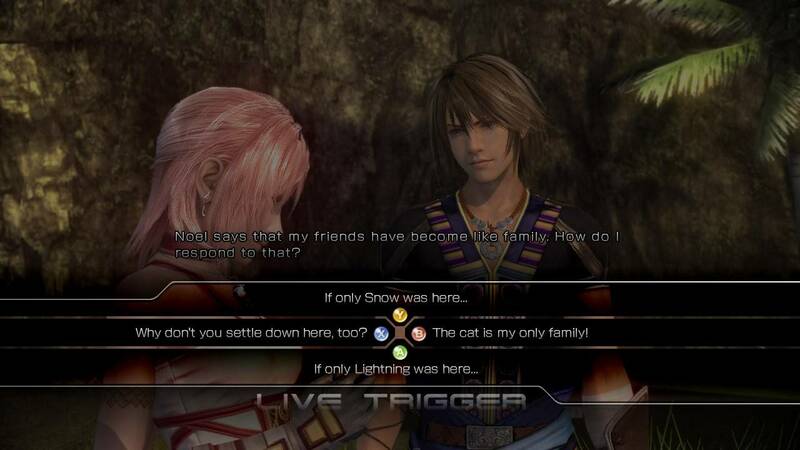 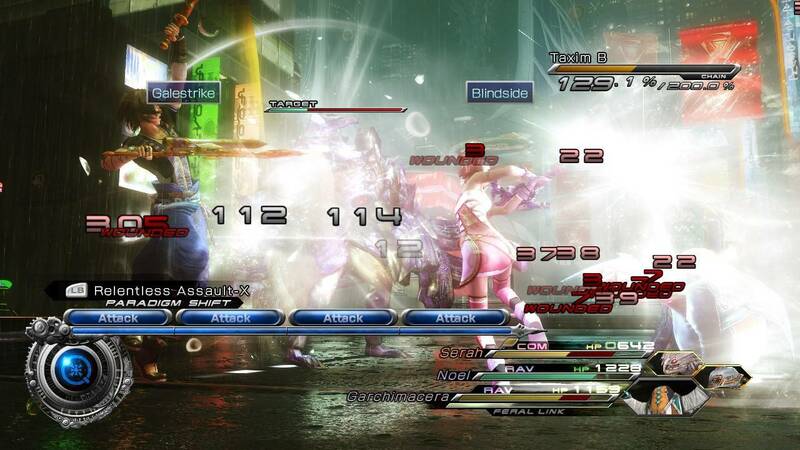 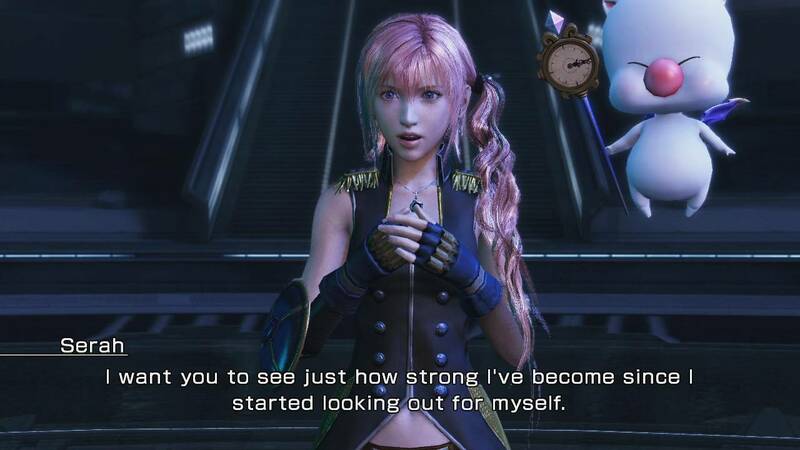 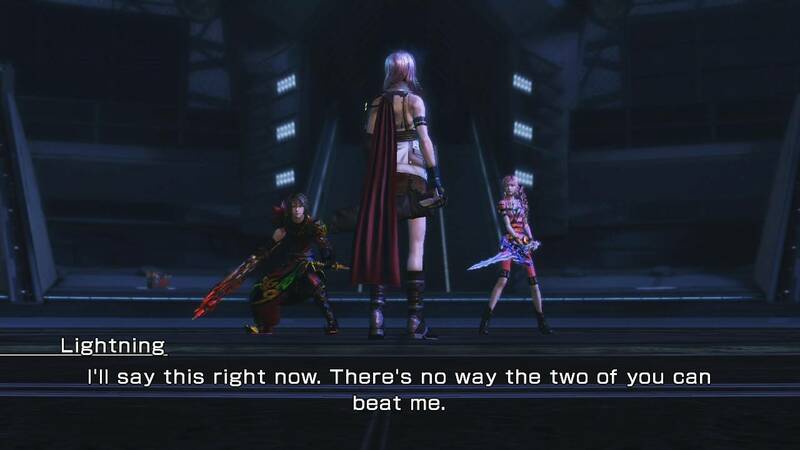 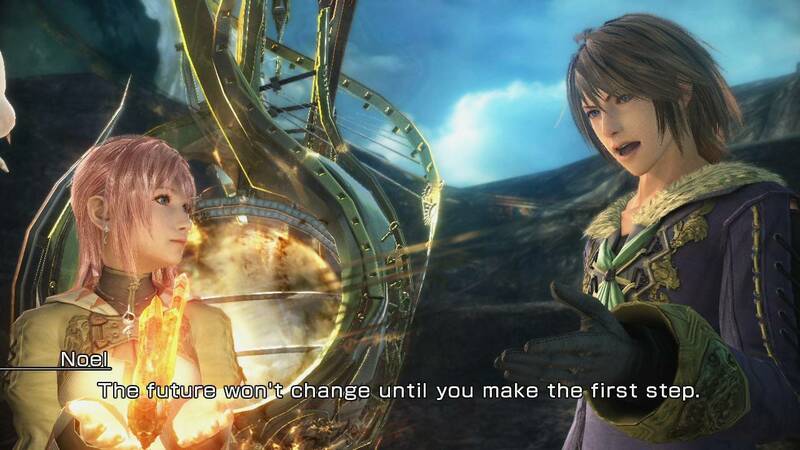 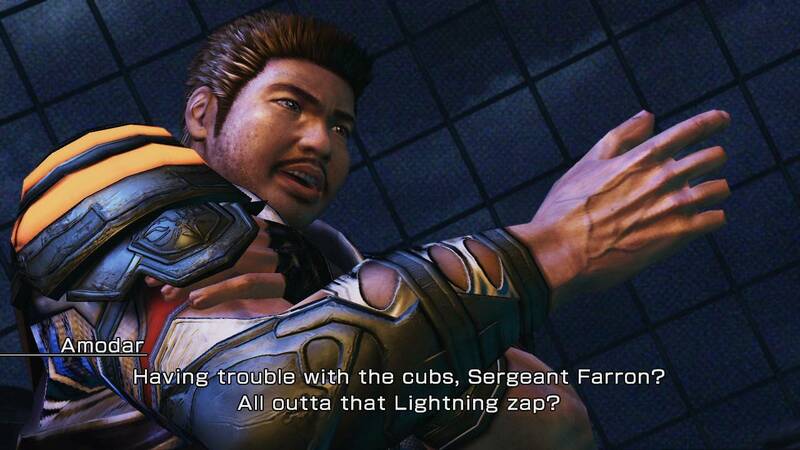 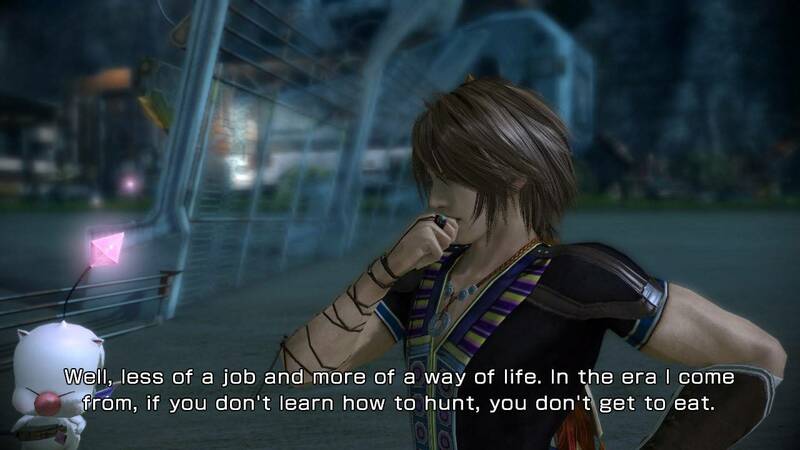 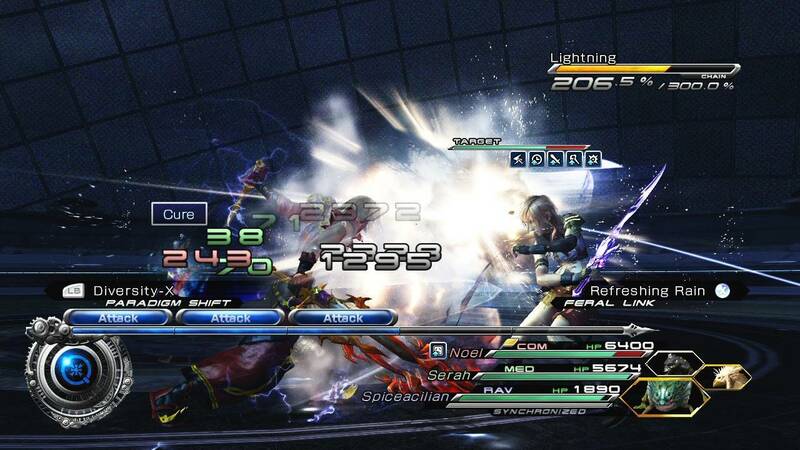 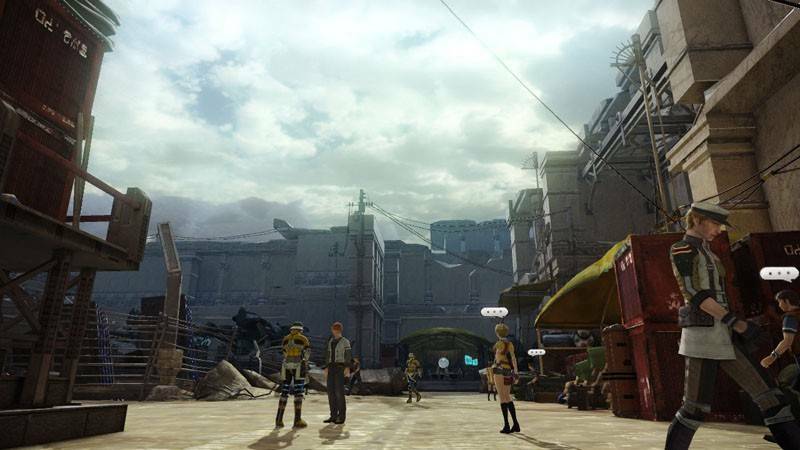 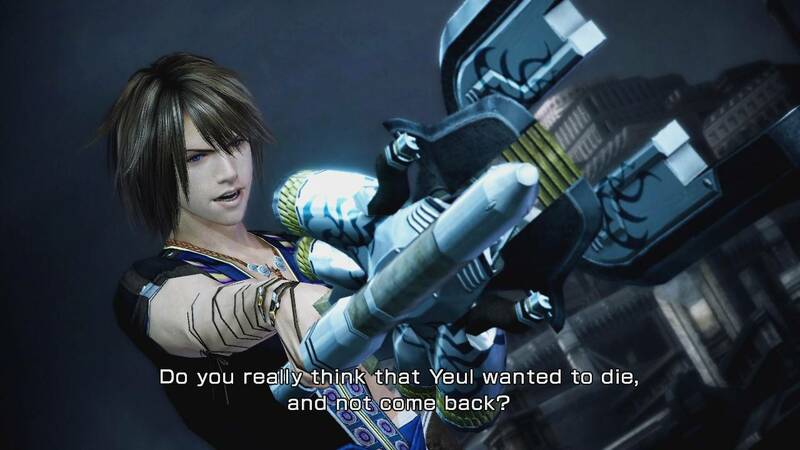 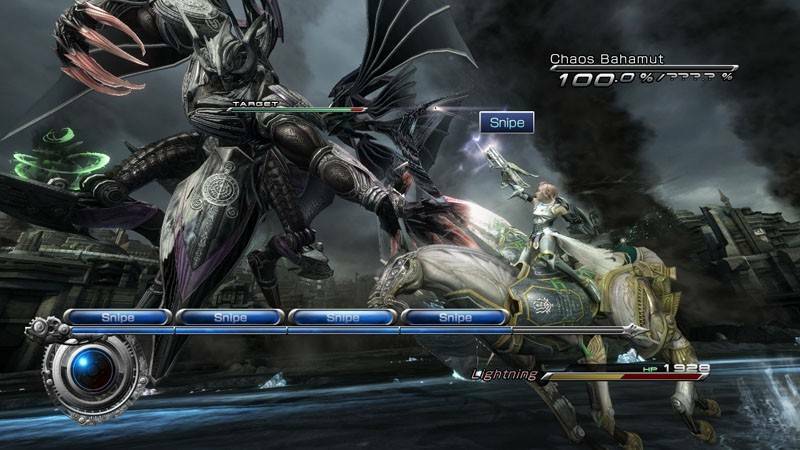 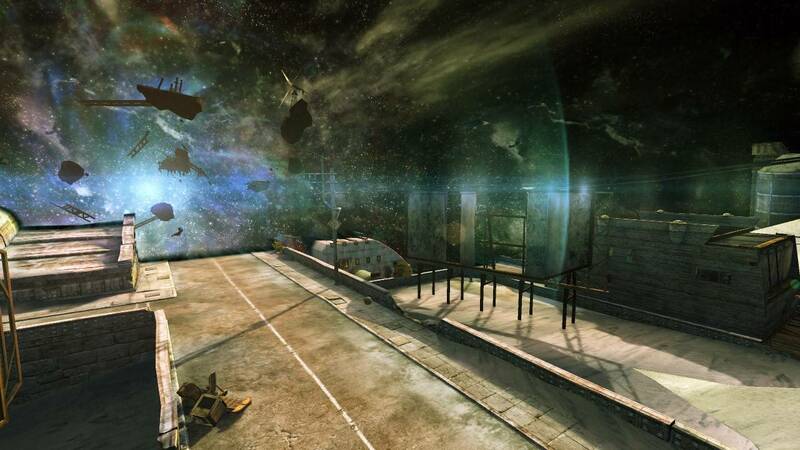 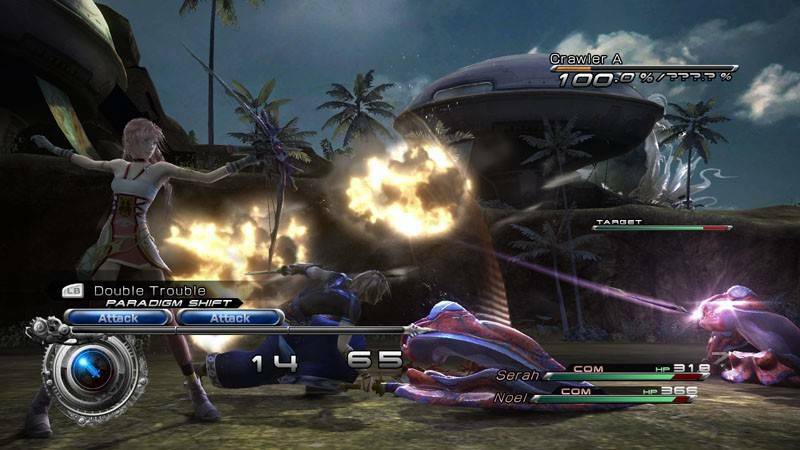 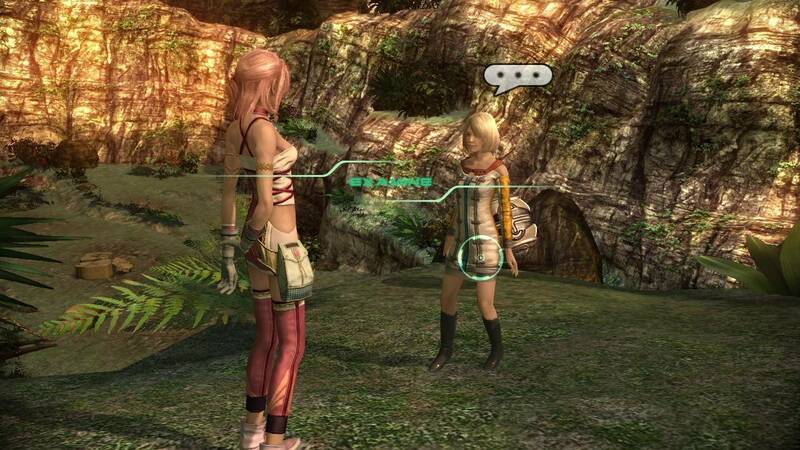 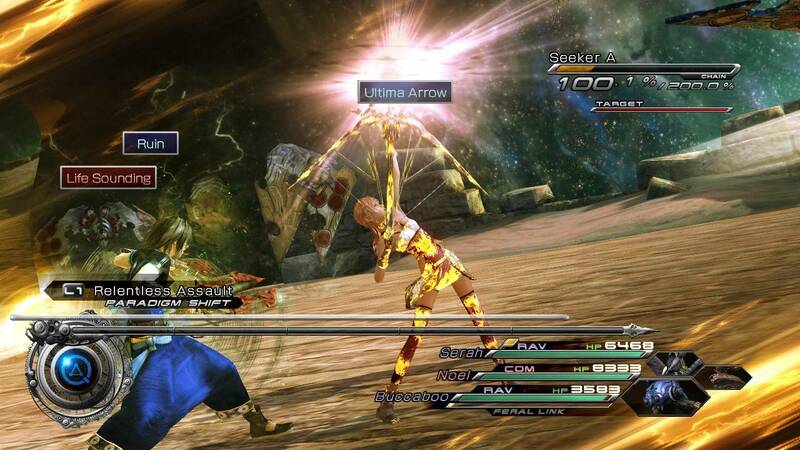 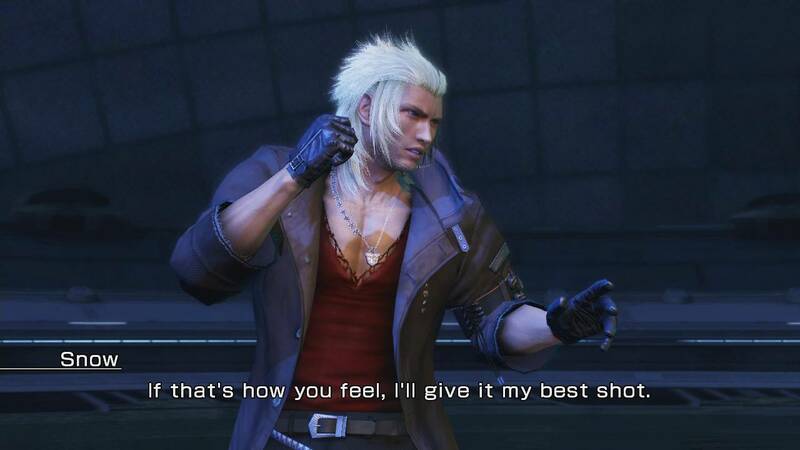 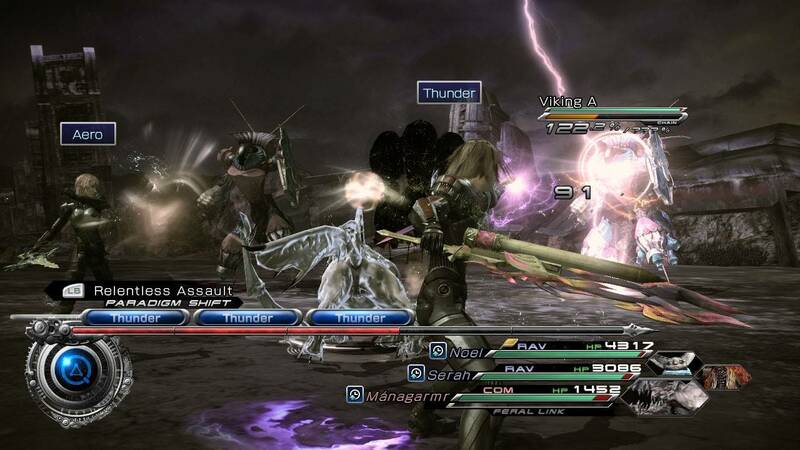 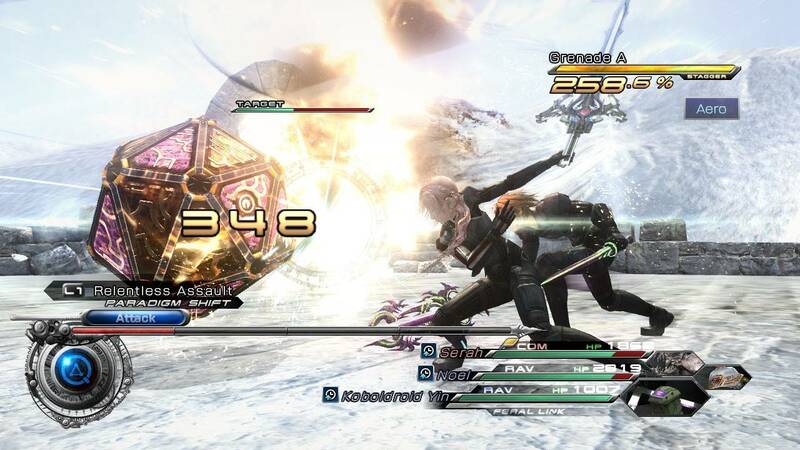 The demo started out with a voice-over from Lightning, the main protagonist from the first title. 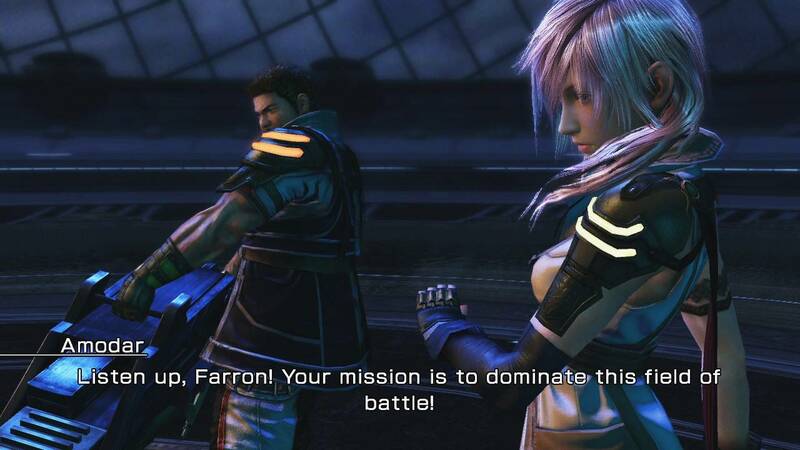 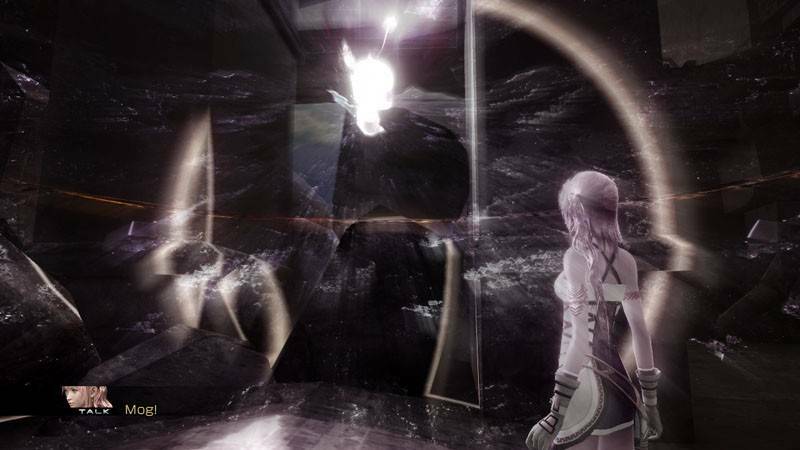 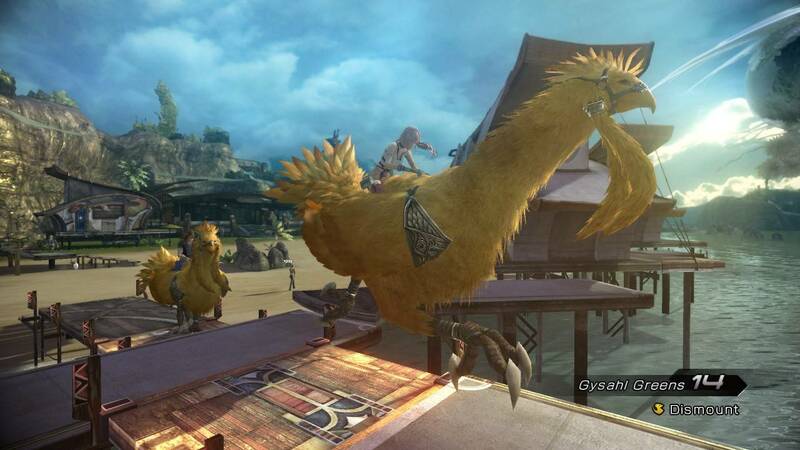 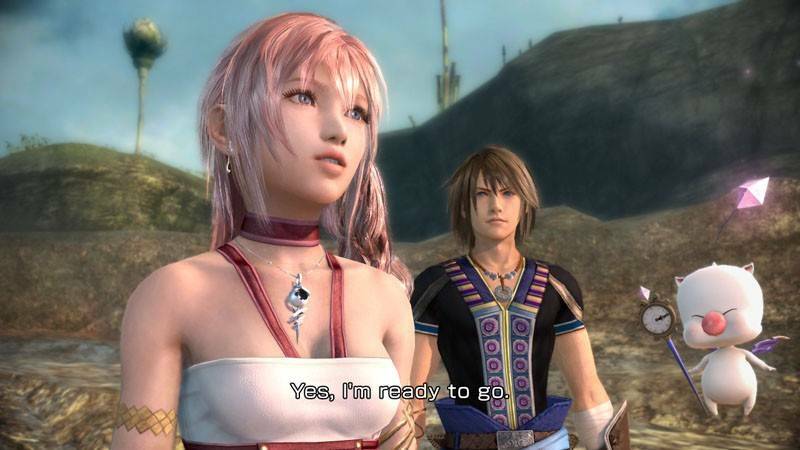 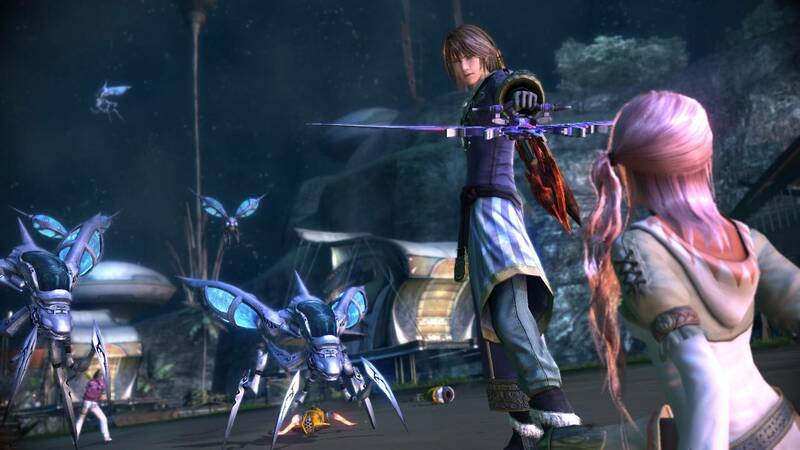 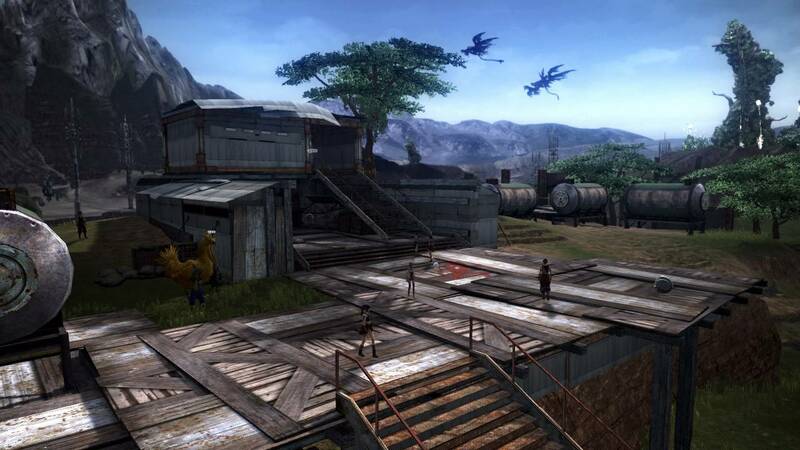 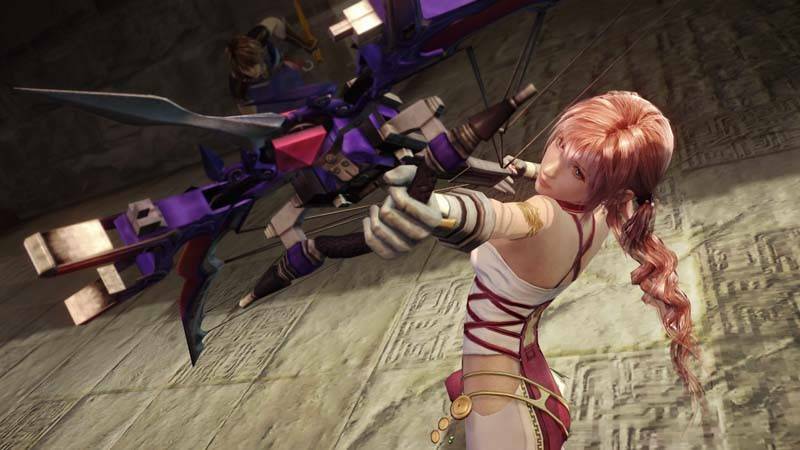 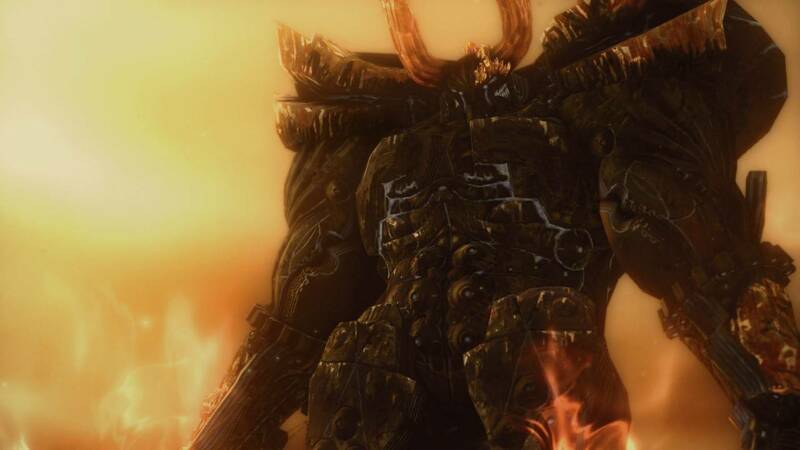 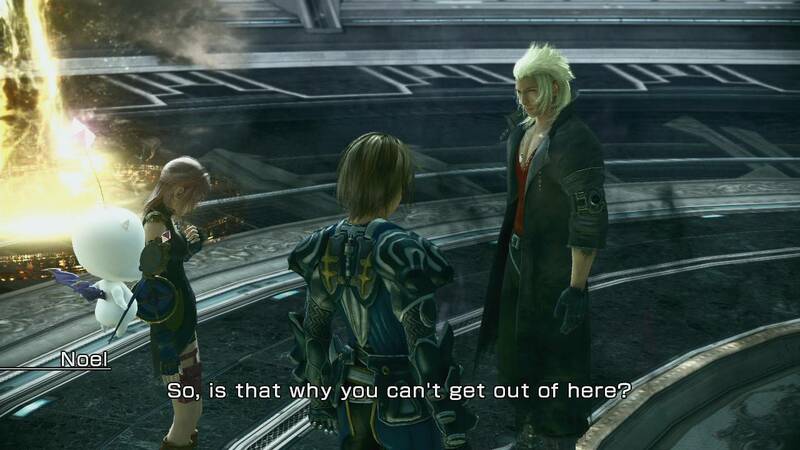 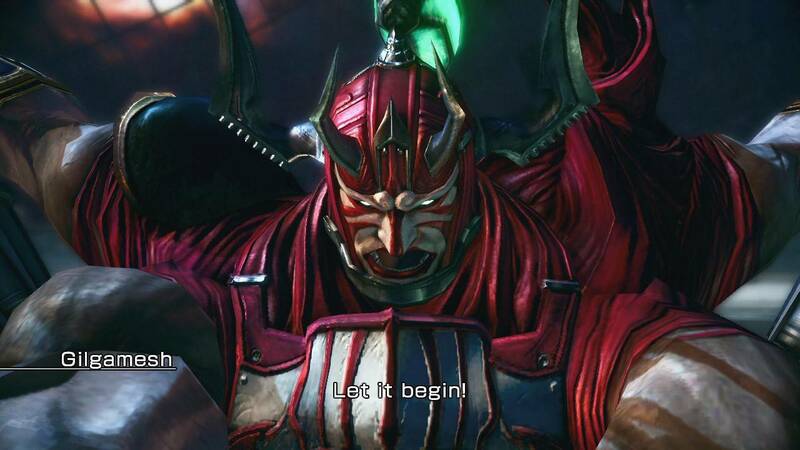 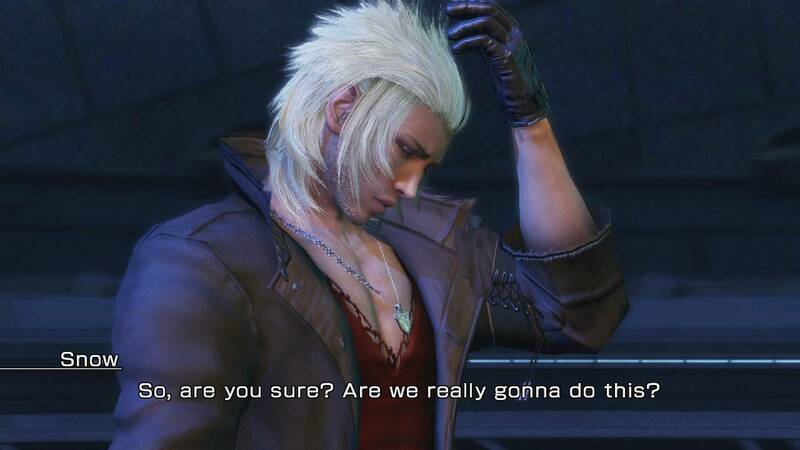 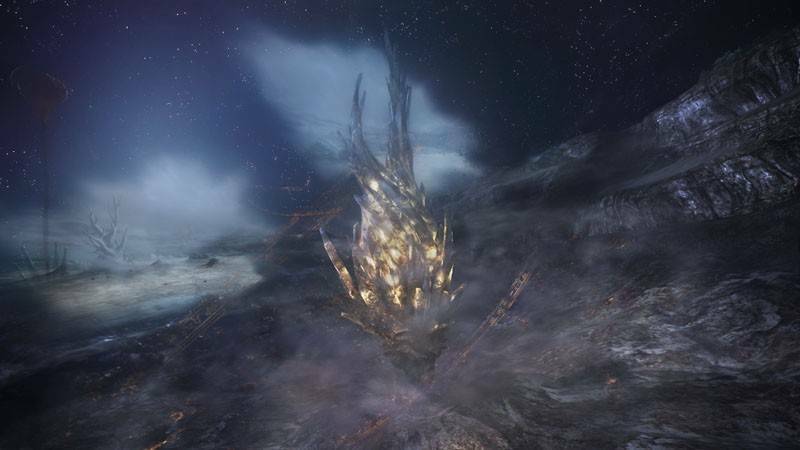 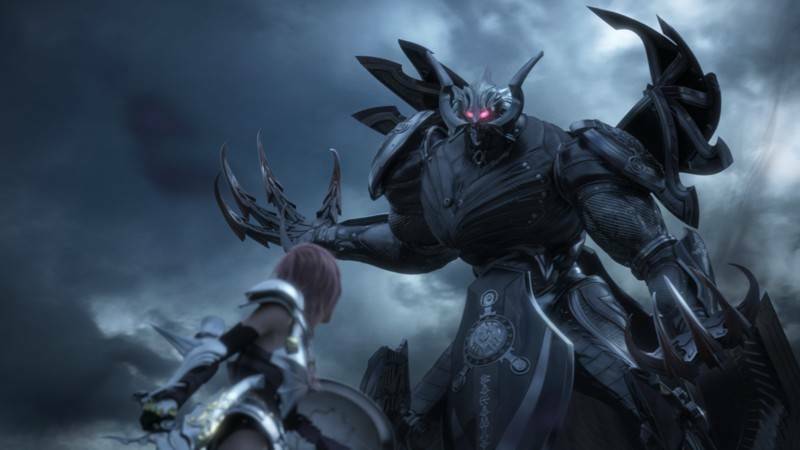 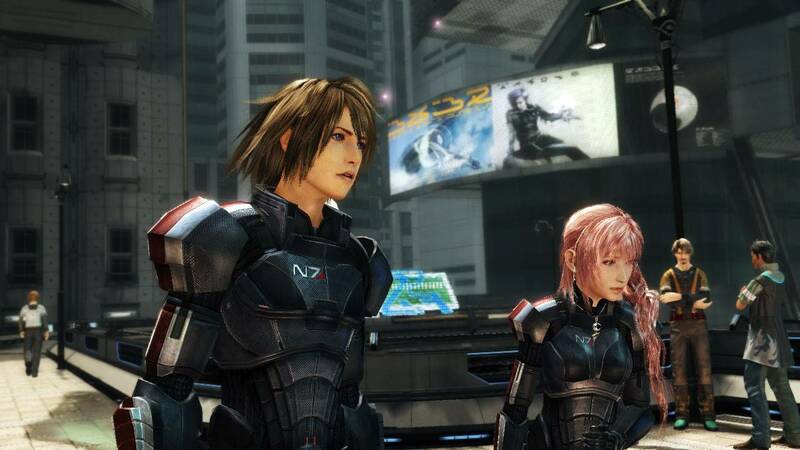 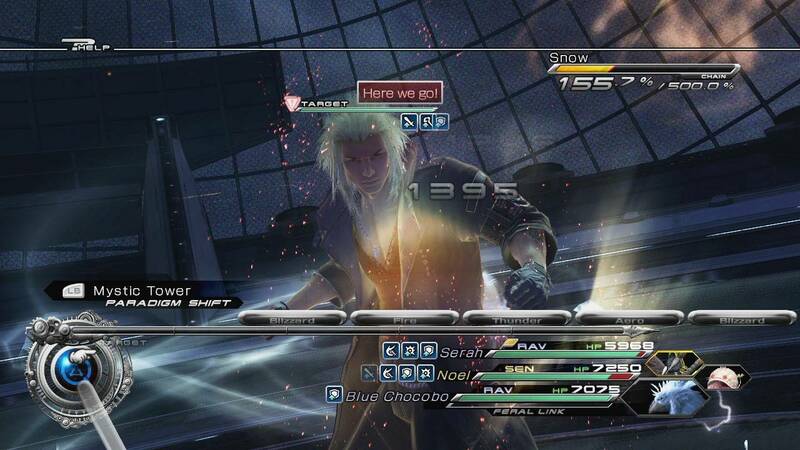 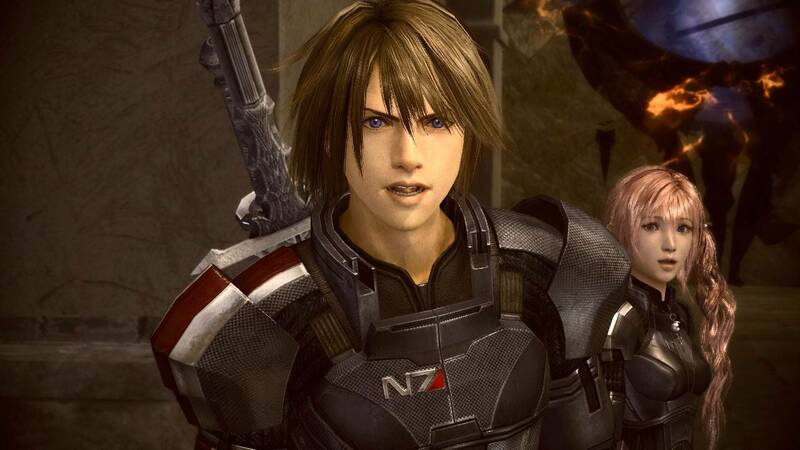 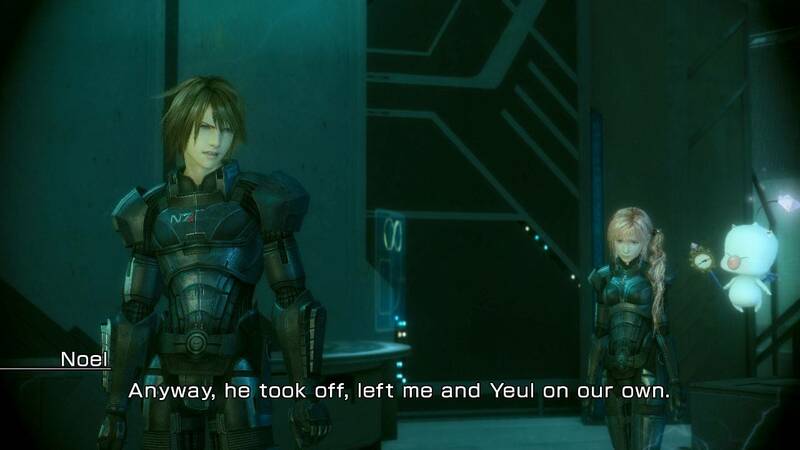 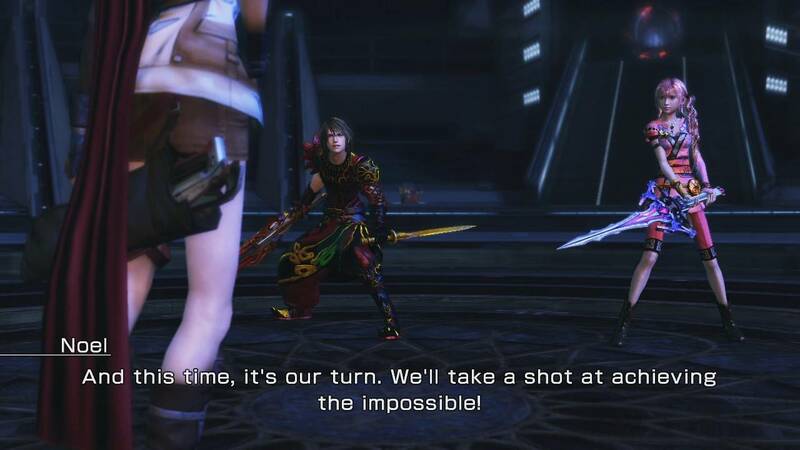 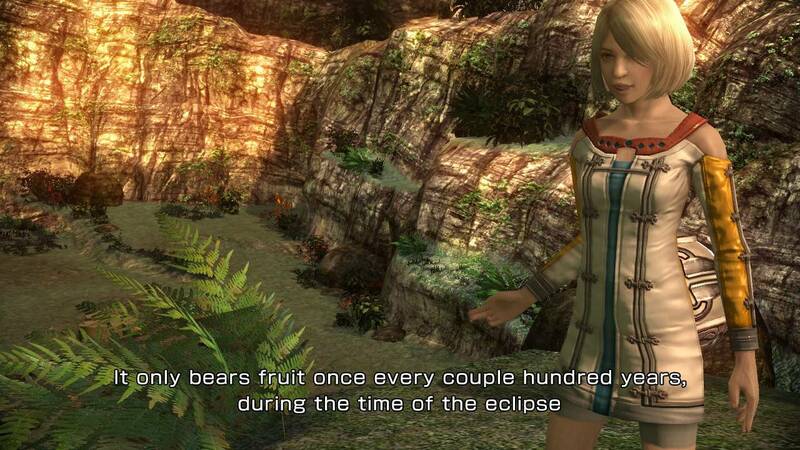 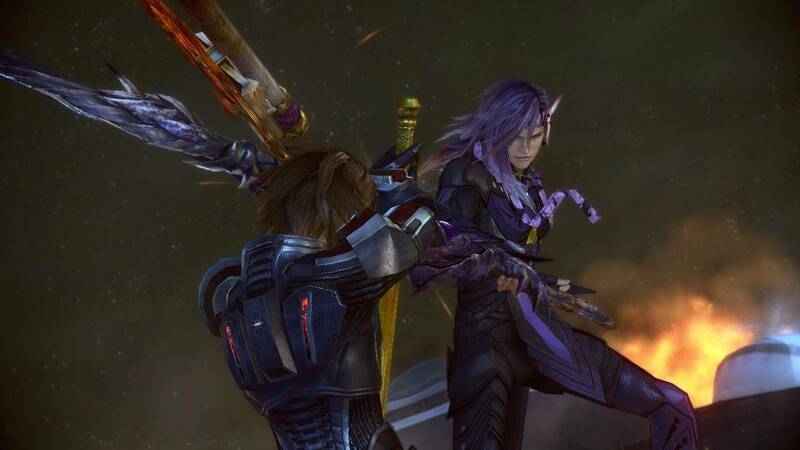 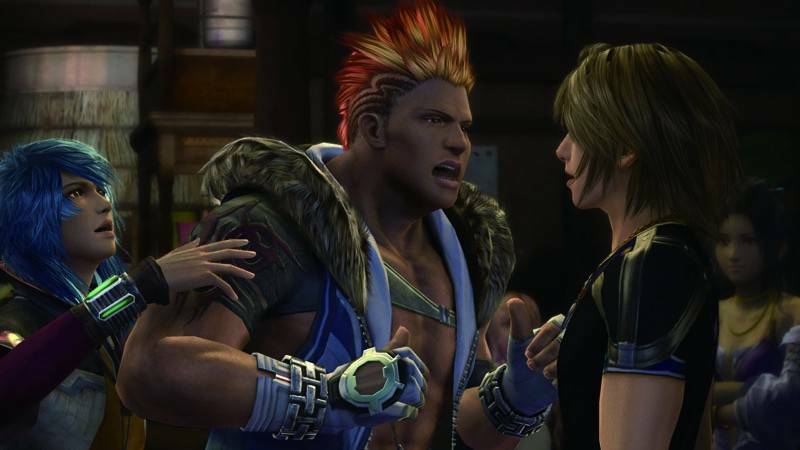 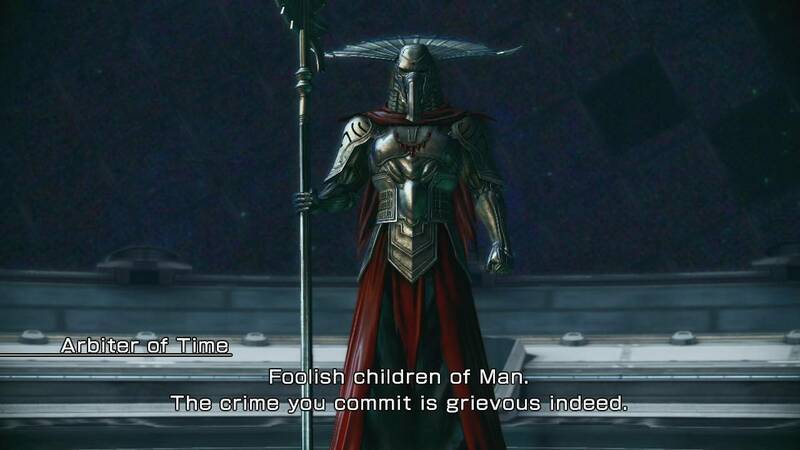 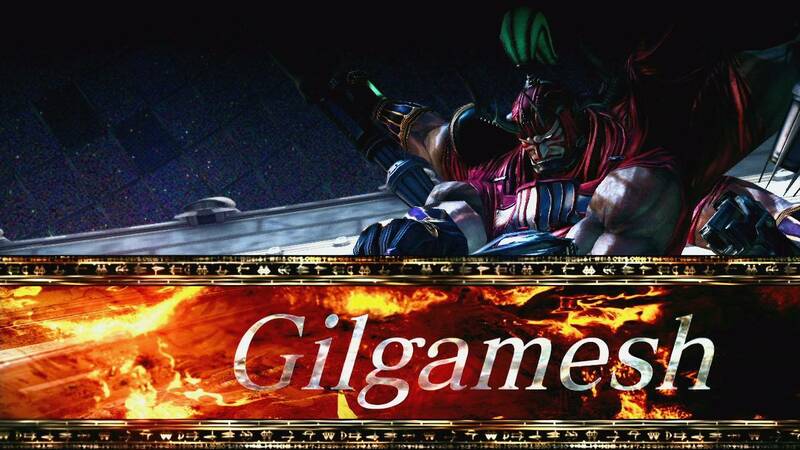 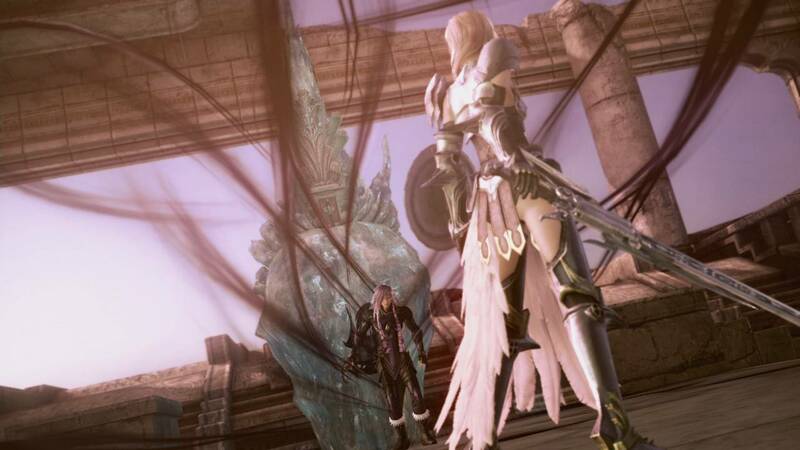 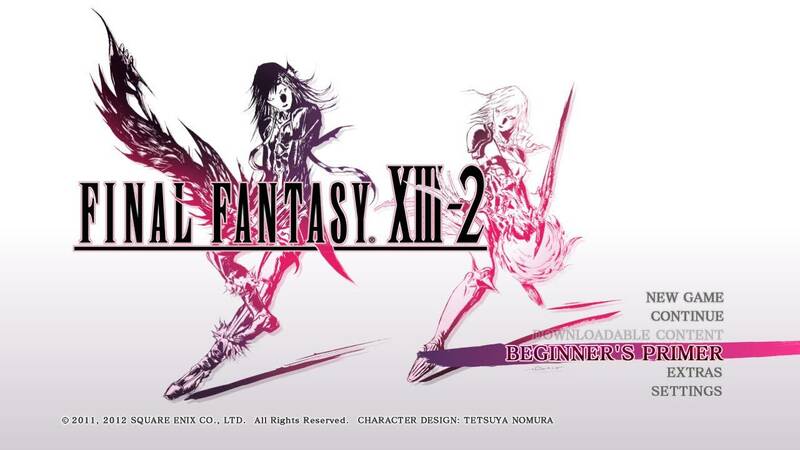 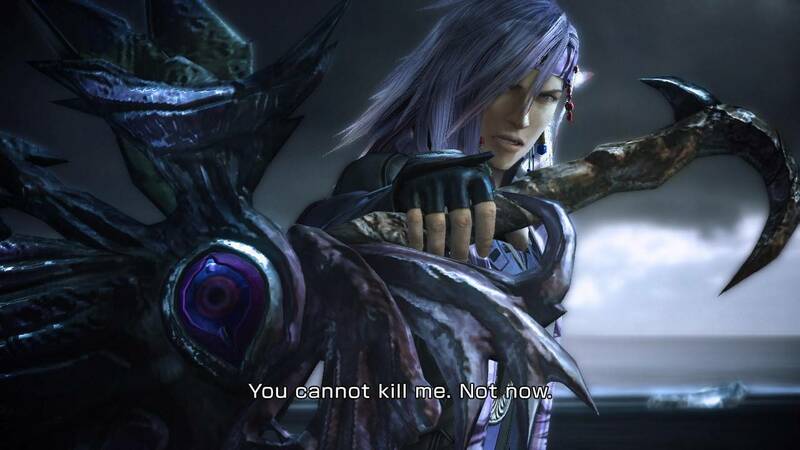 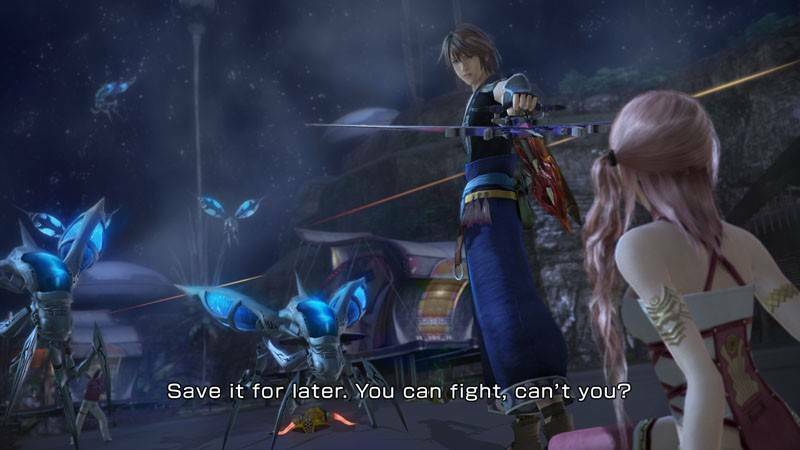 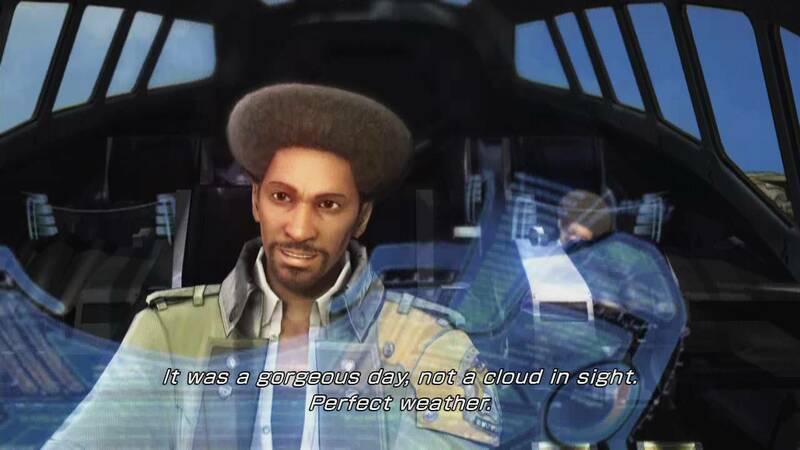 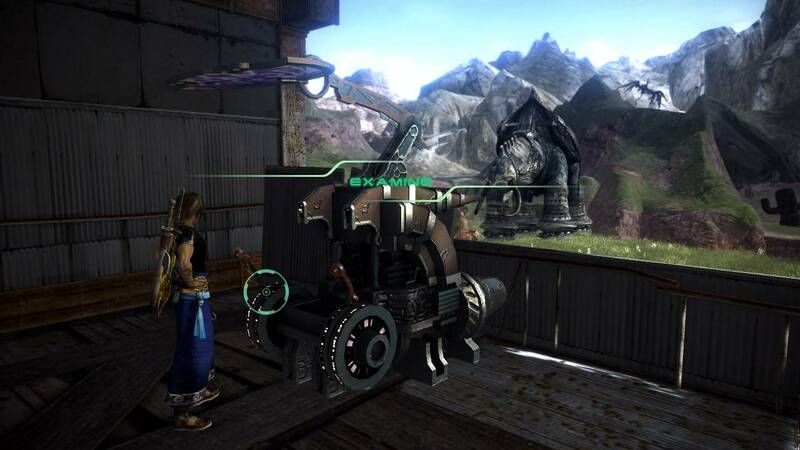 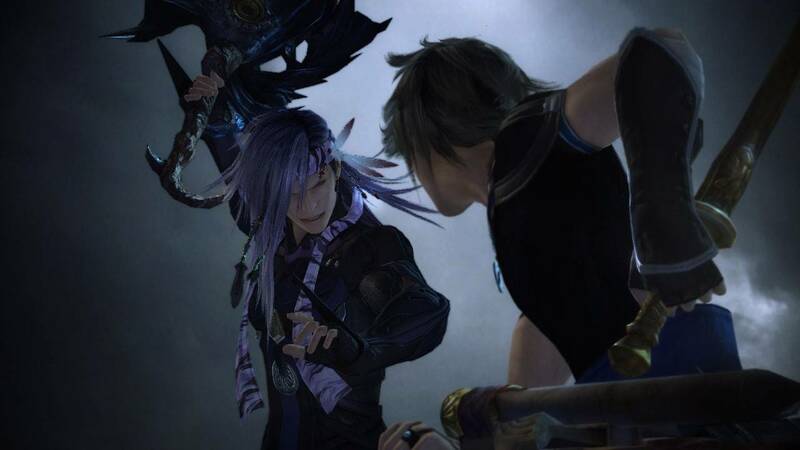 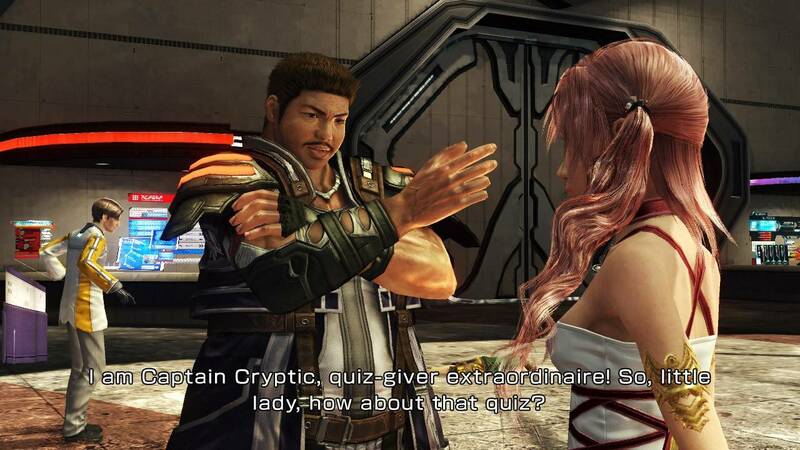 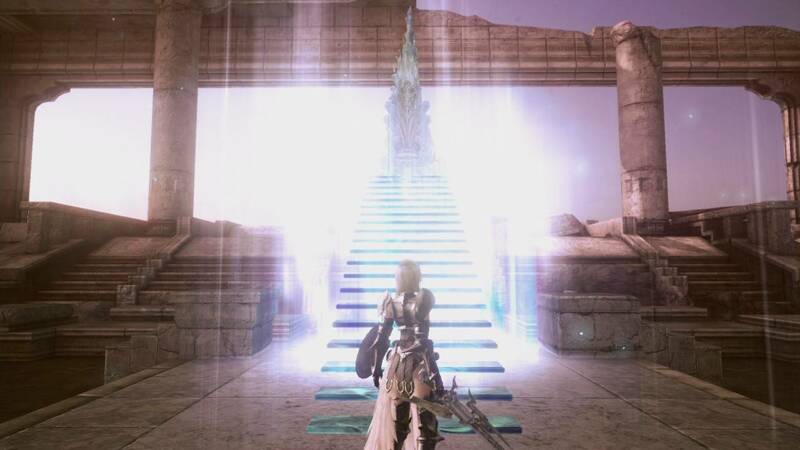 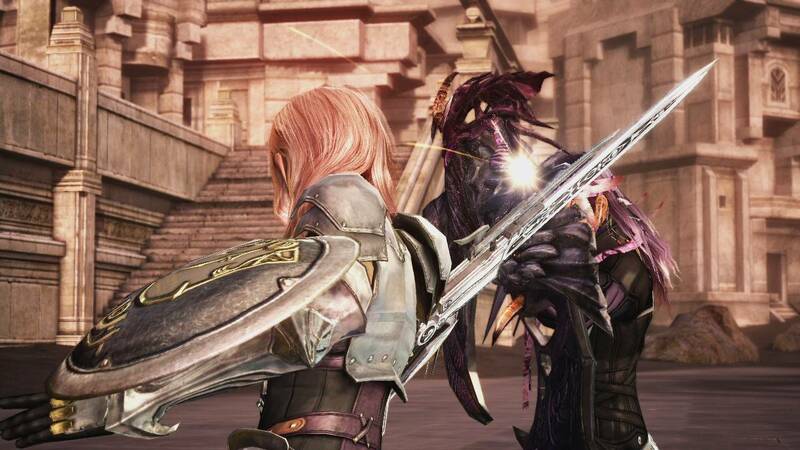 We then watched as Serah (Lightning's sister), and a new guy named Noel took center stage, trying to get rid of some strange creature known as Atlas, a massive humanoid monster that was attacking their town. 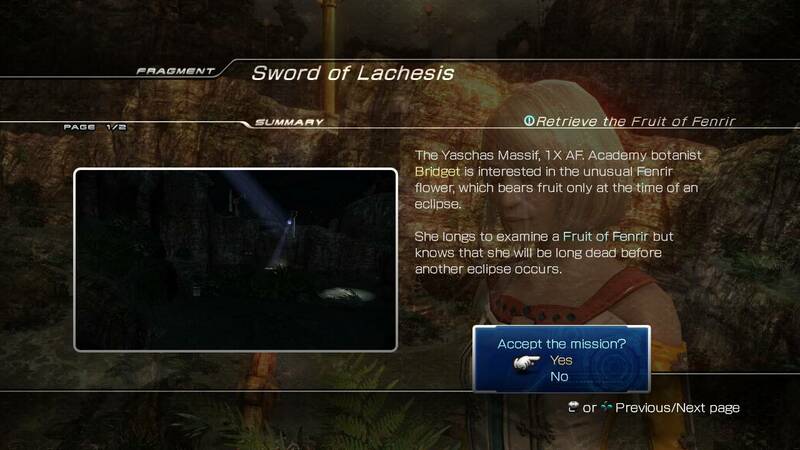 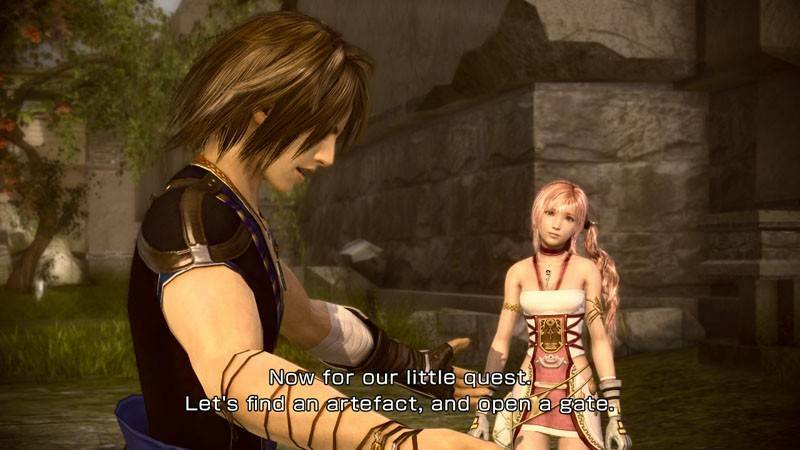 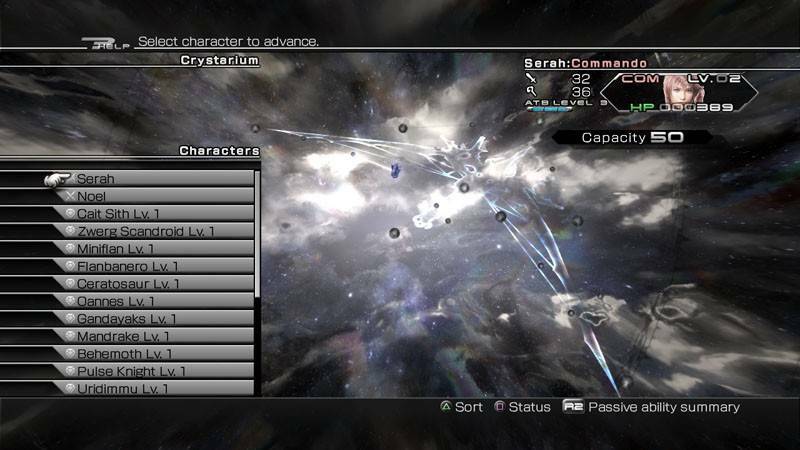 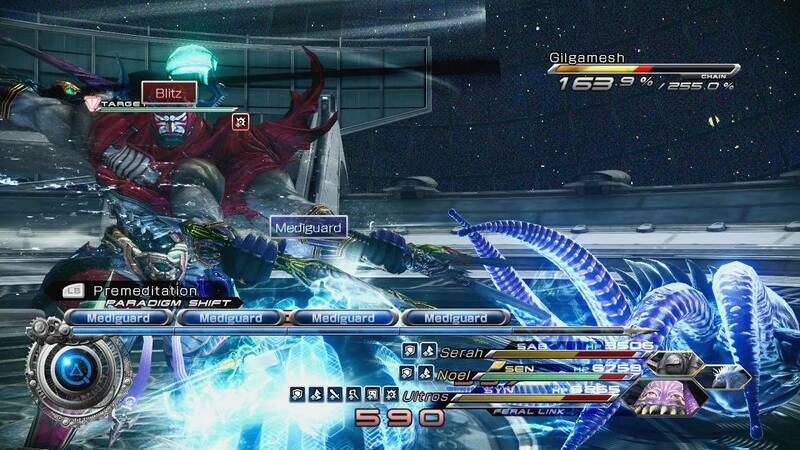 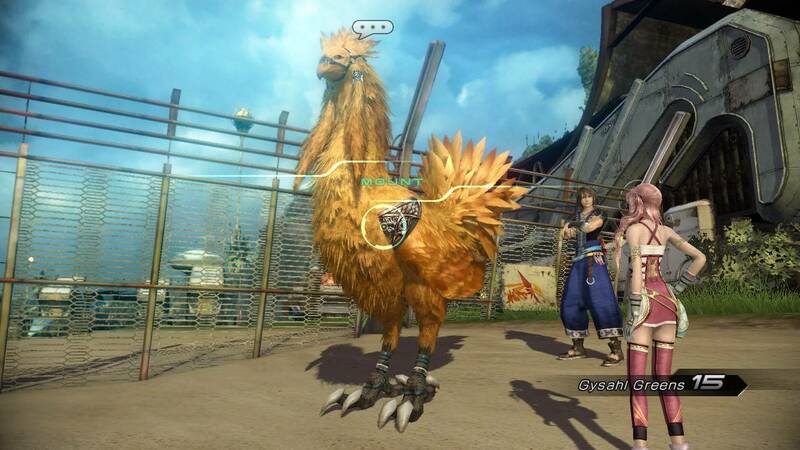 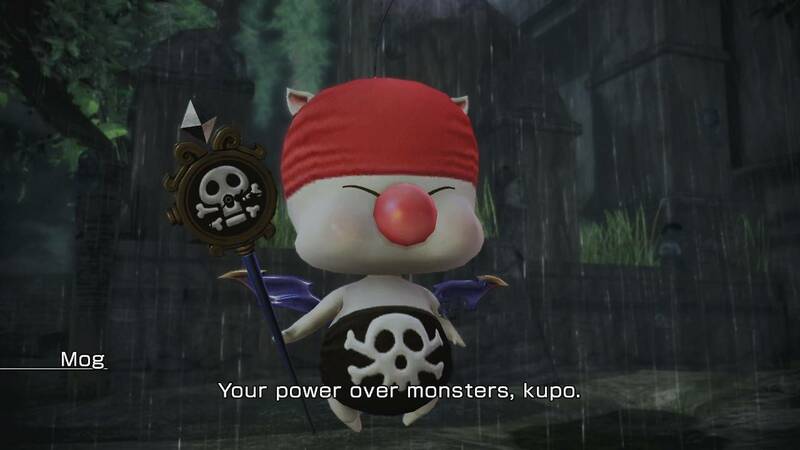 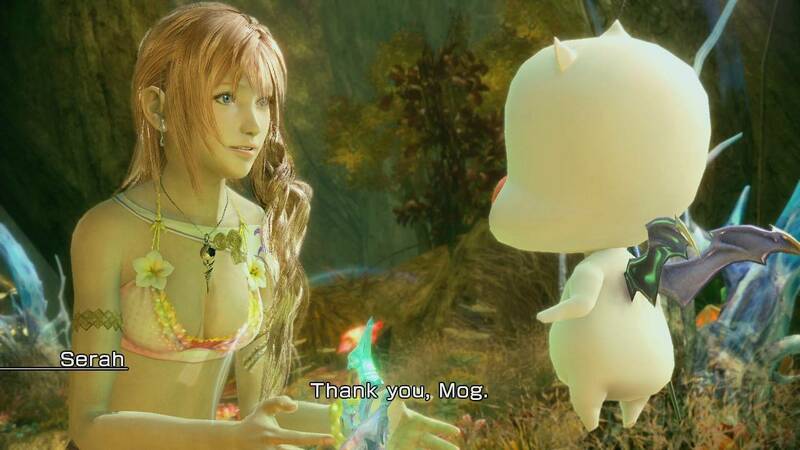 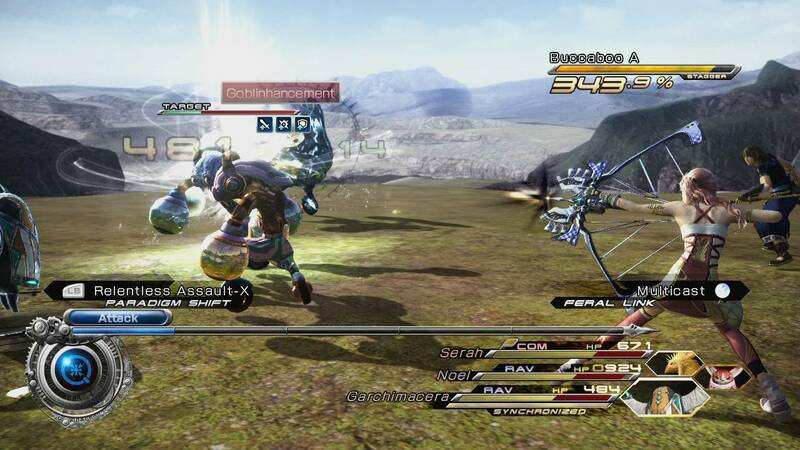 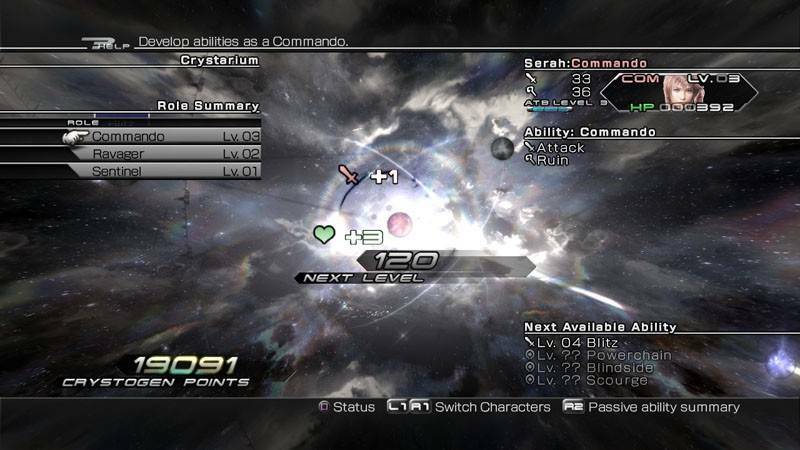 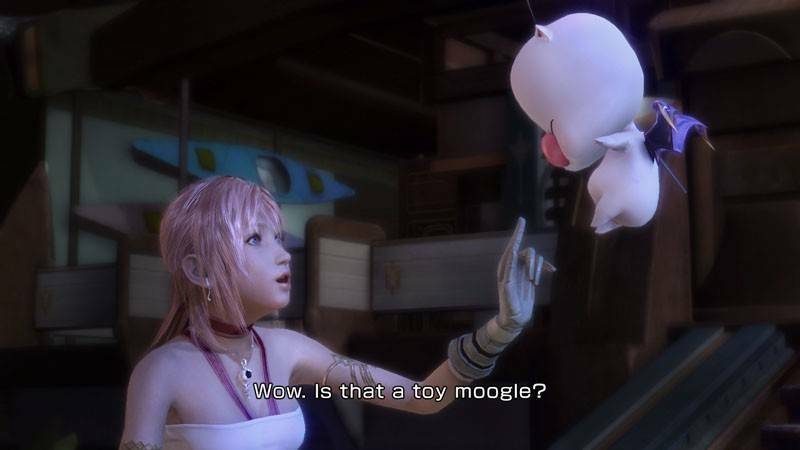 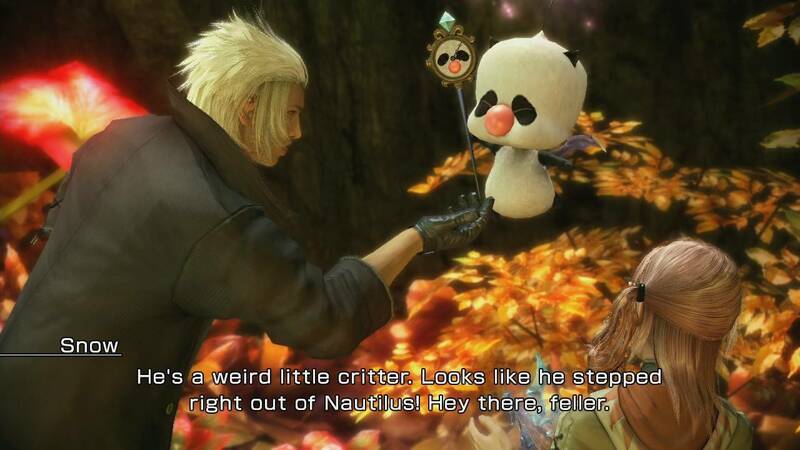 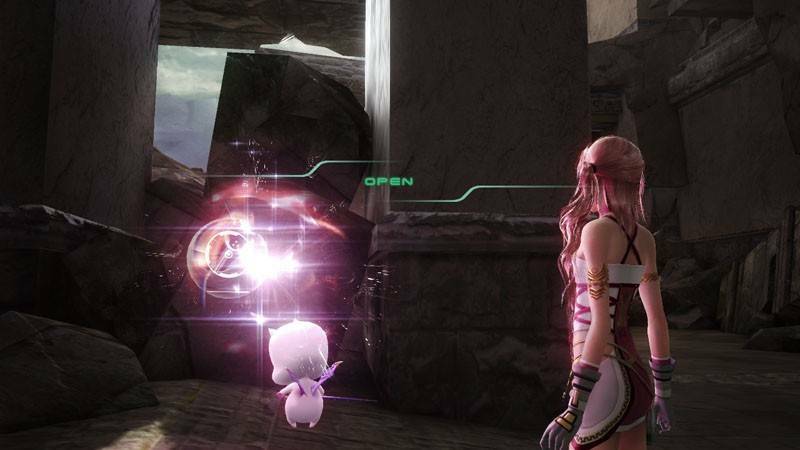 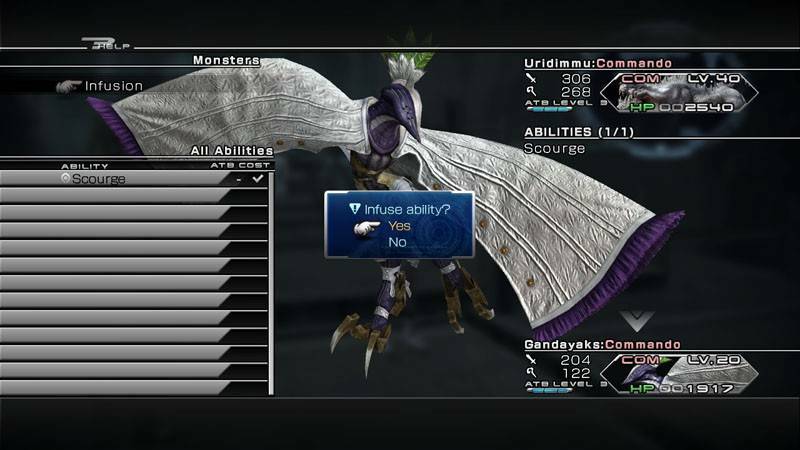 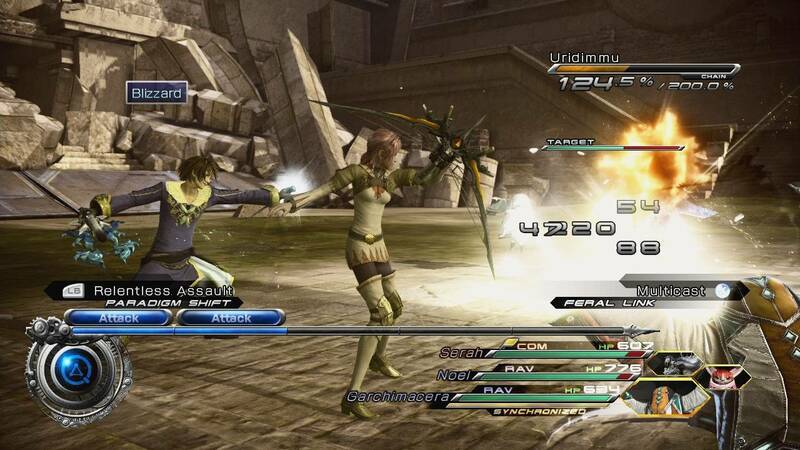 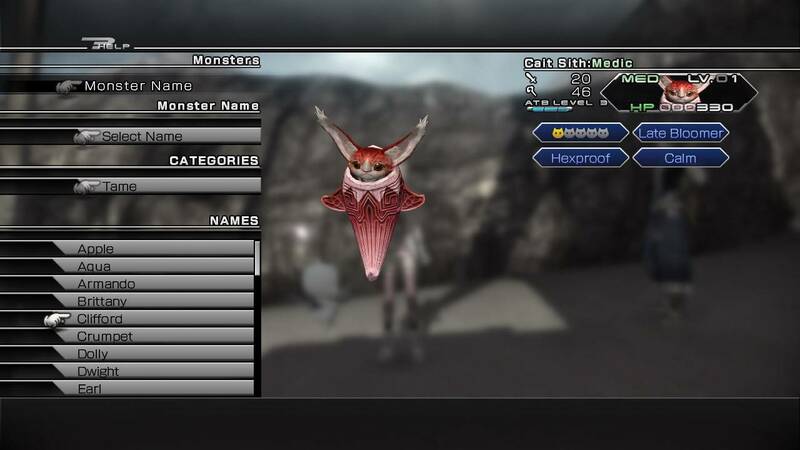 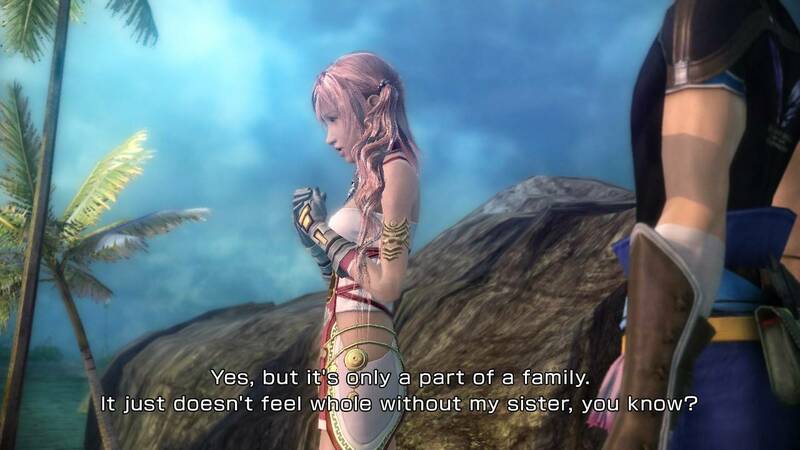 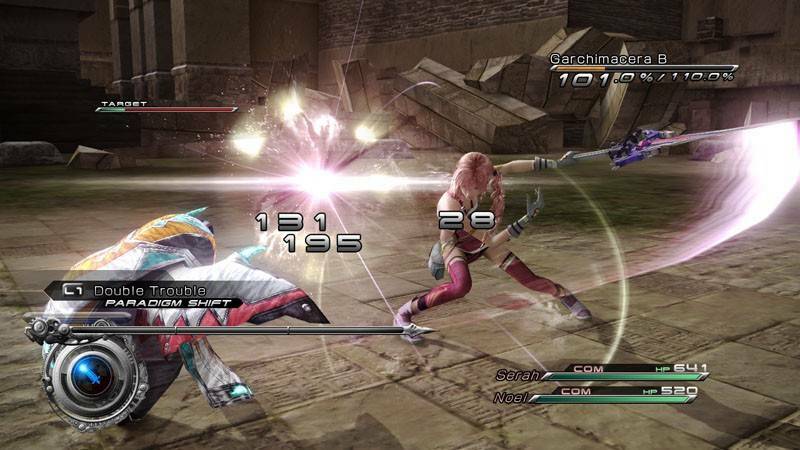 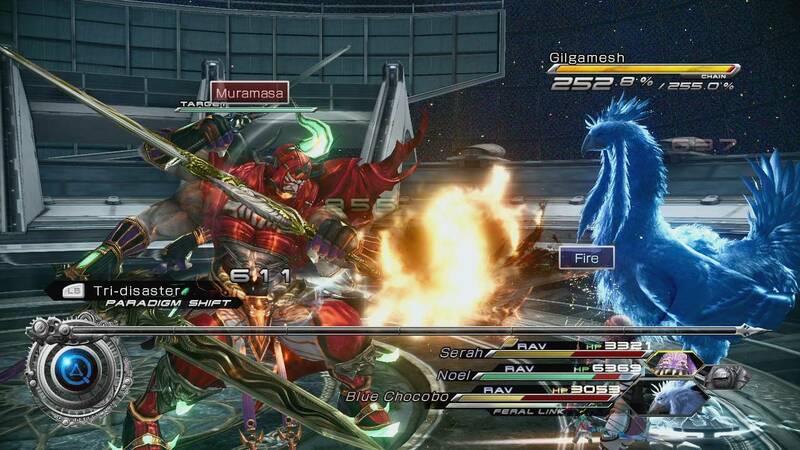 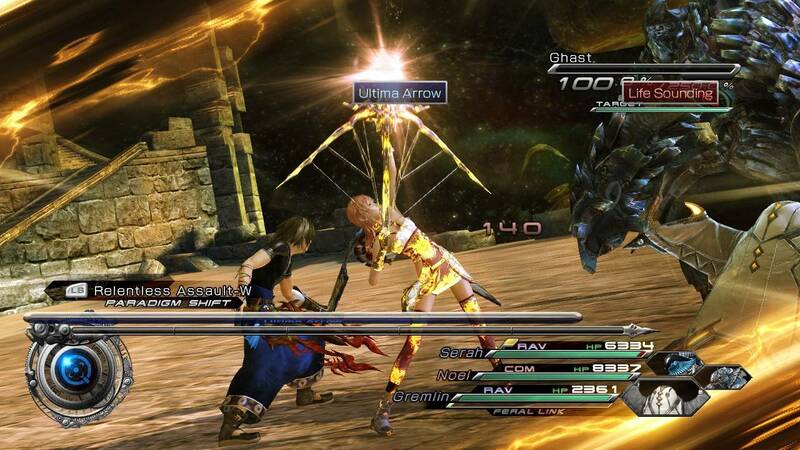 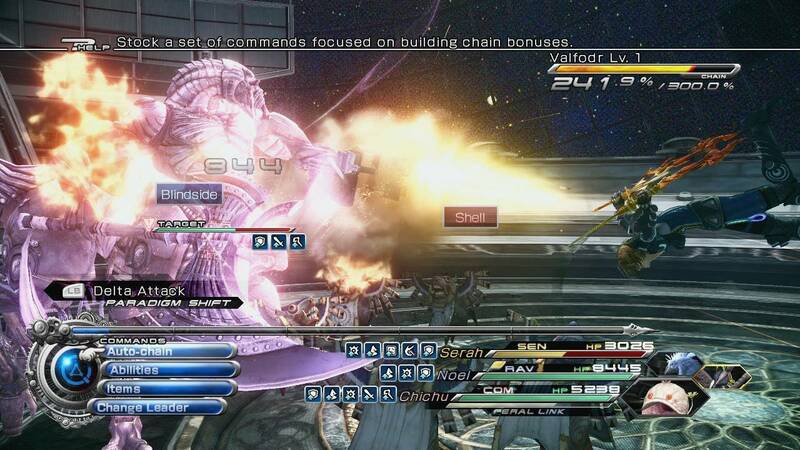 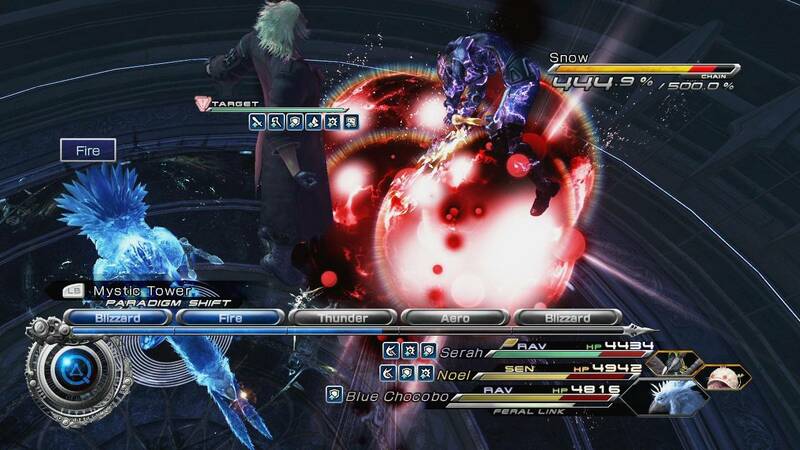 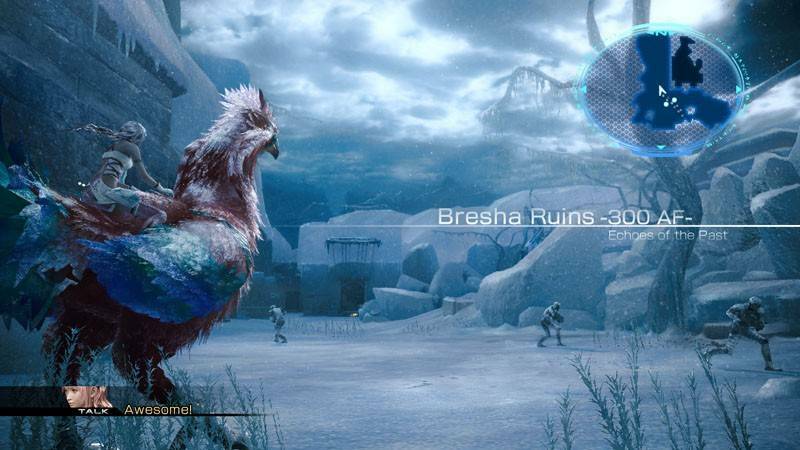 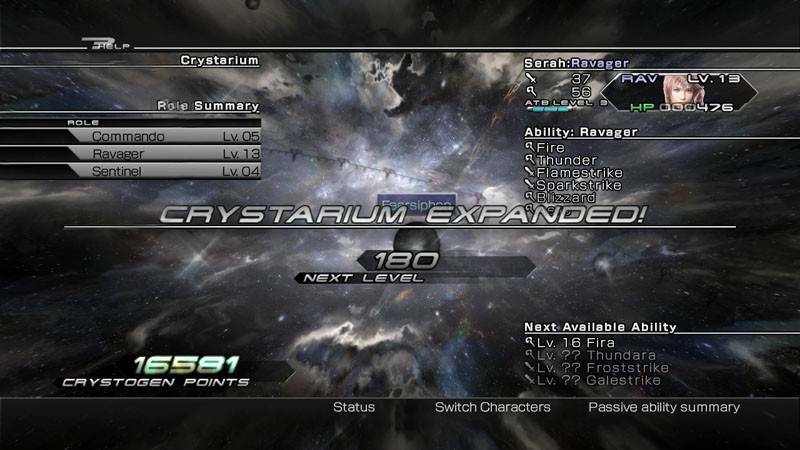 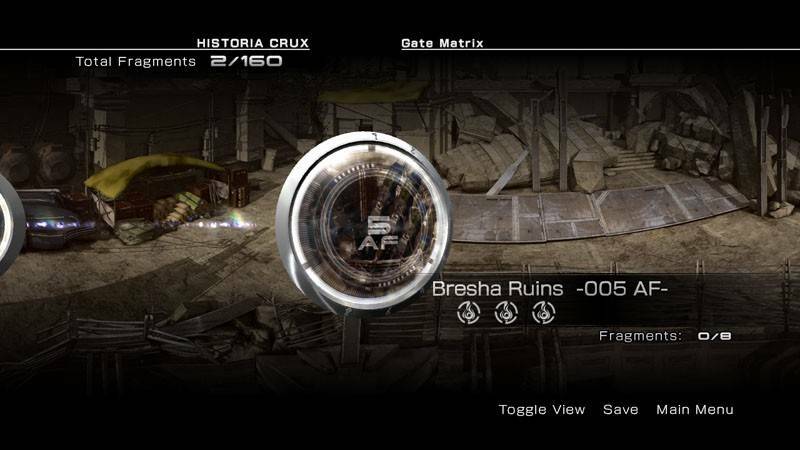 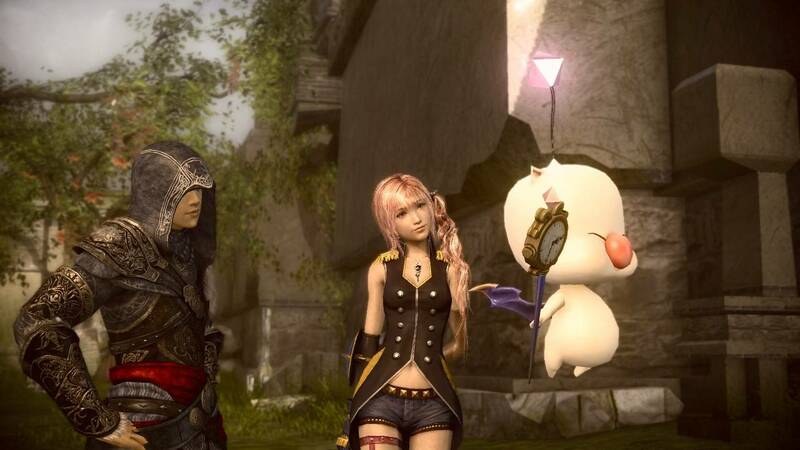 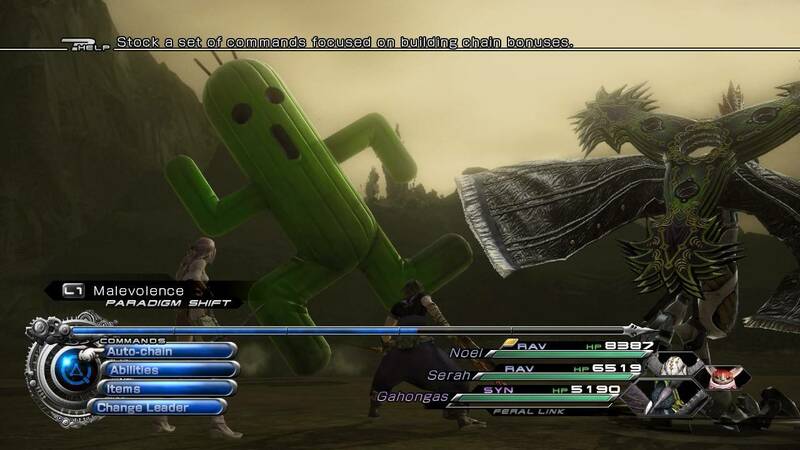 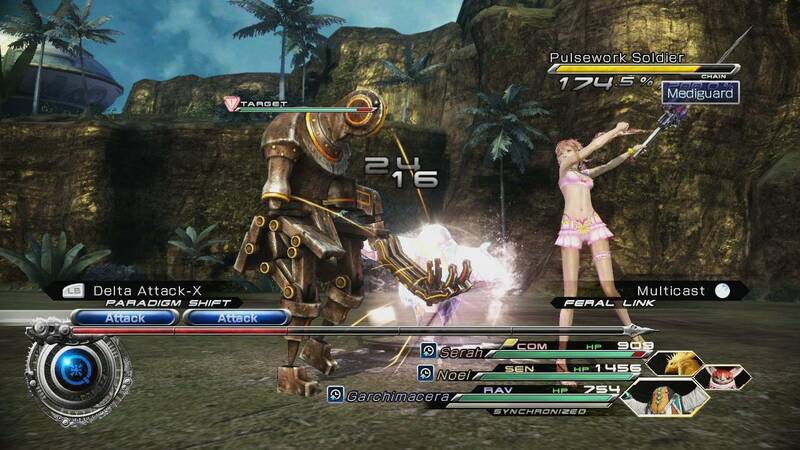 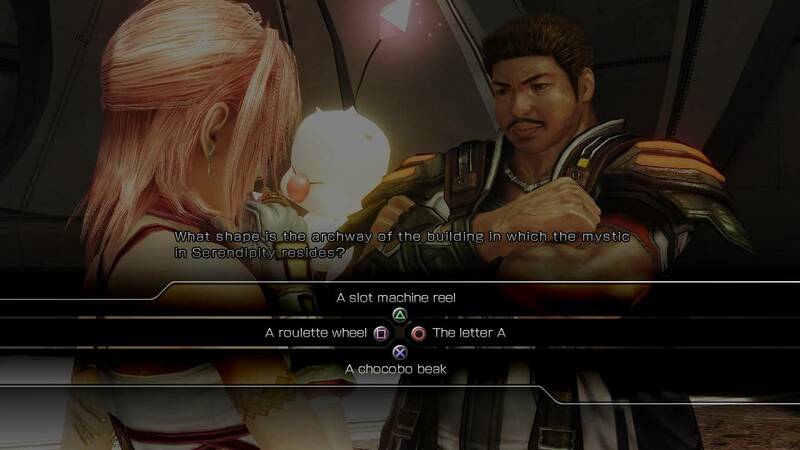 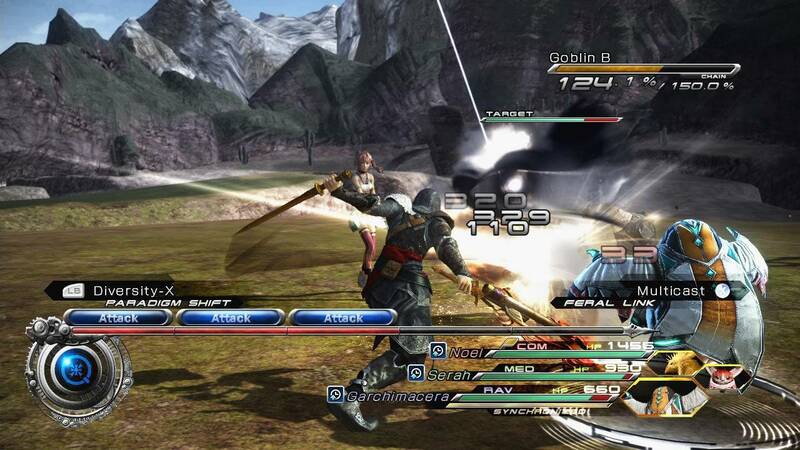 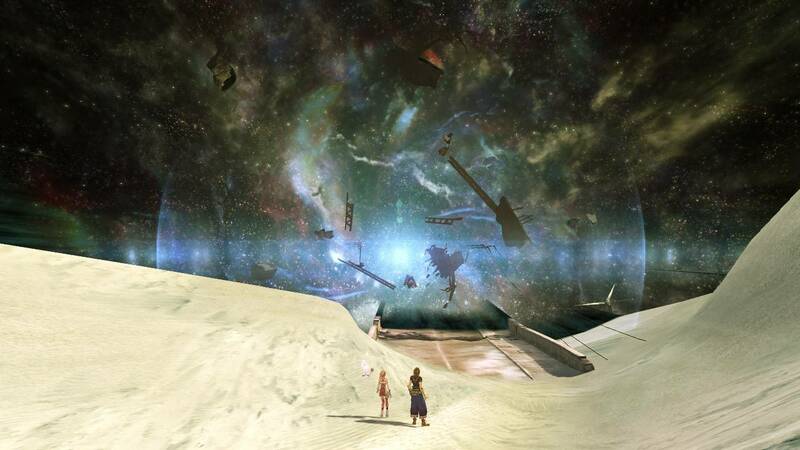 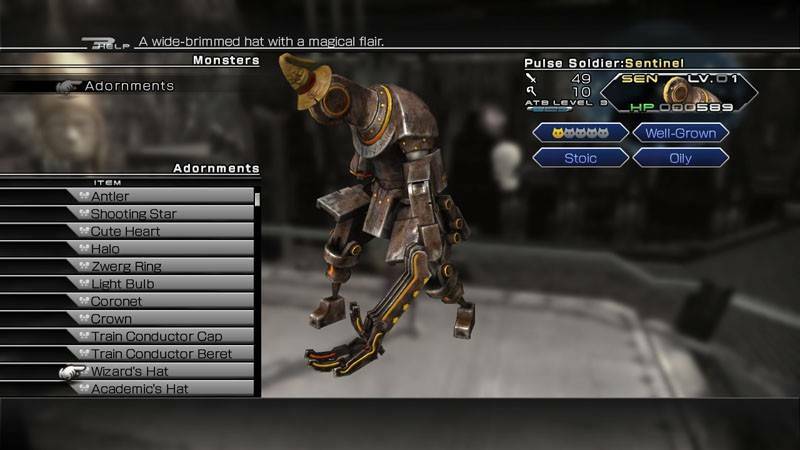 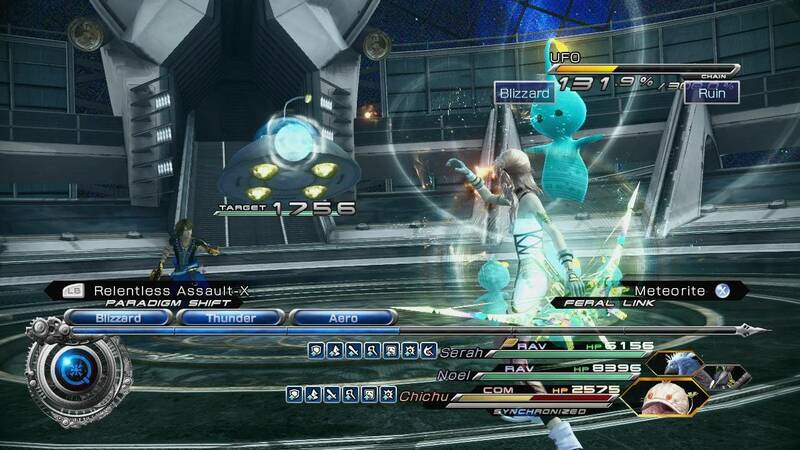 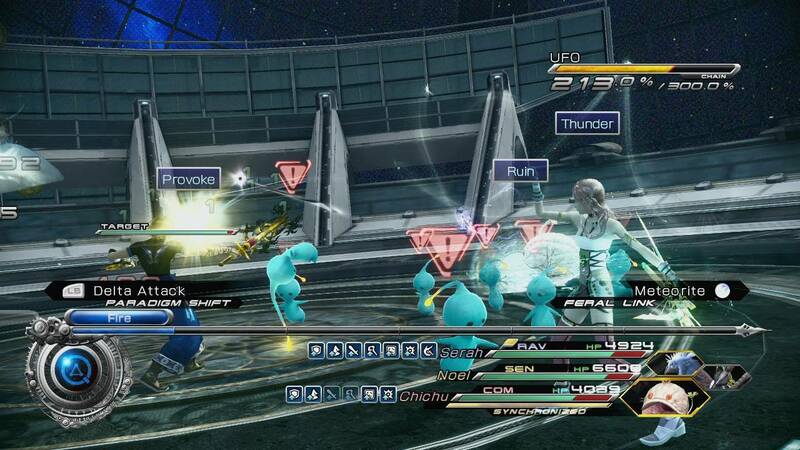 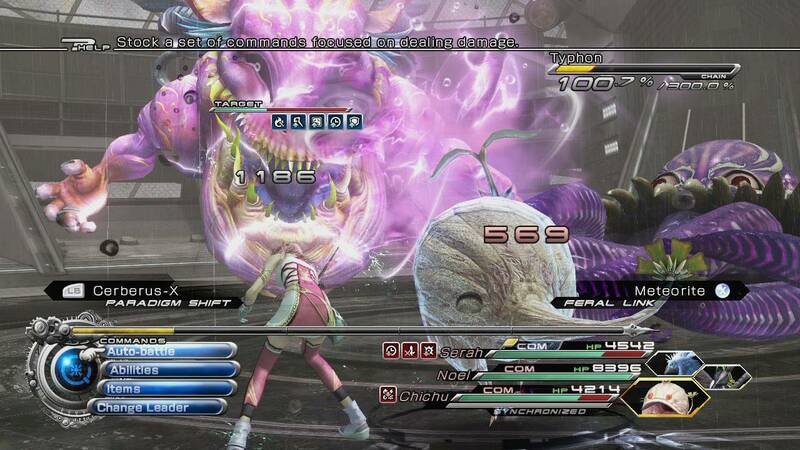 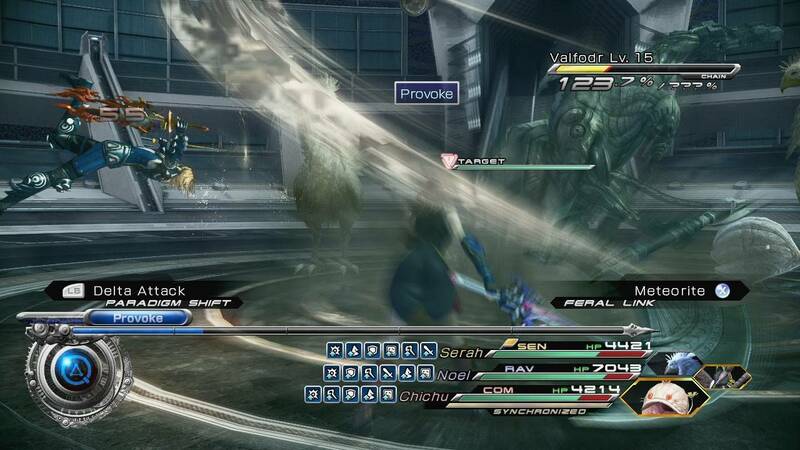 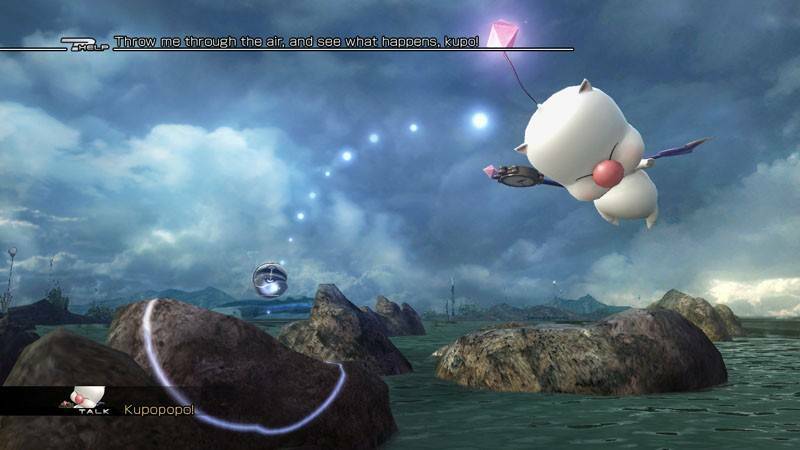 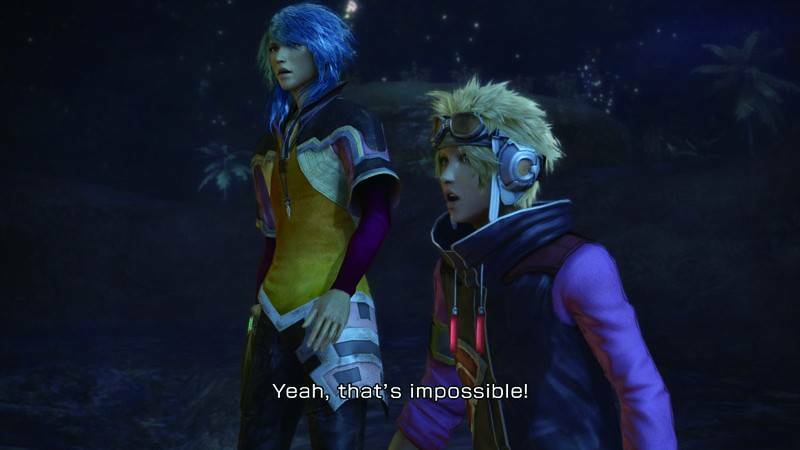 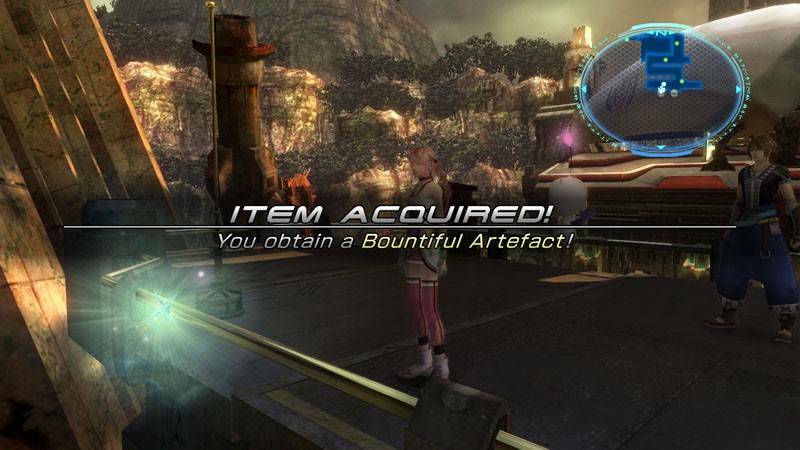 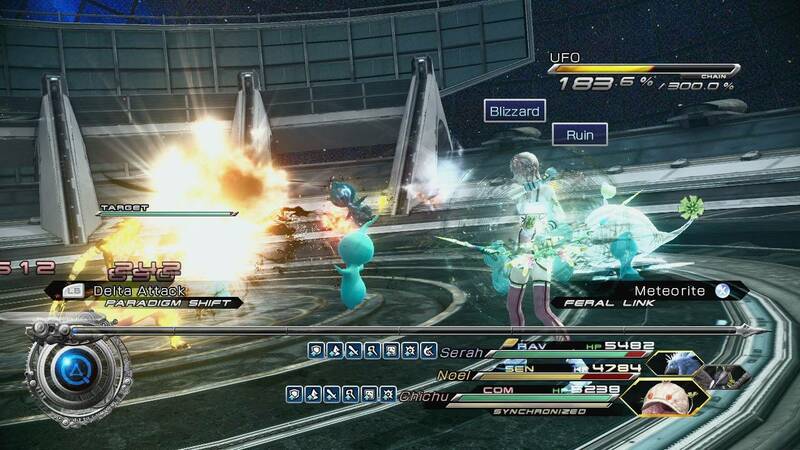 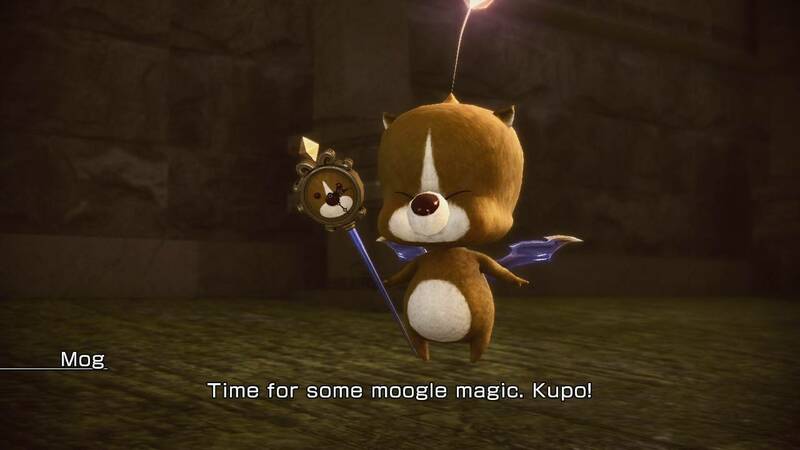 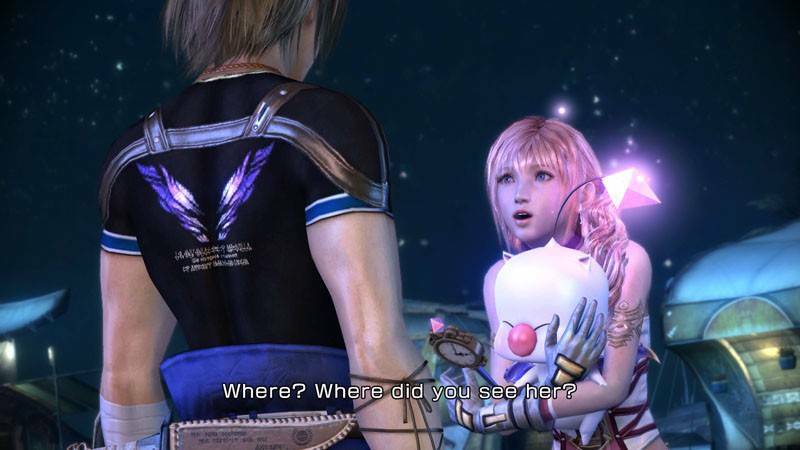 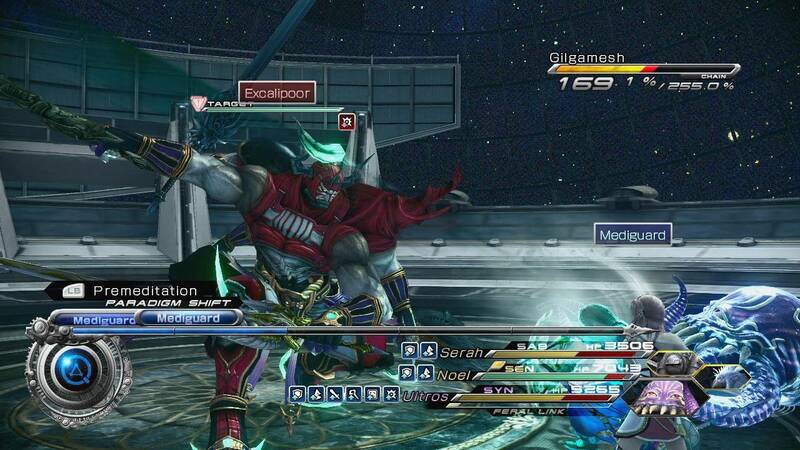 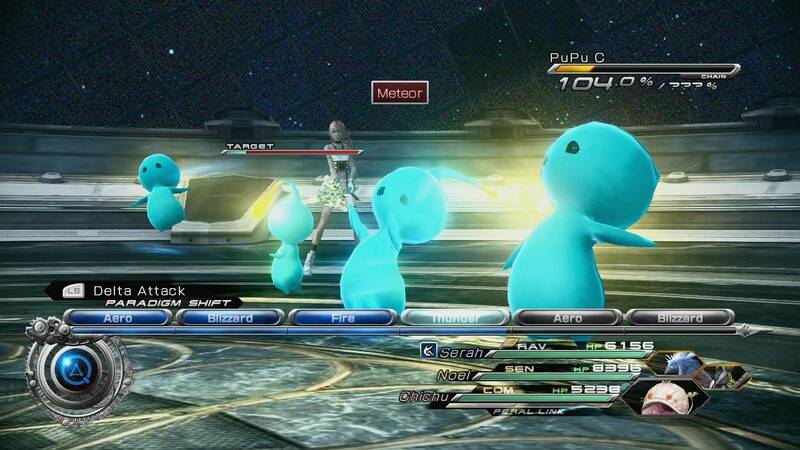 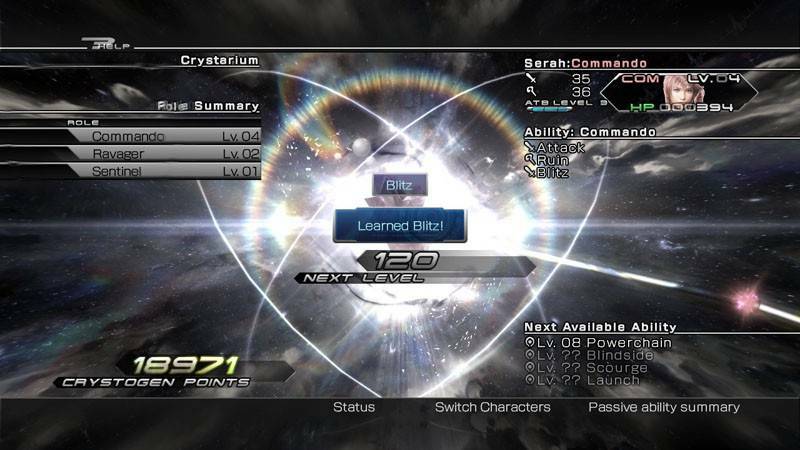 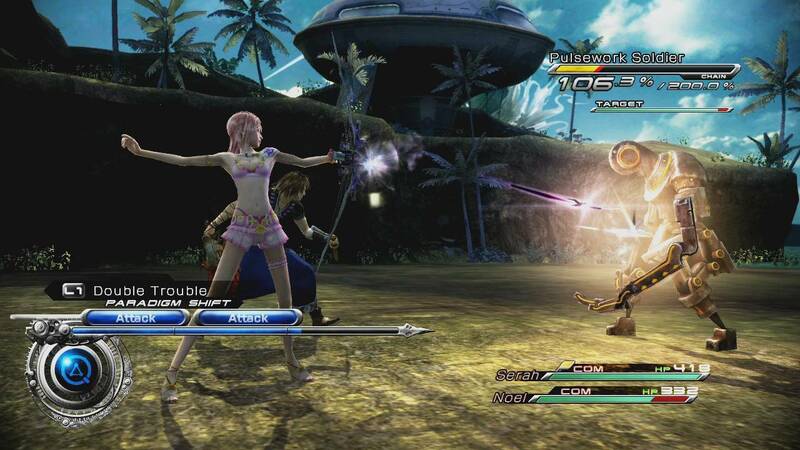 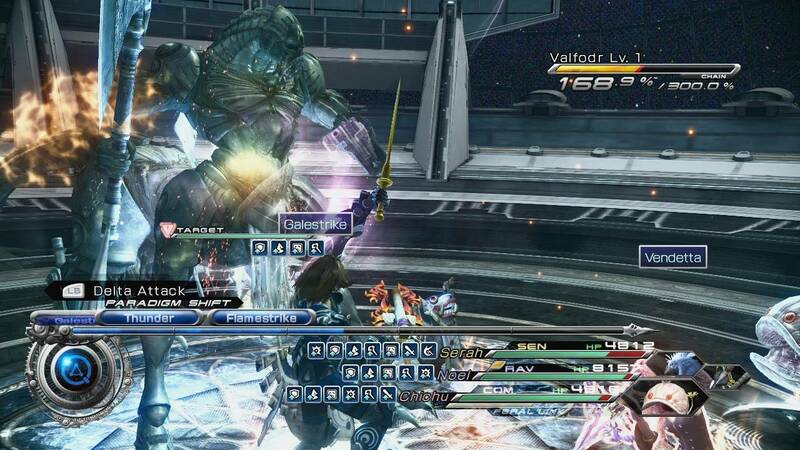 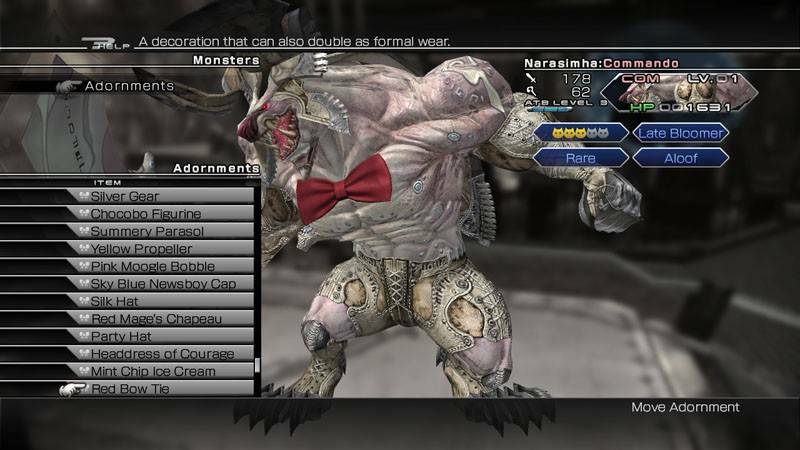 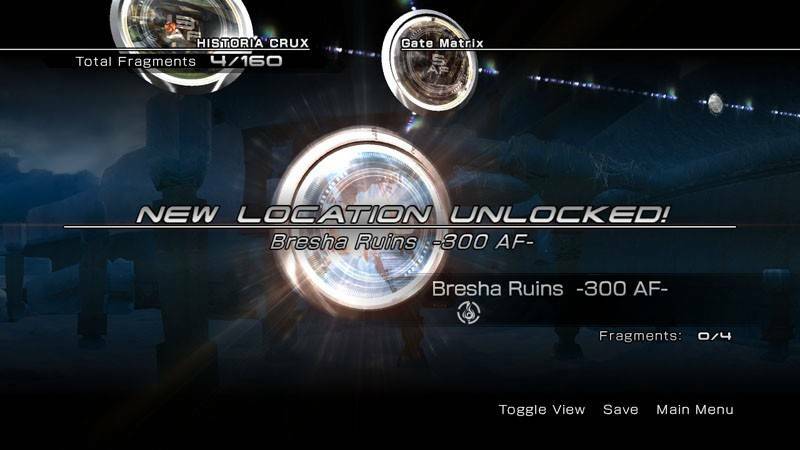 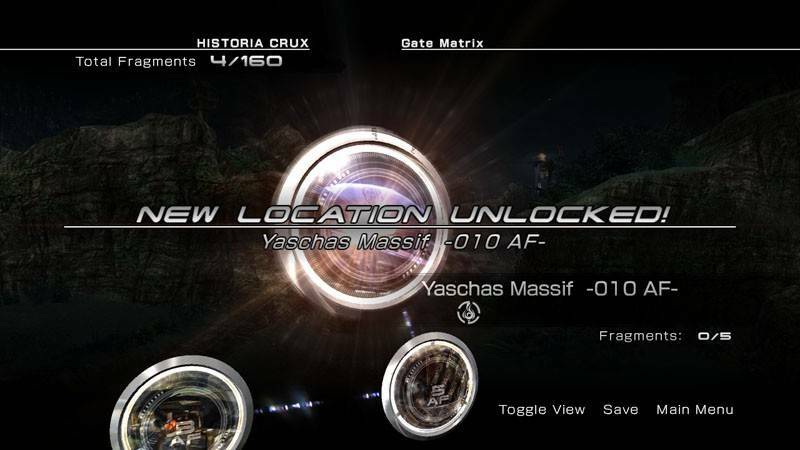 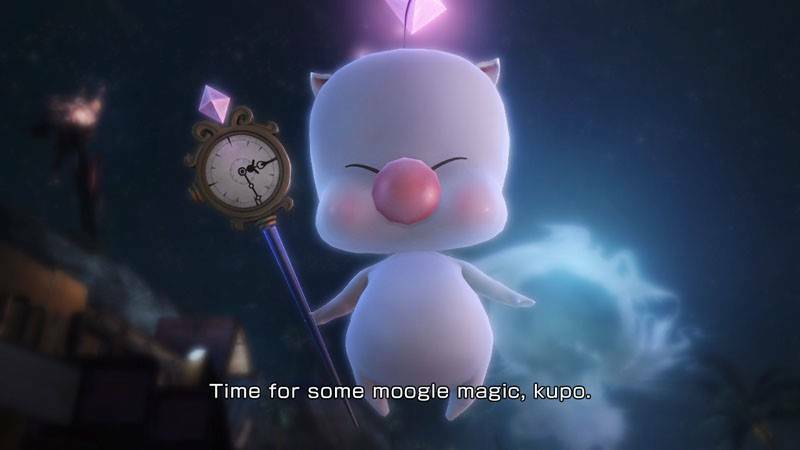 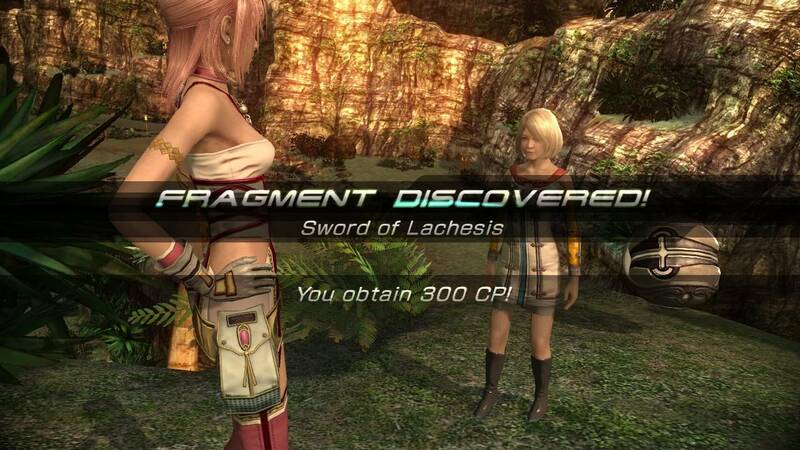 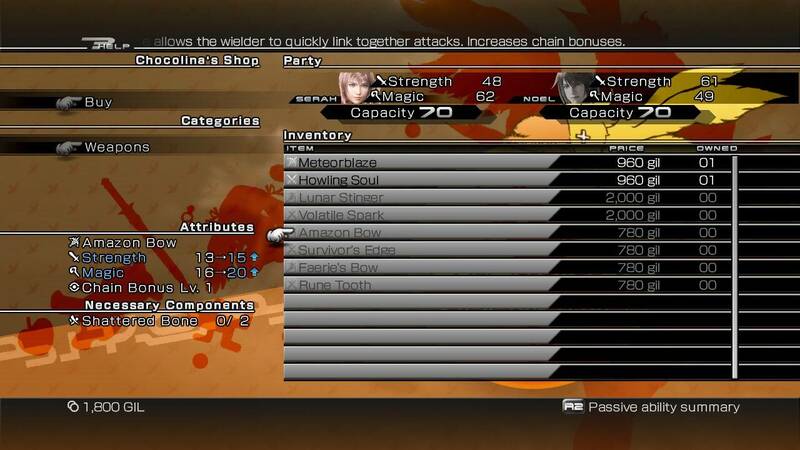 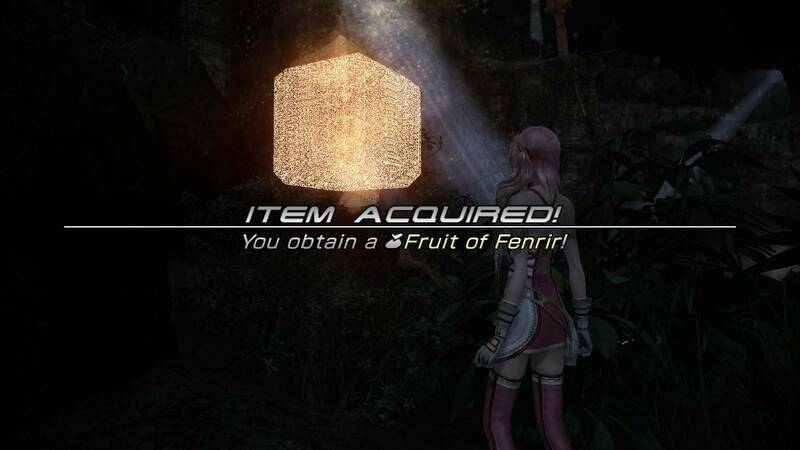 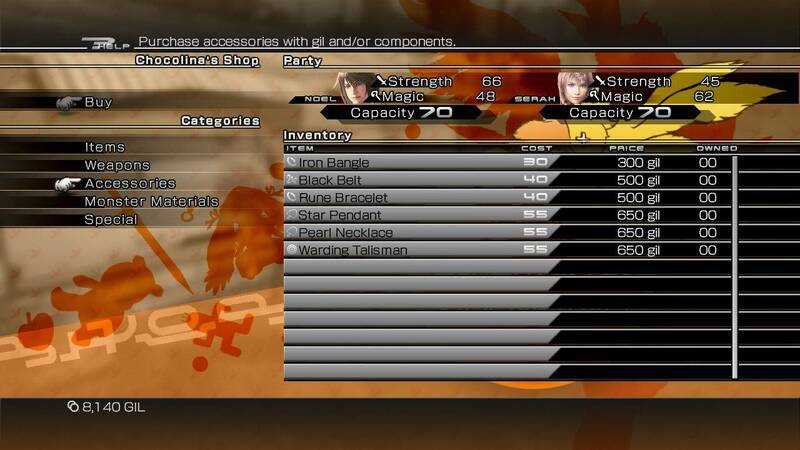 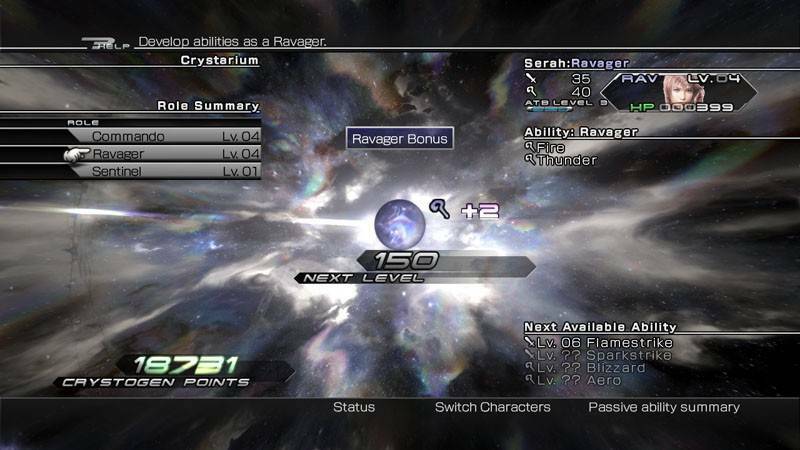 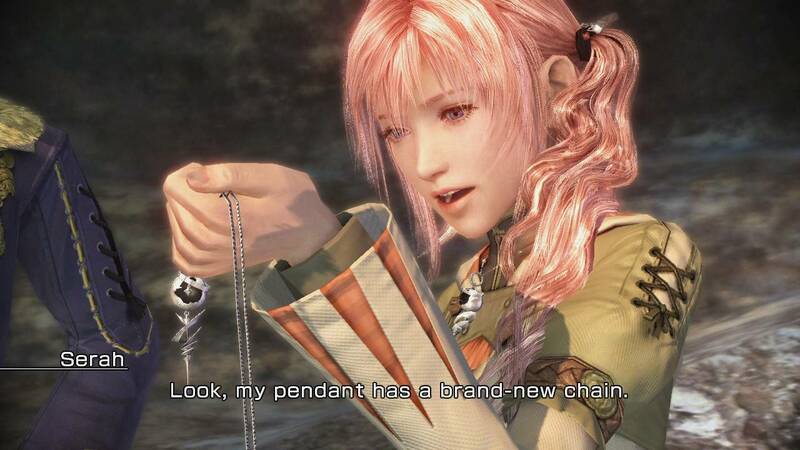 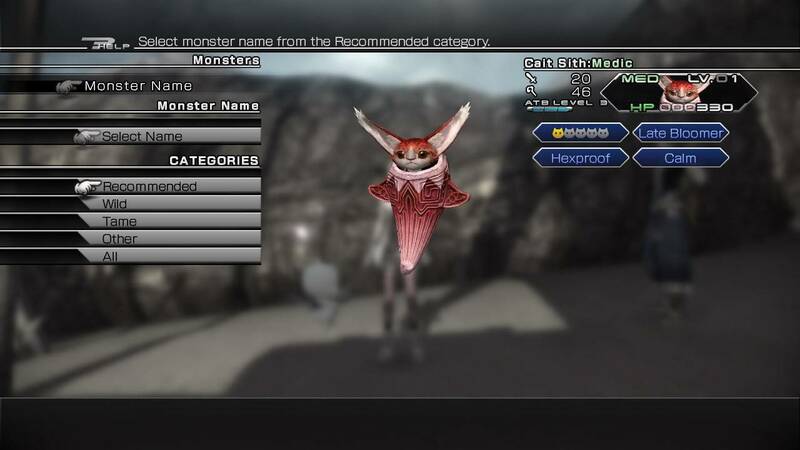 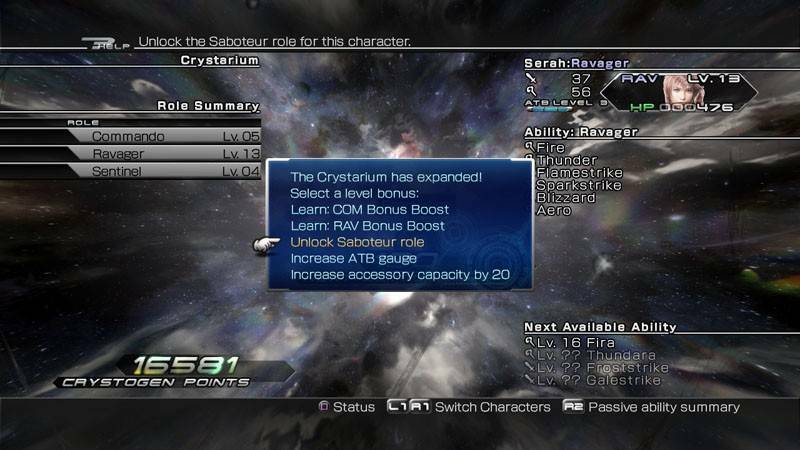 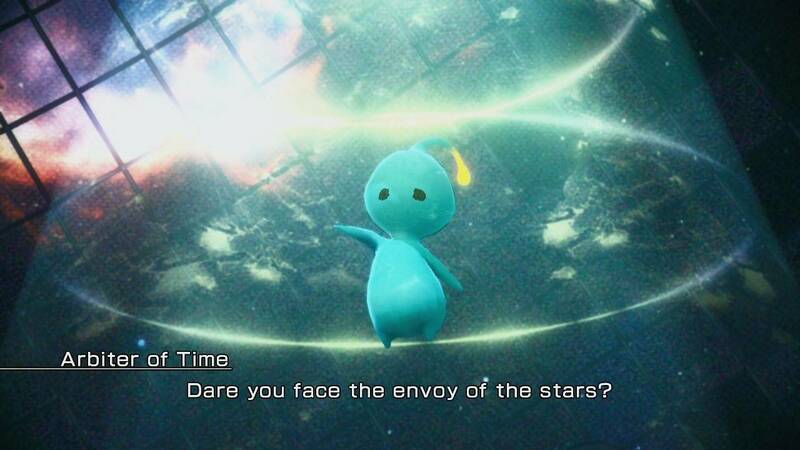 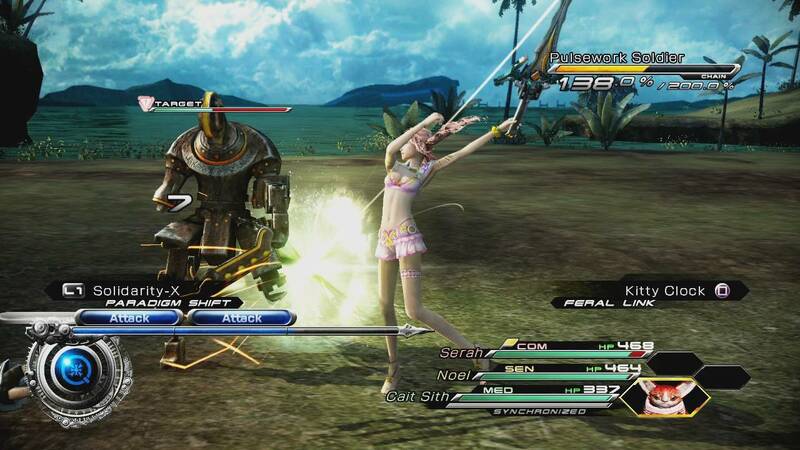 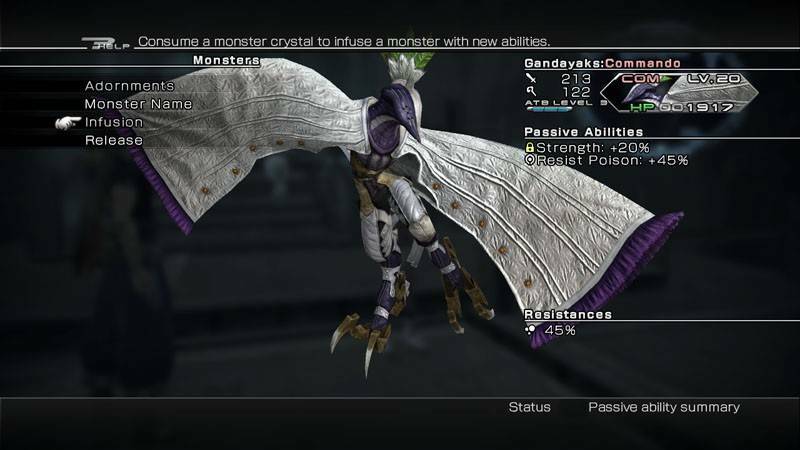 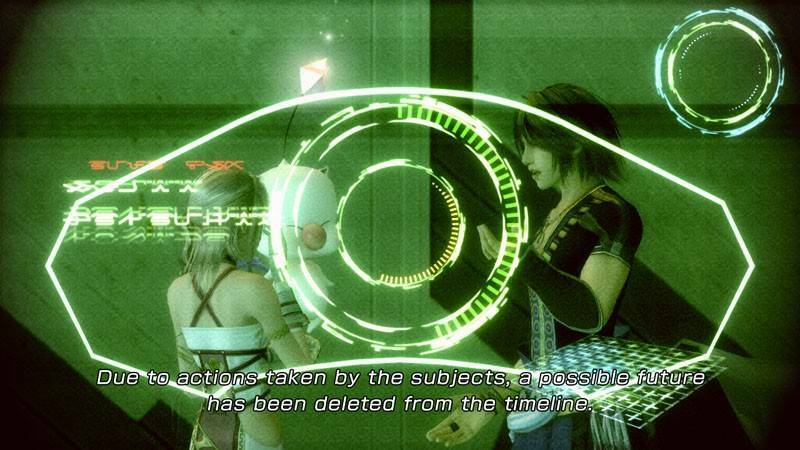 Also, Serah had a Moogle, which not only turned into a weapon, but allowed them to find hidden treasure chests. 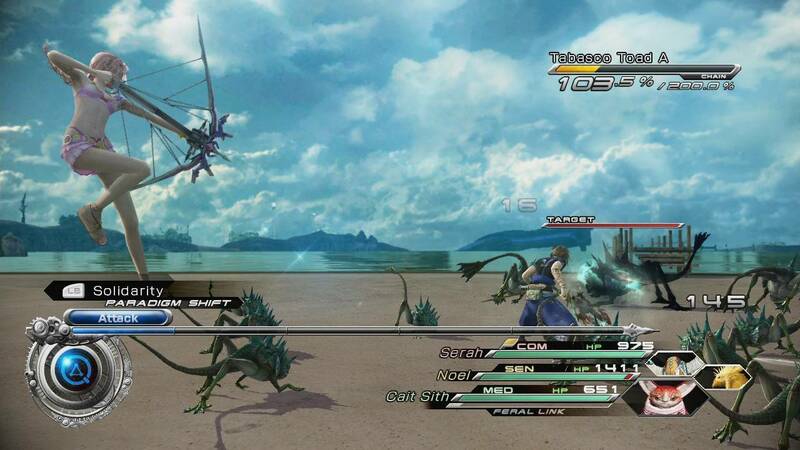 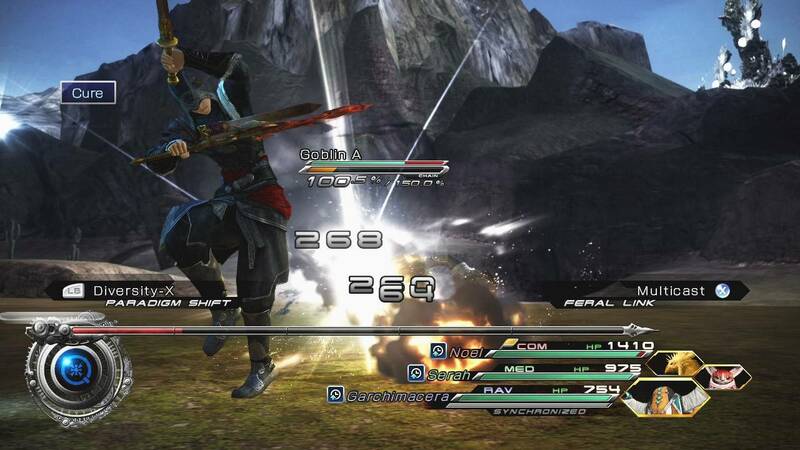 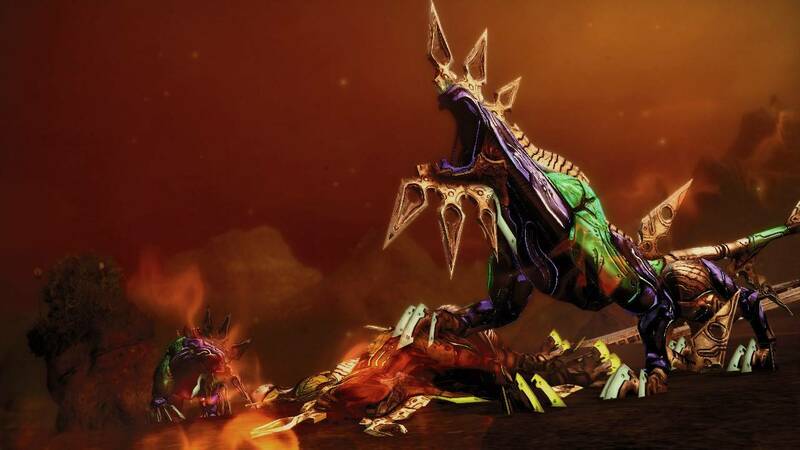 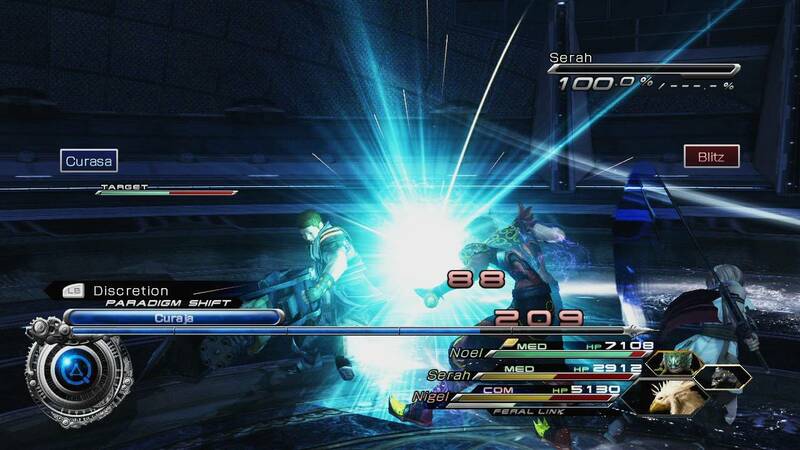 Combat still looks relatively similar. 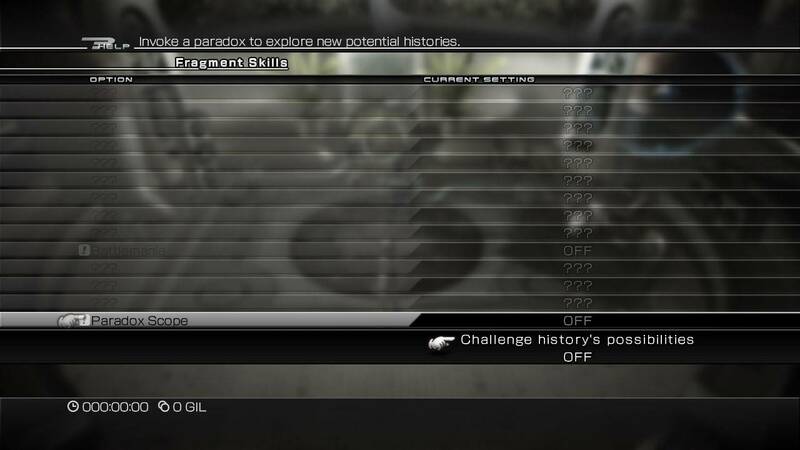 There are still paradigms to switch through, for example, but things have been switched up slightly. 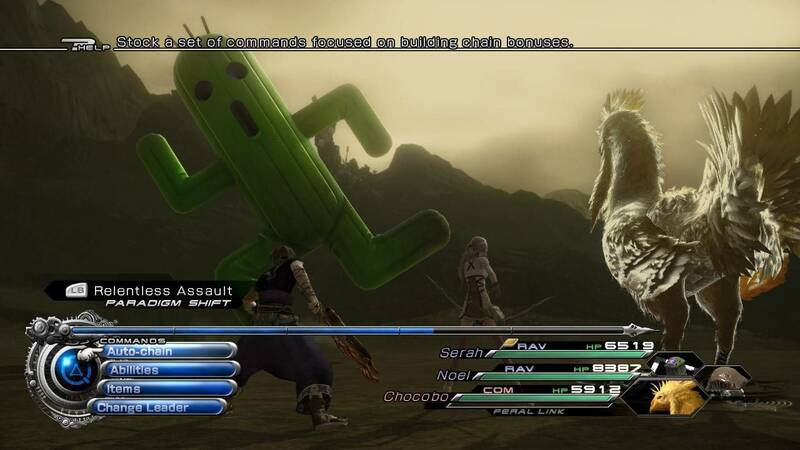 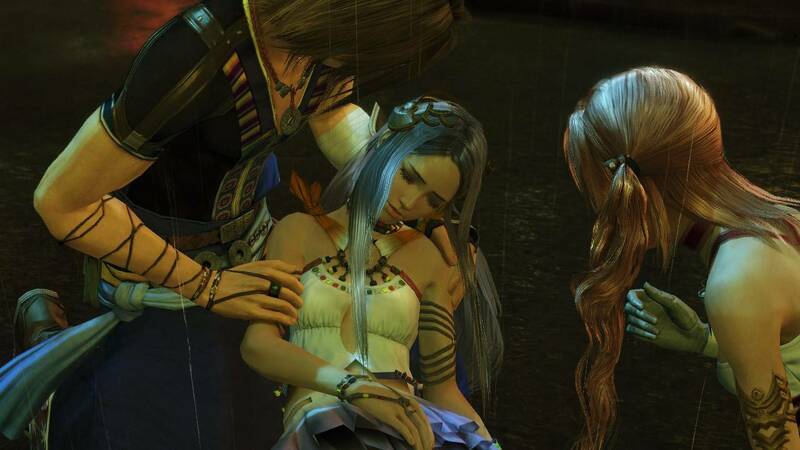 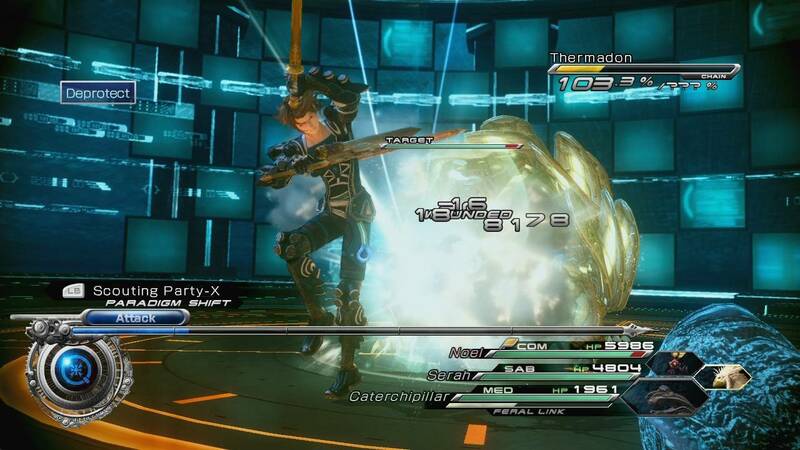 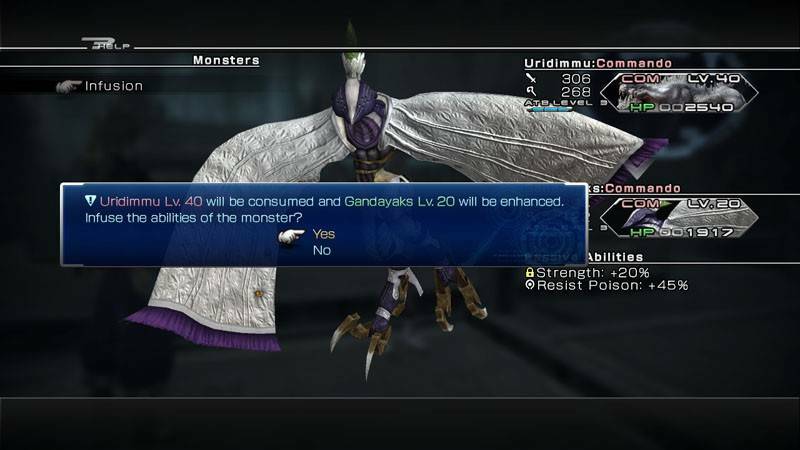 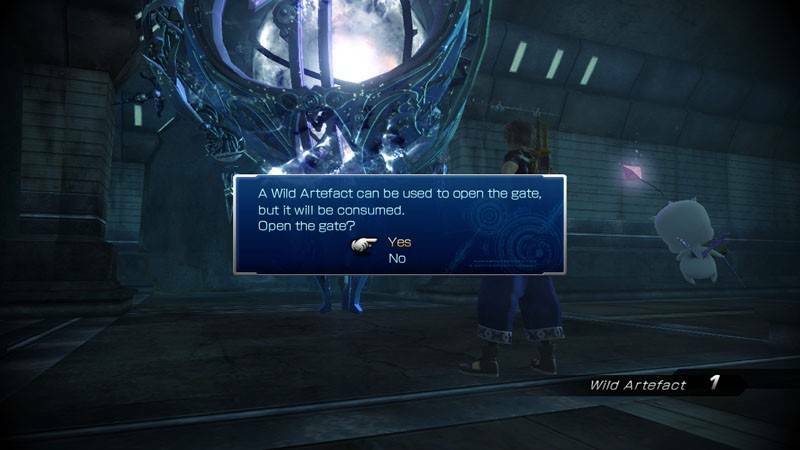 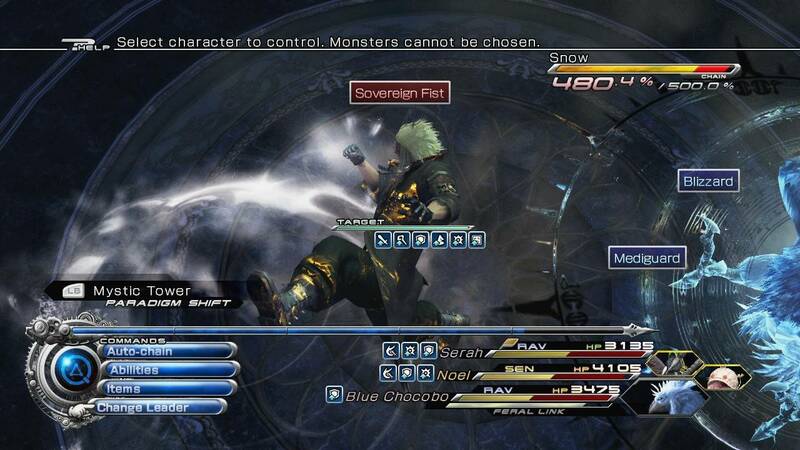 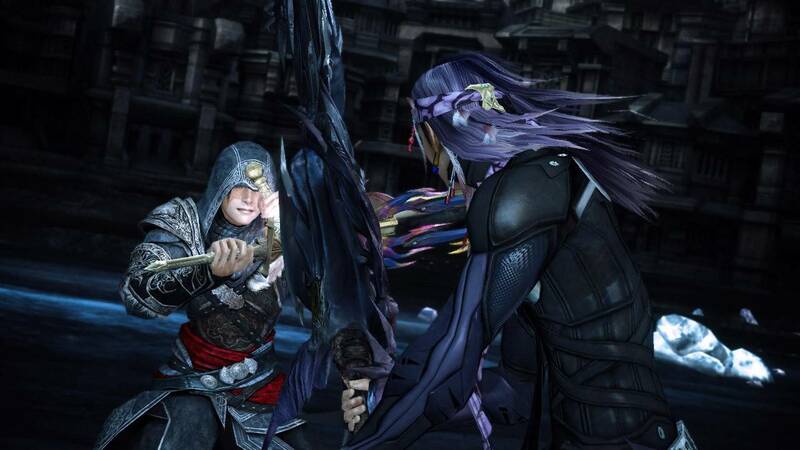 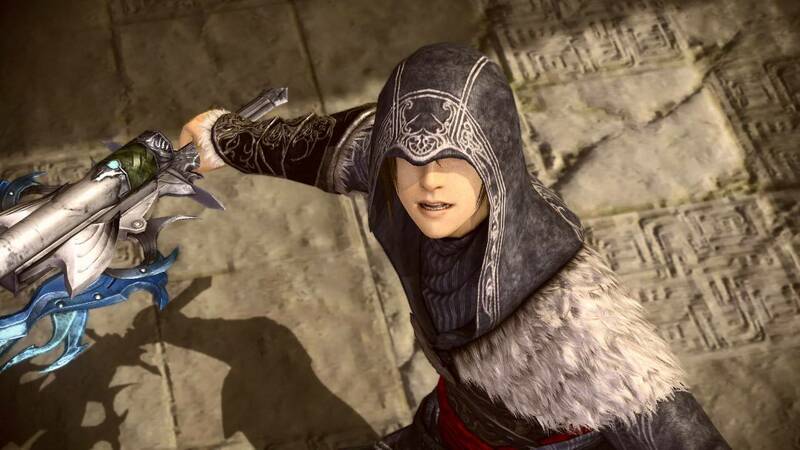 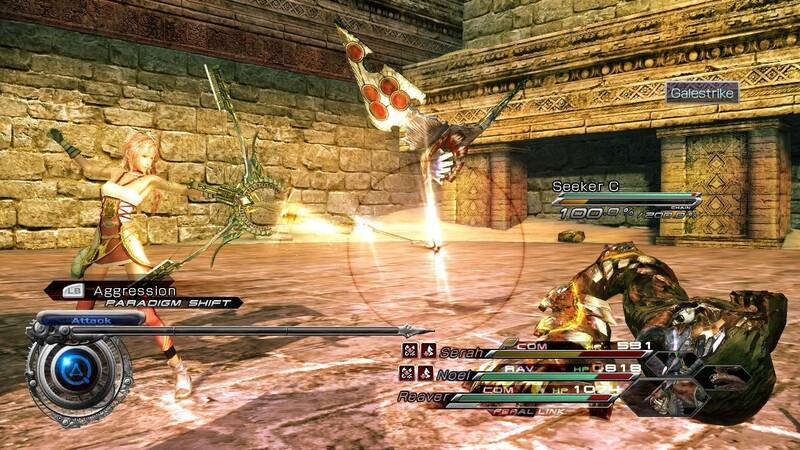 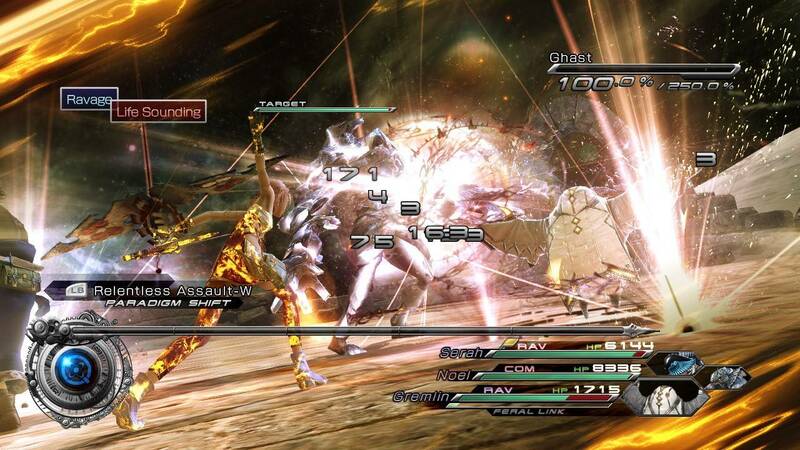 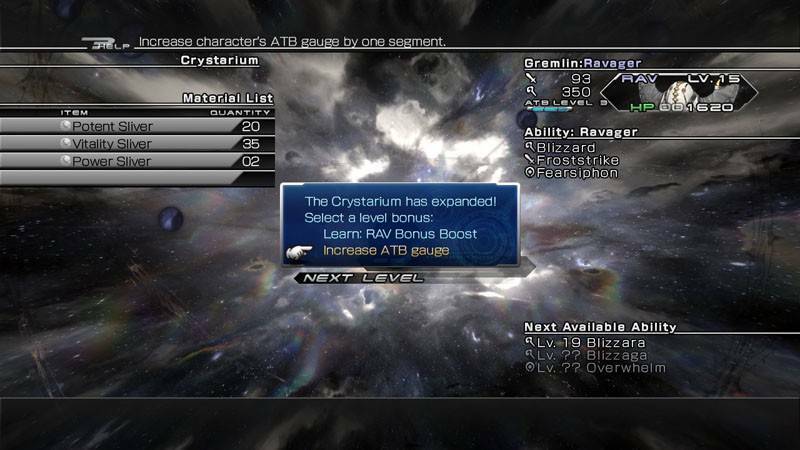 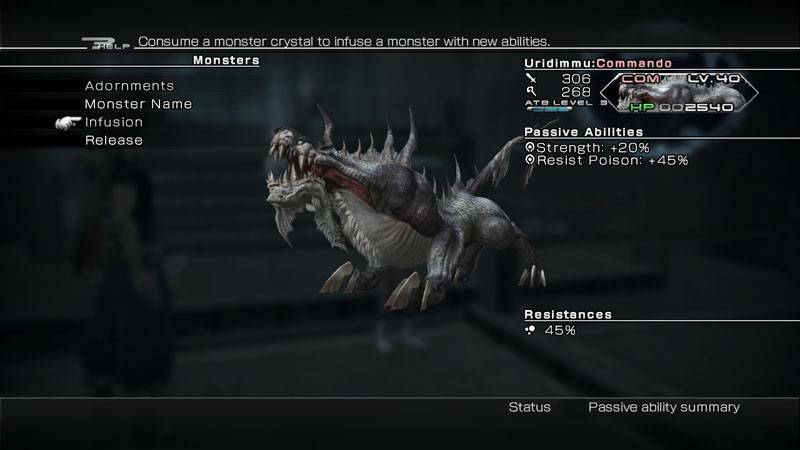 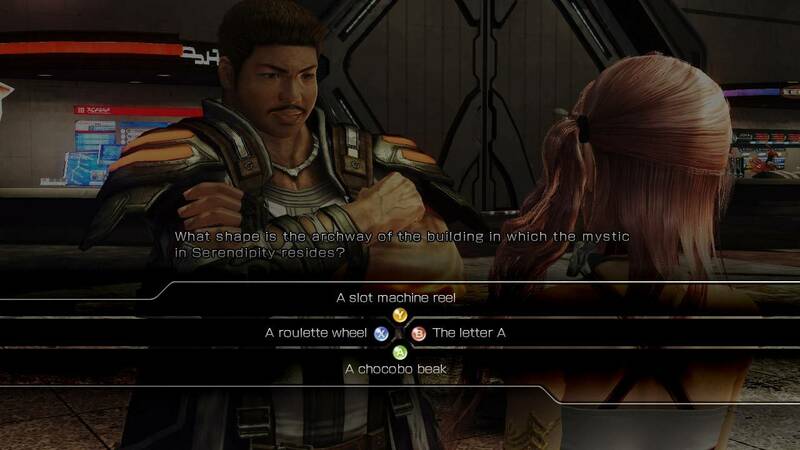 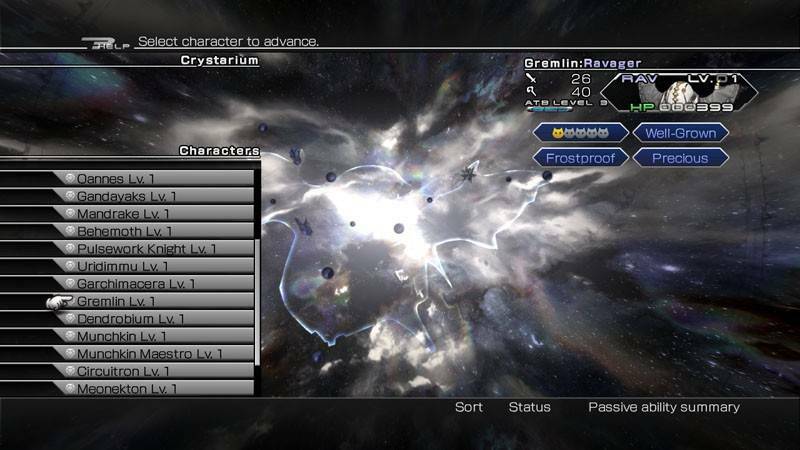 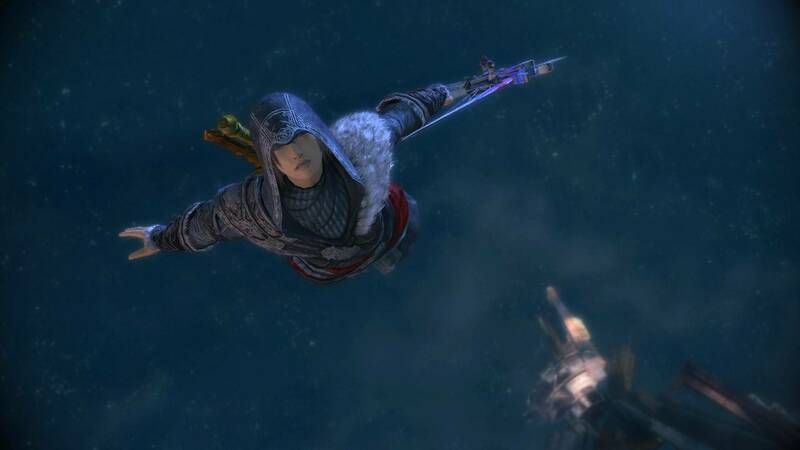 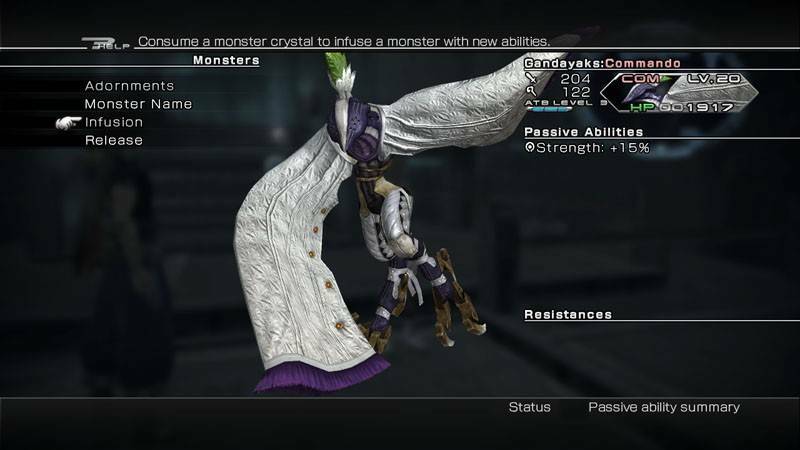 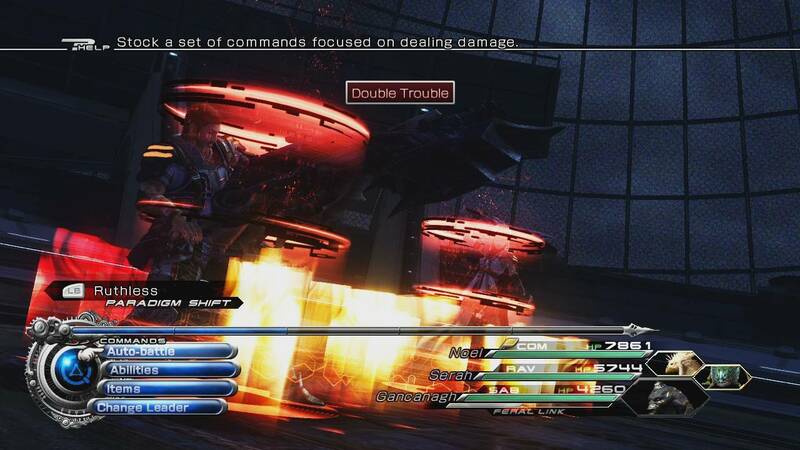 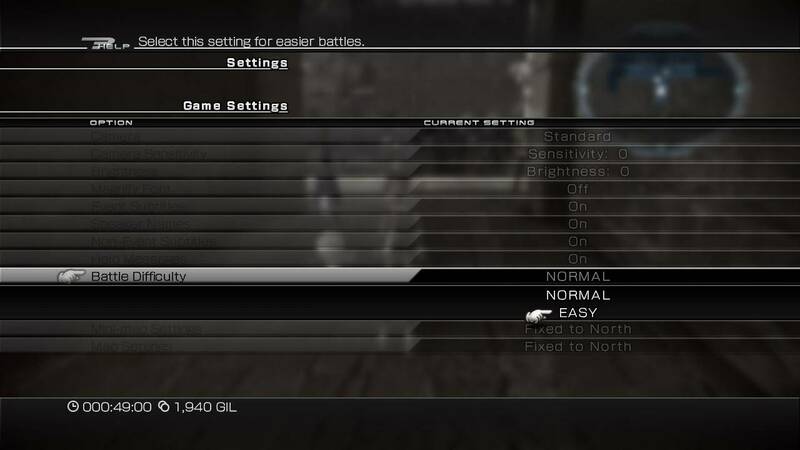 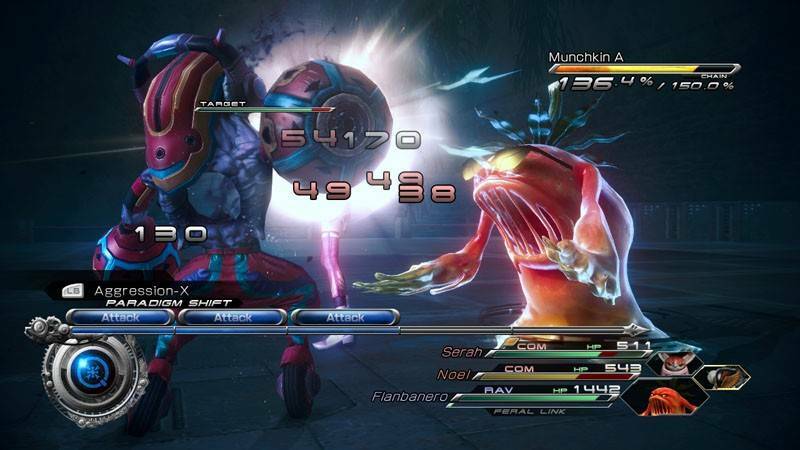 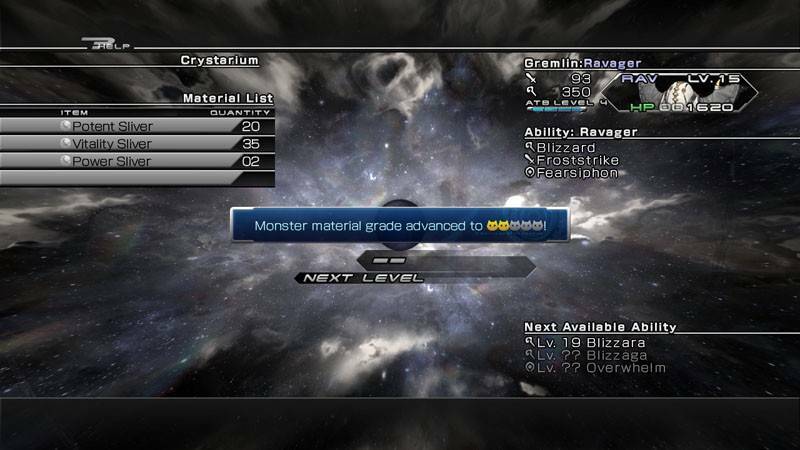 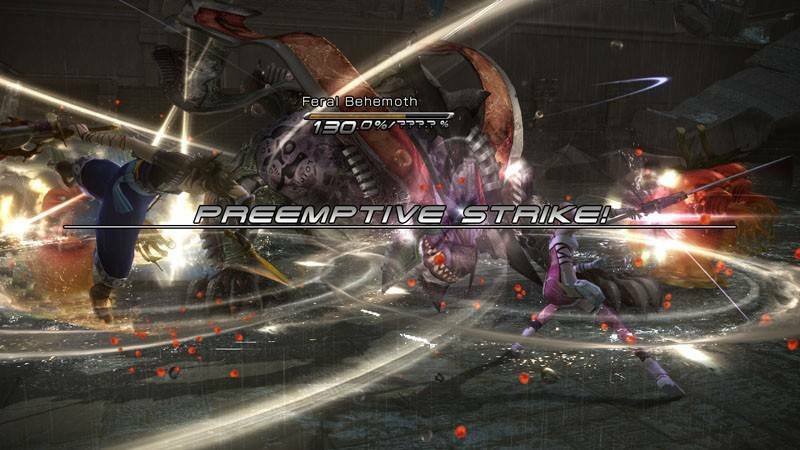 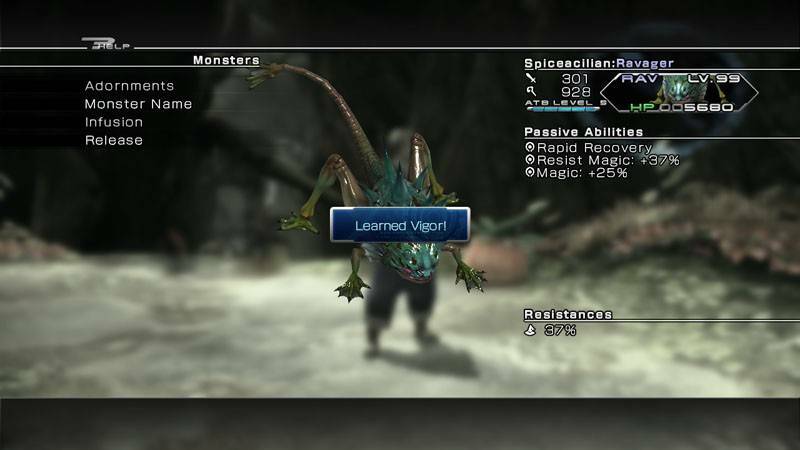 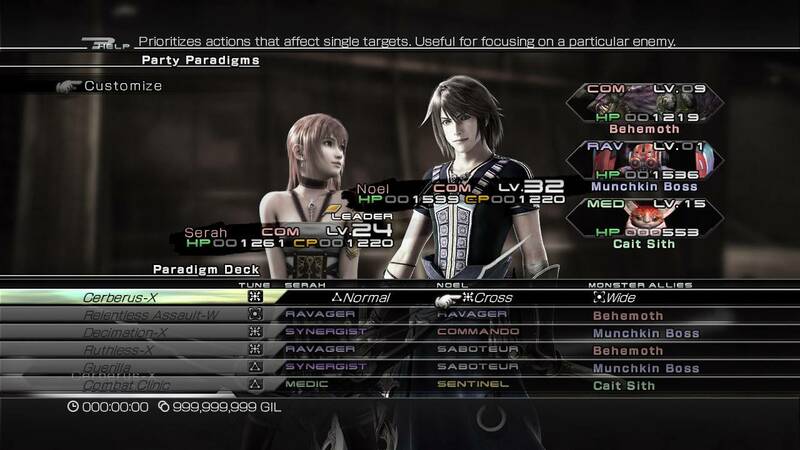 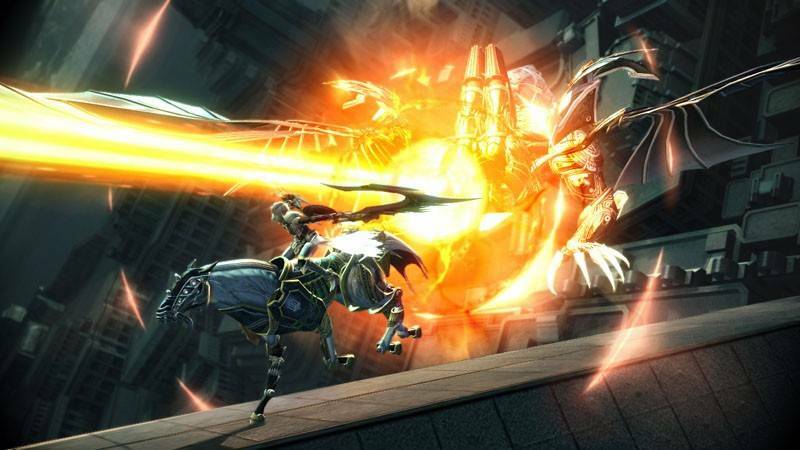 For example, there are things called "Cinematic Actions" that appear every now and then: as the characters do something, well, cinematic, you can perform a button press to get benefits, such as automatically staggering an enemy or buffing your party. 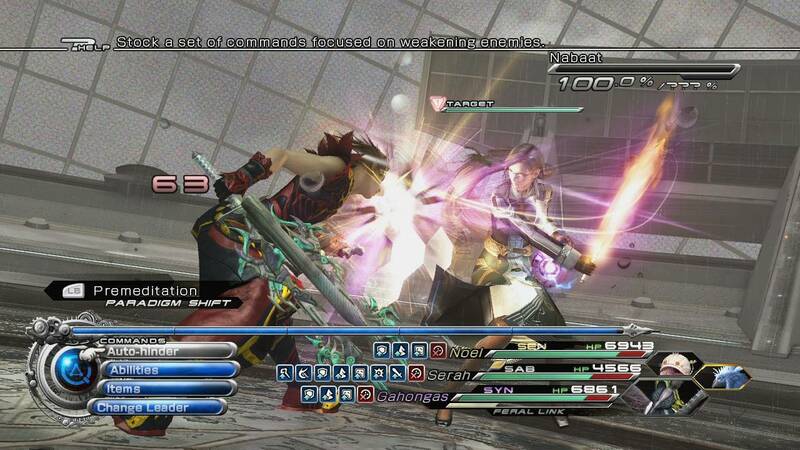 How combat starts is also quite different. 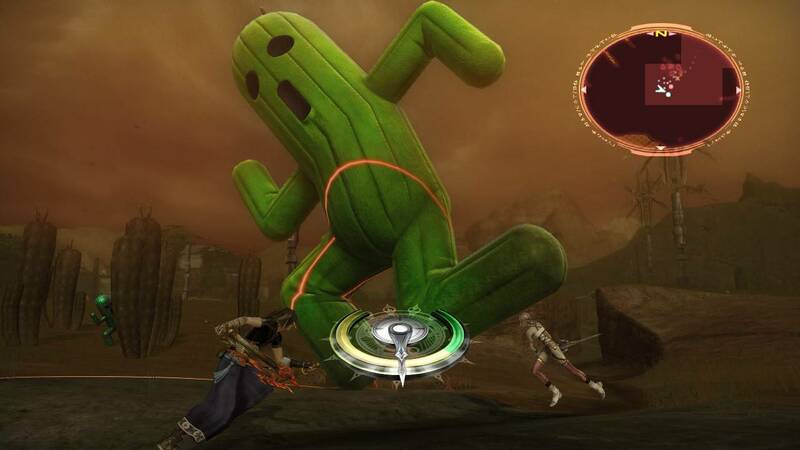 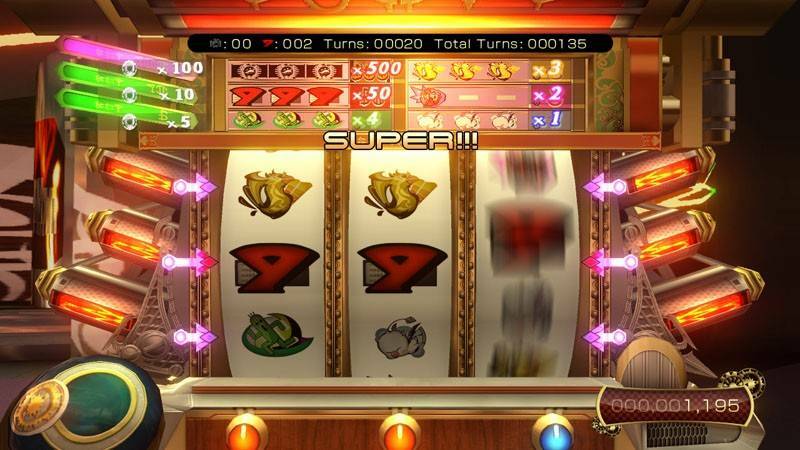 Instead of the previous game, where enemies loitered around until you approached, the sequel brings a different way to attack. 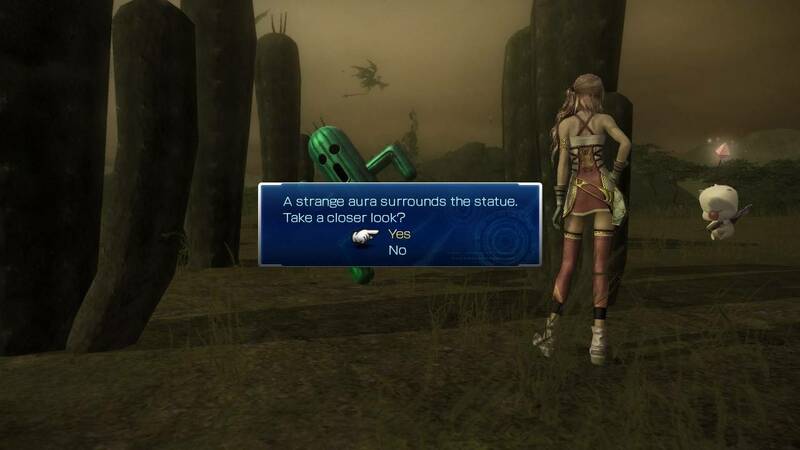 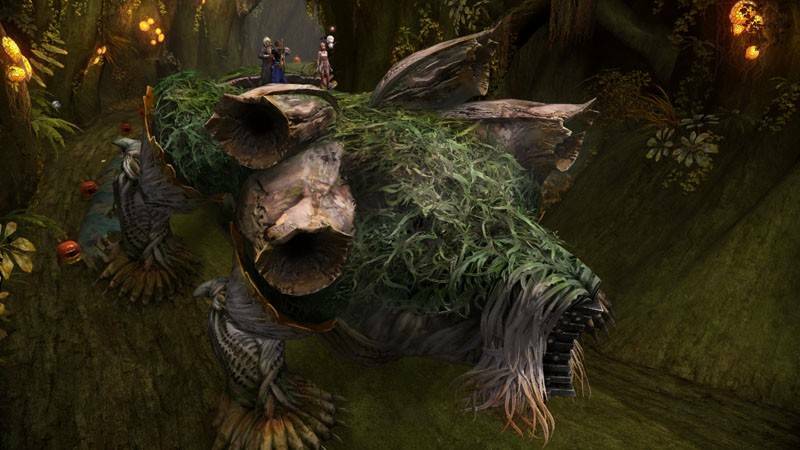 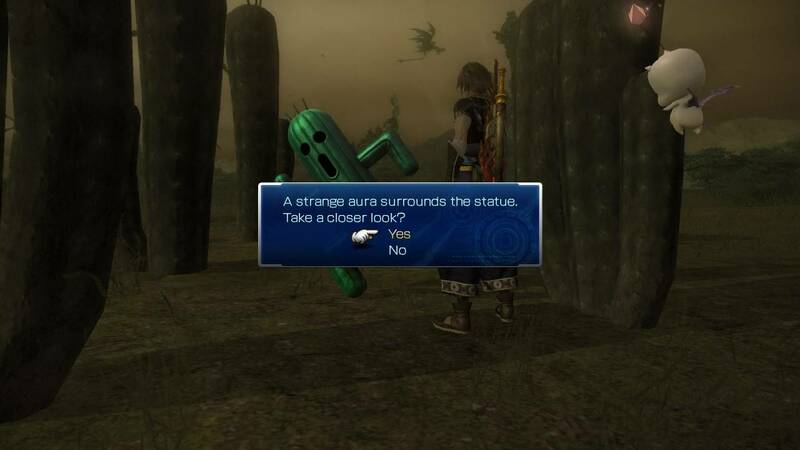 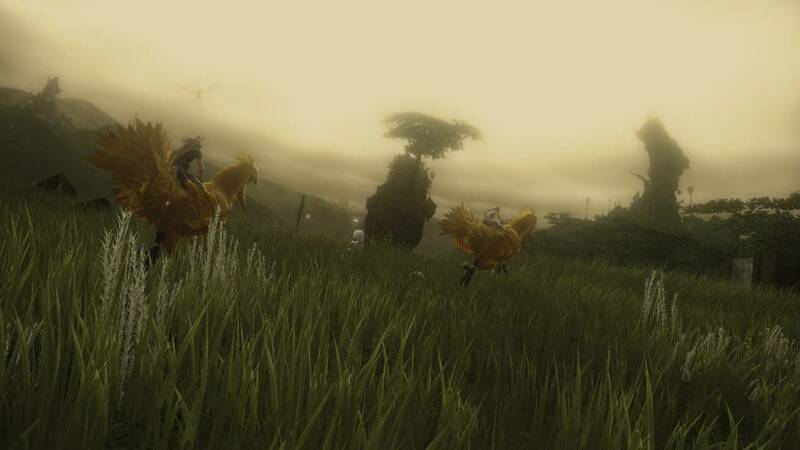 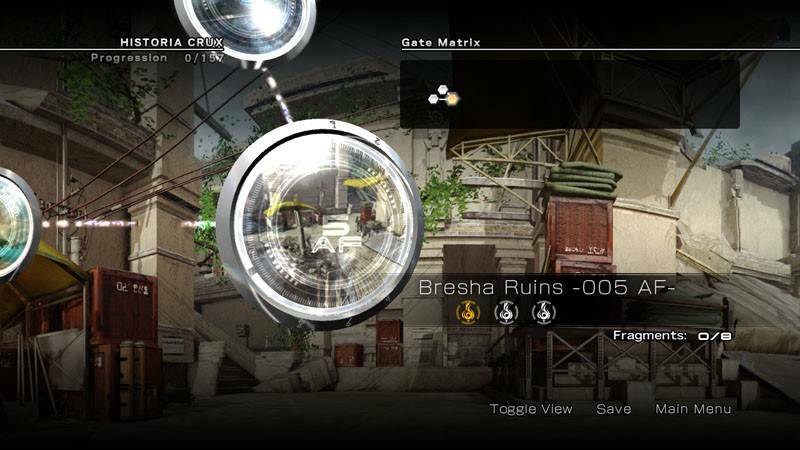 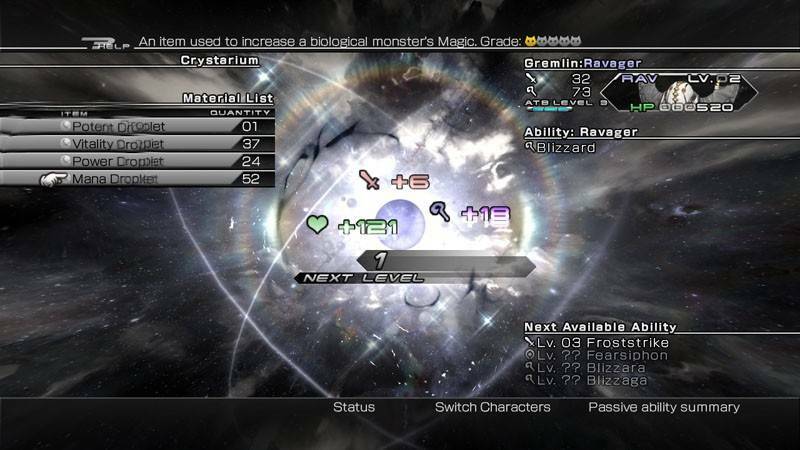 Essentially, a 'random encounter' means a number of enemies appearing around your character on the map, as well as the appearance of a Mog Clock, a strange menu dial that slowly ticks from green to yellow. 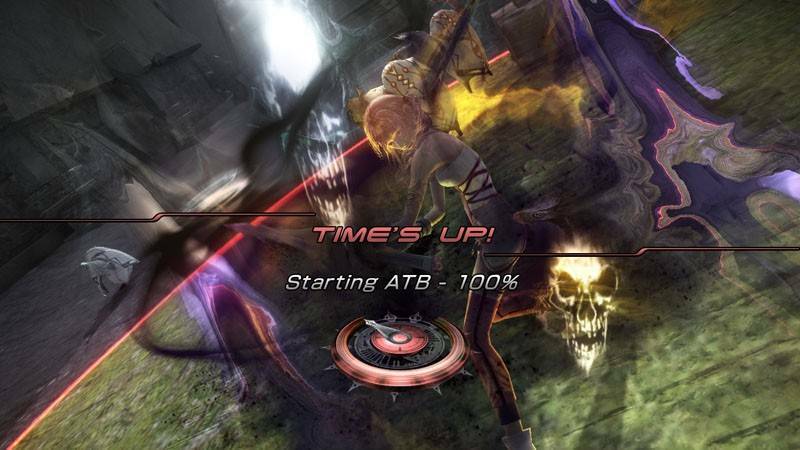 If you manage to attack an enemy while the dial is still in the green, you get a pre-emptive strike, while attacking an enemy when it reaches yellow means a standard battle. 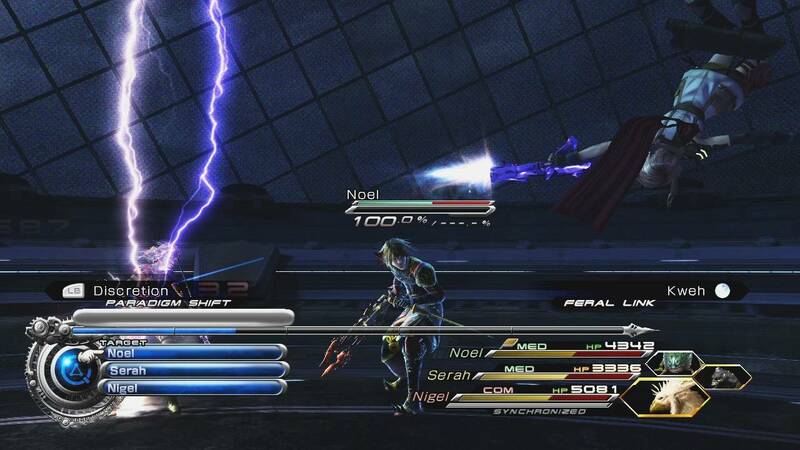 If the enemy manages to hit you first, however, they get the upper hand. 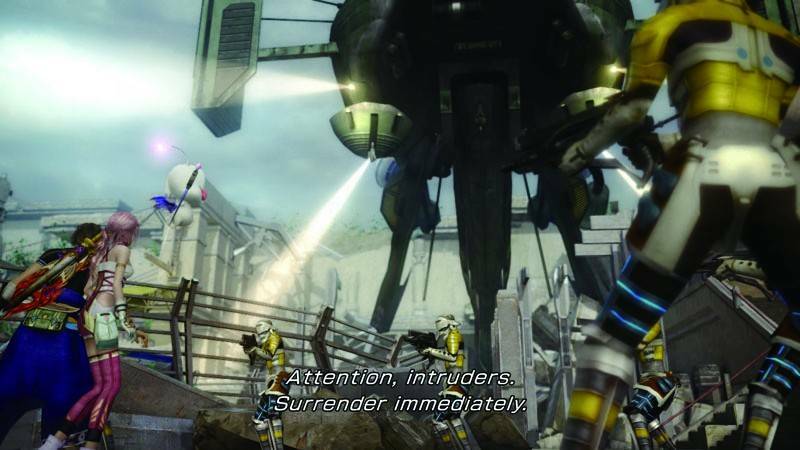 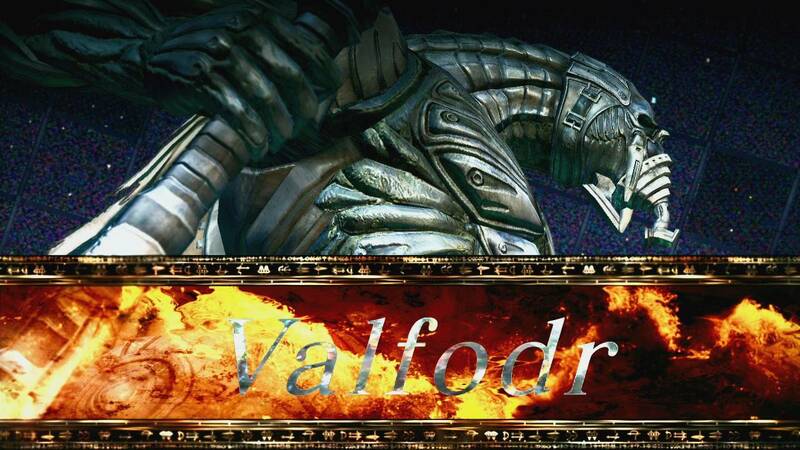 such as soldiers, that will assist you in this endeavour by opening fire on the enemies. 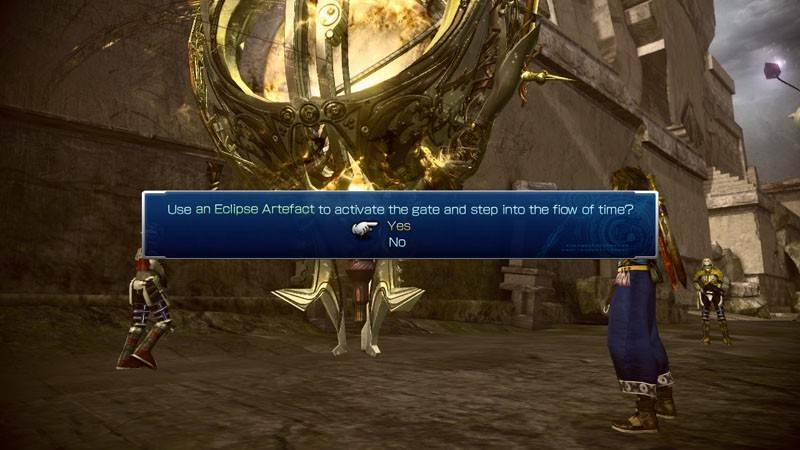 This will give you more time to escape, if you need it. 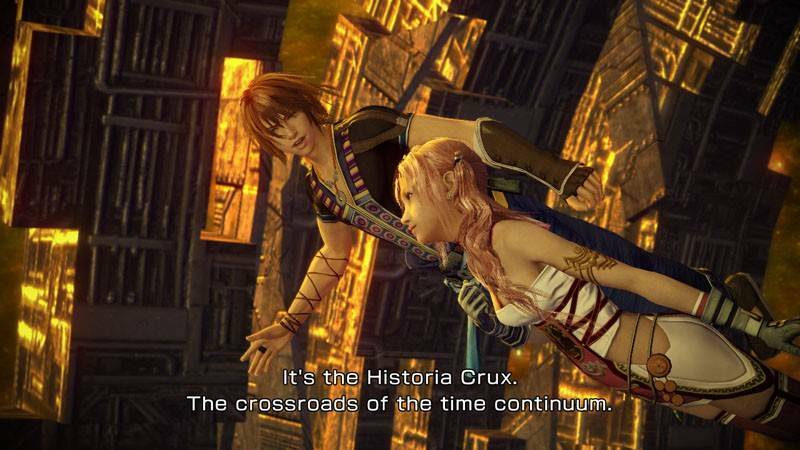 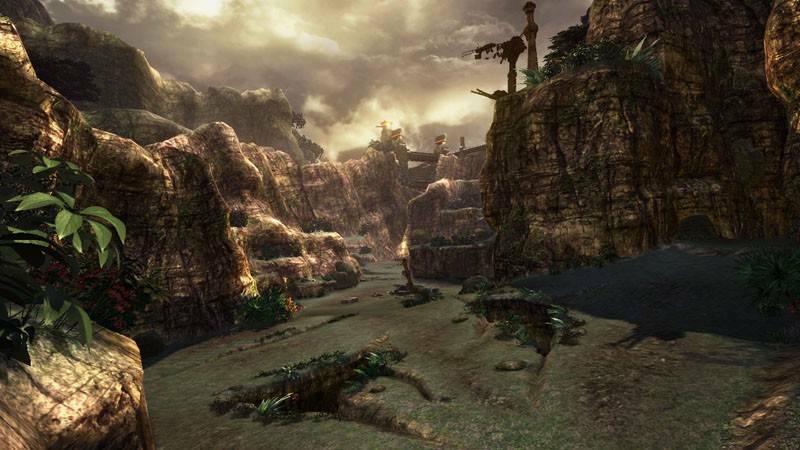 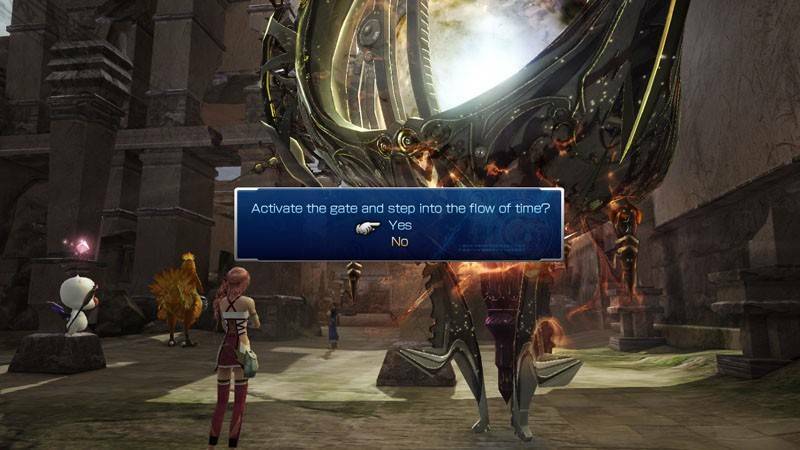 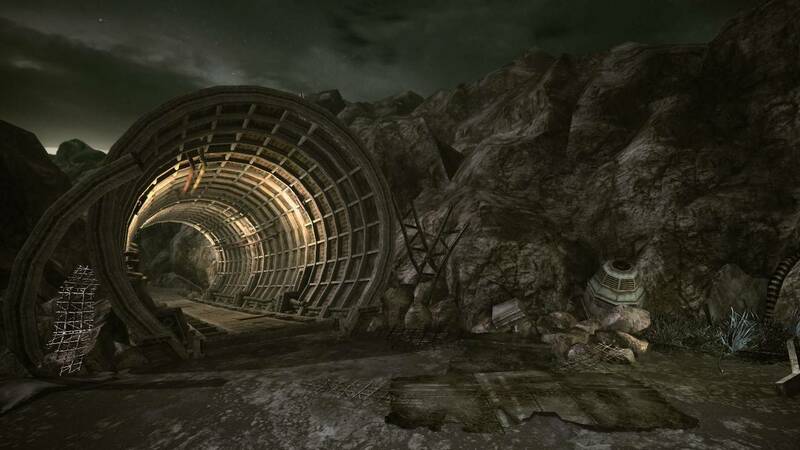 Aside from the ability to choose certain paths (for example, making your way through a dungeon is made much easier if you take a separate path, longer but with easier battles), we were also shown the "Temporal Rift". 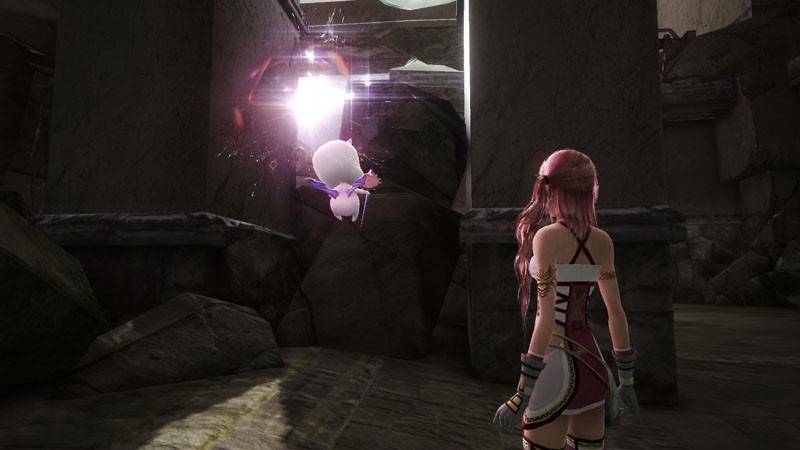 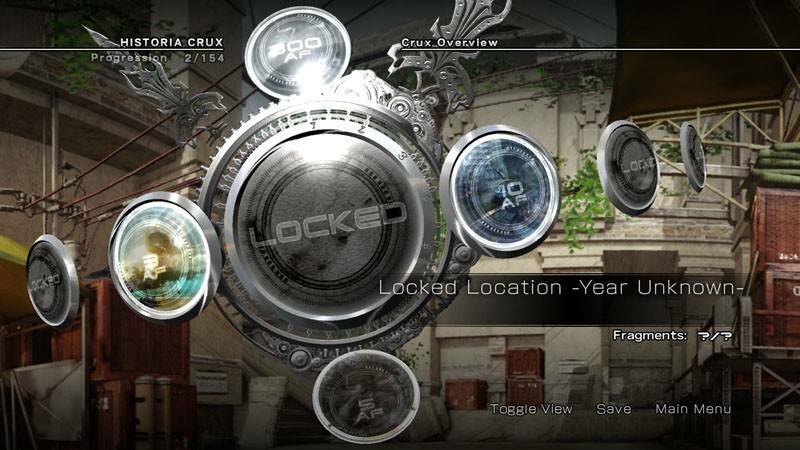 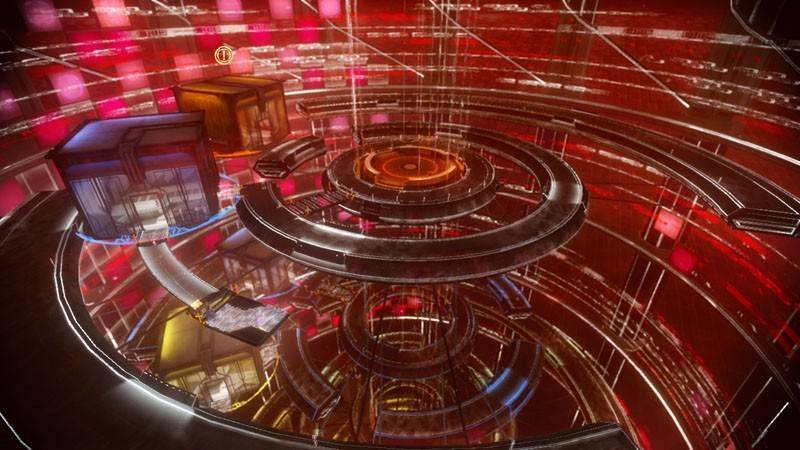 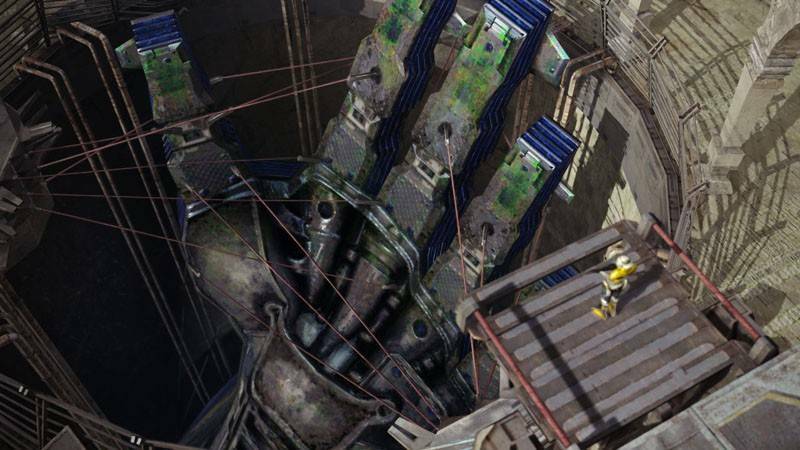 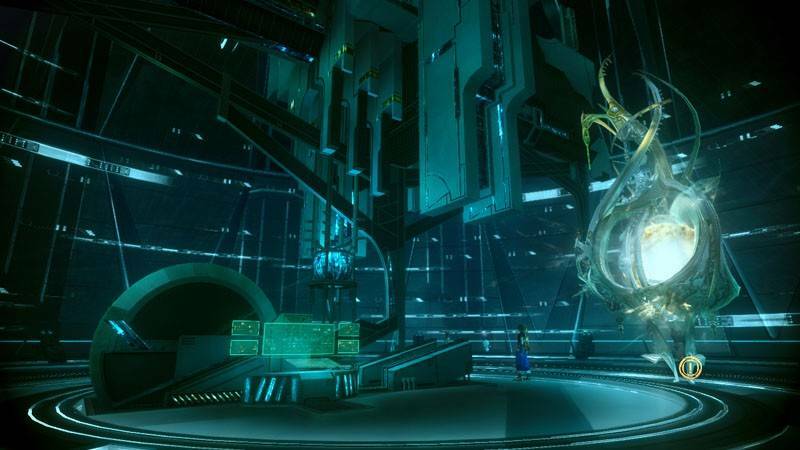 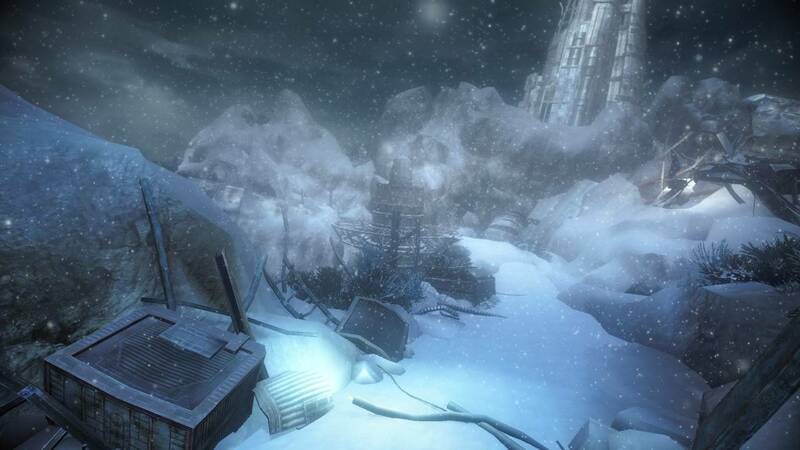 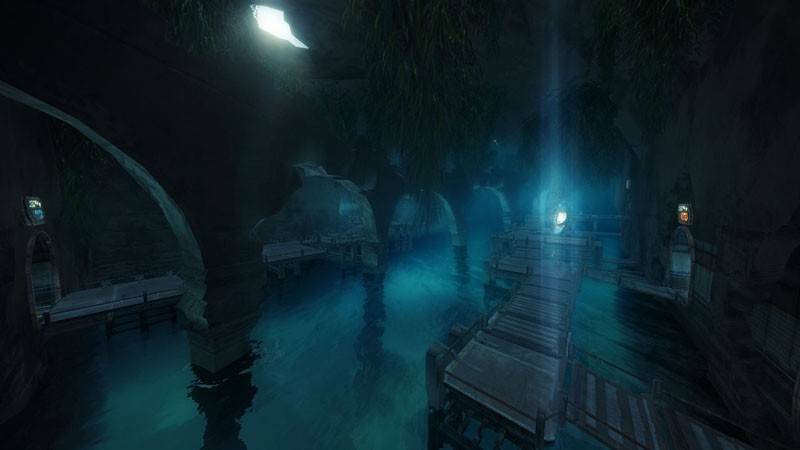 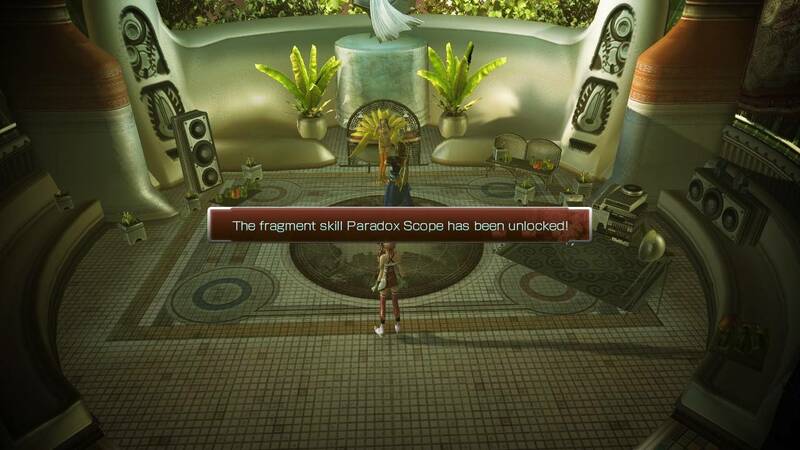 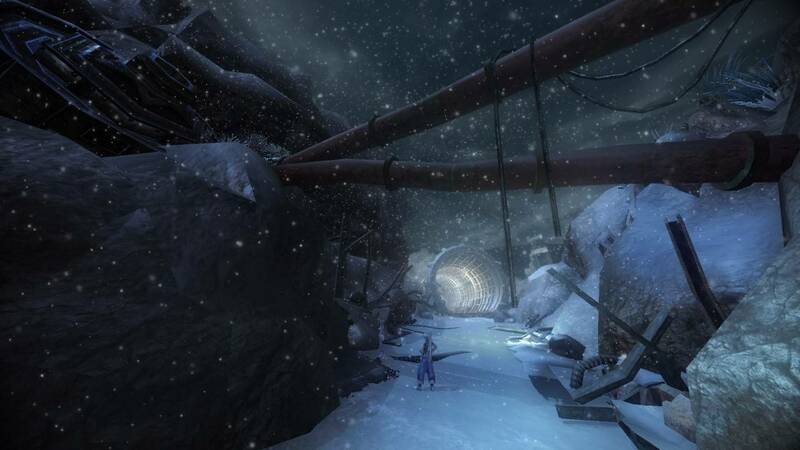 This area, of which there are a few in the game, is a change of pace in which you must solve puzzles to proceed forward, collecting a number of crystal fragments to open the door to the next area. 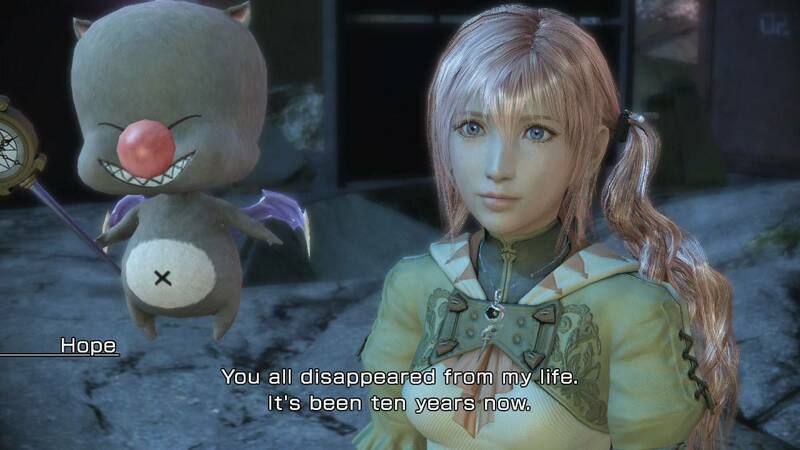 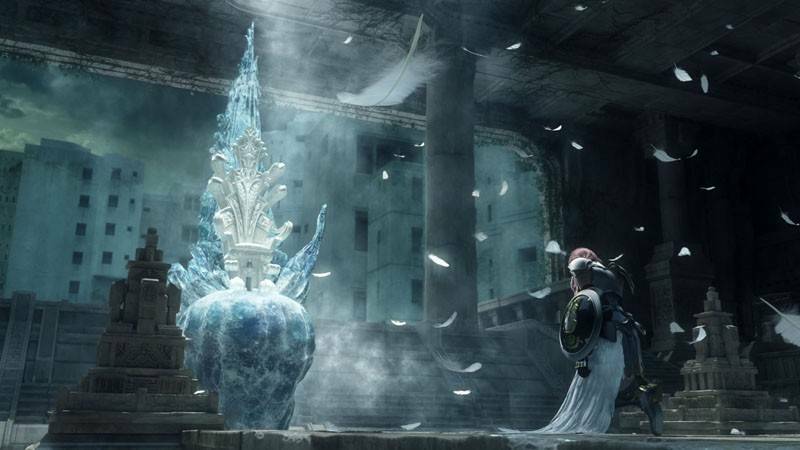 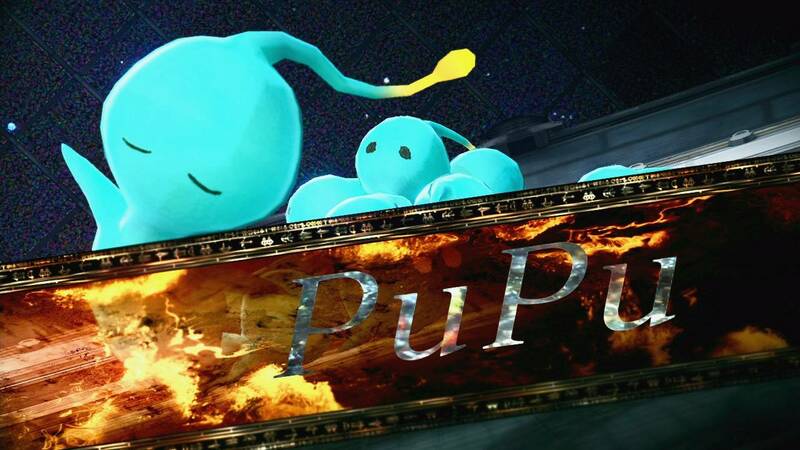 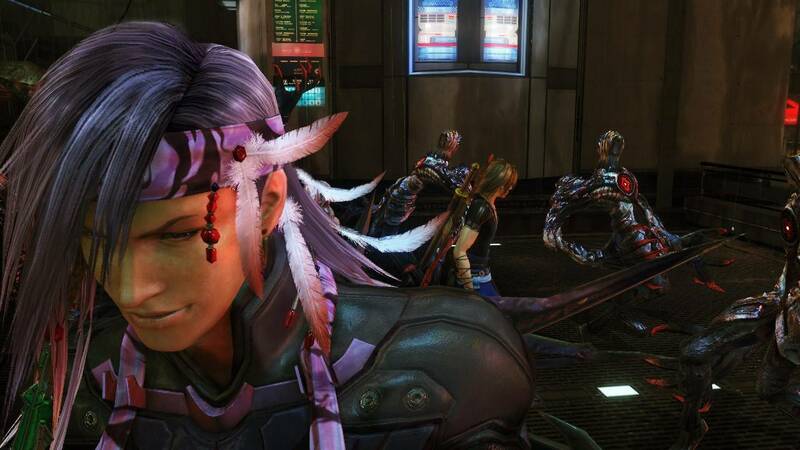 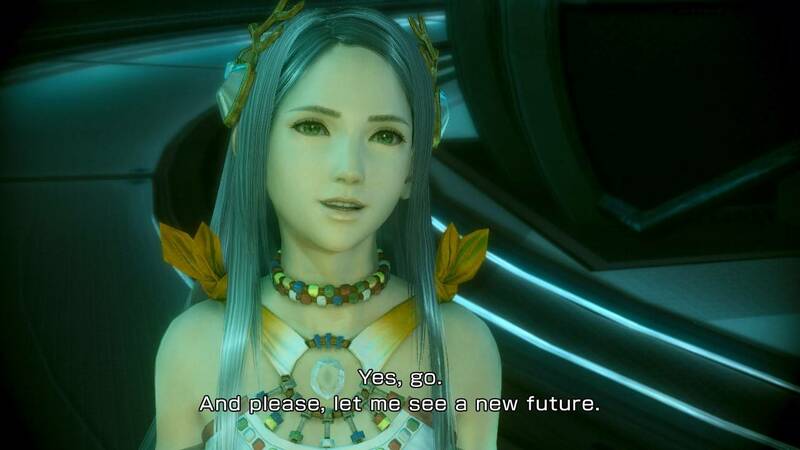 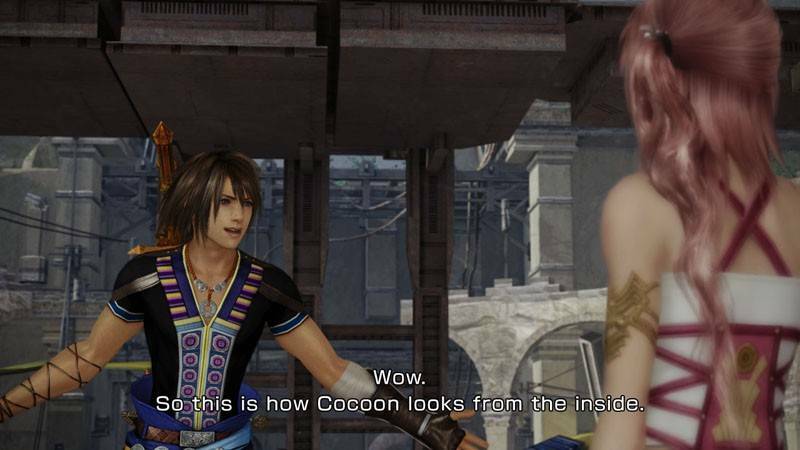 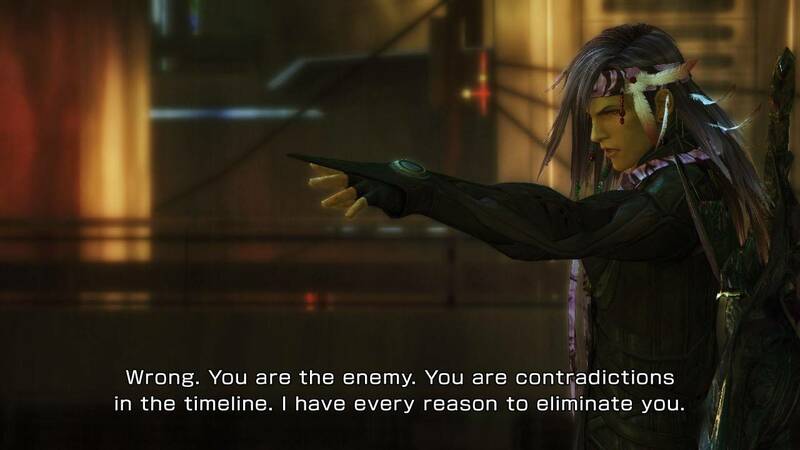 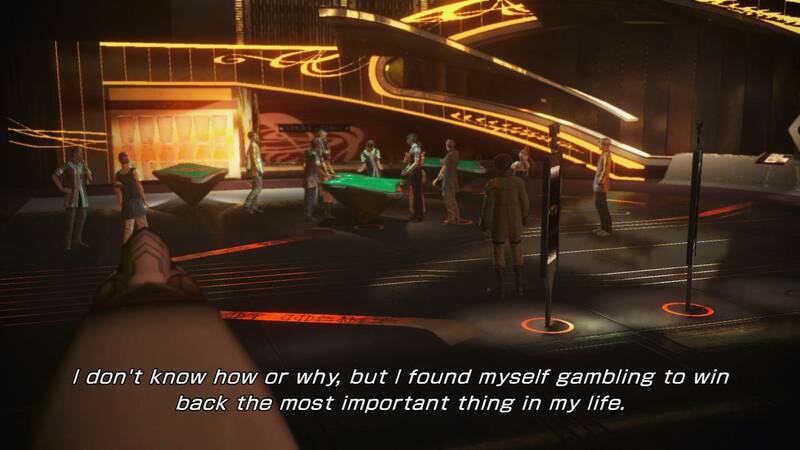 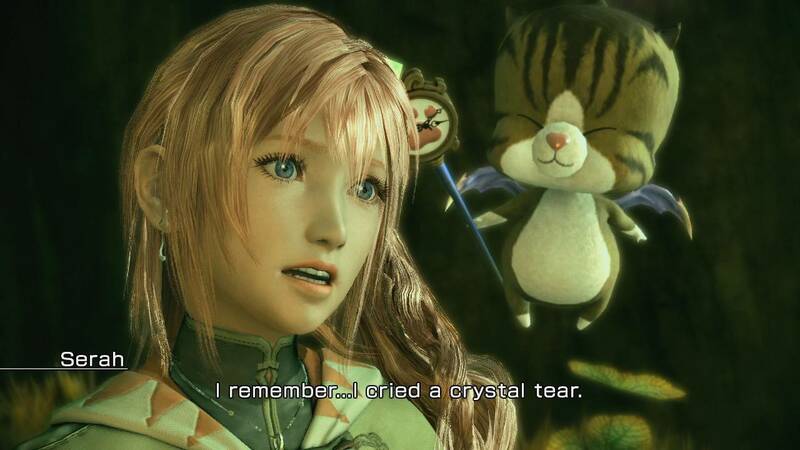 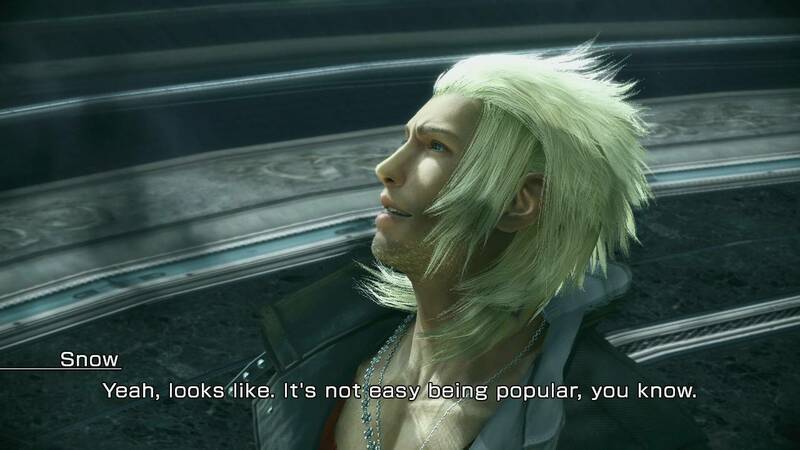 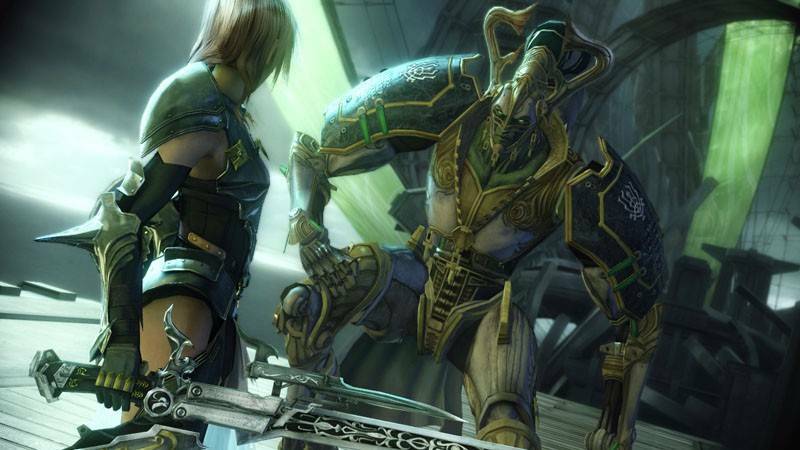 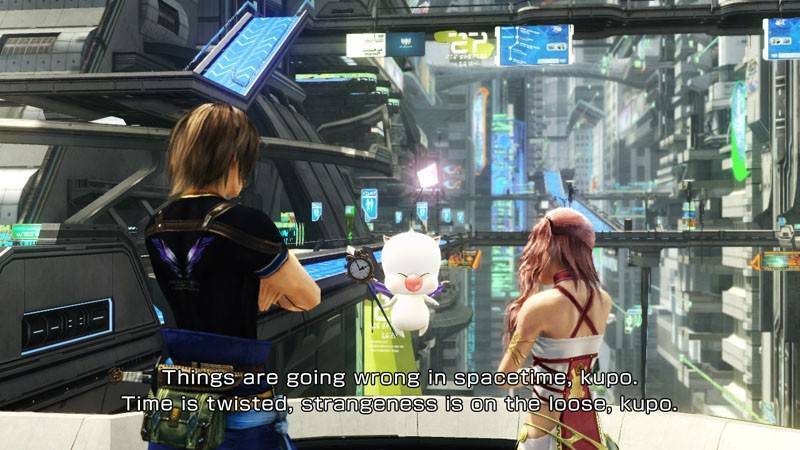 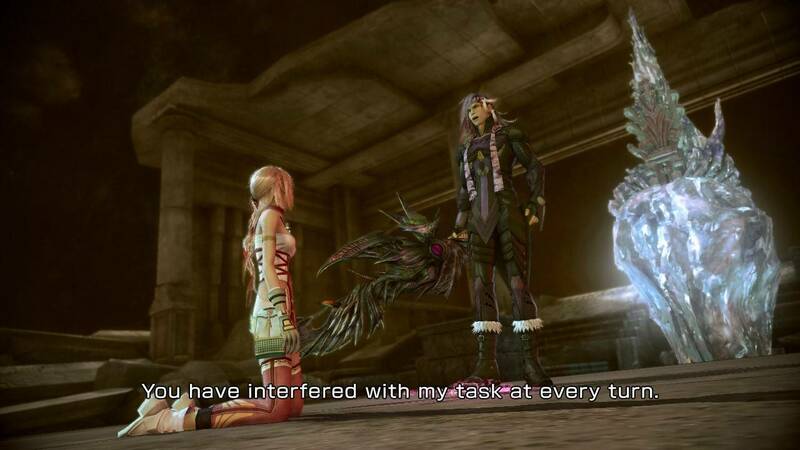 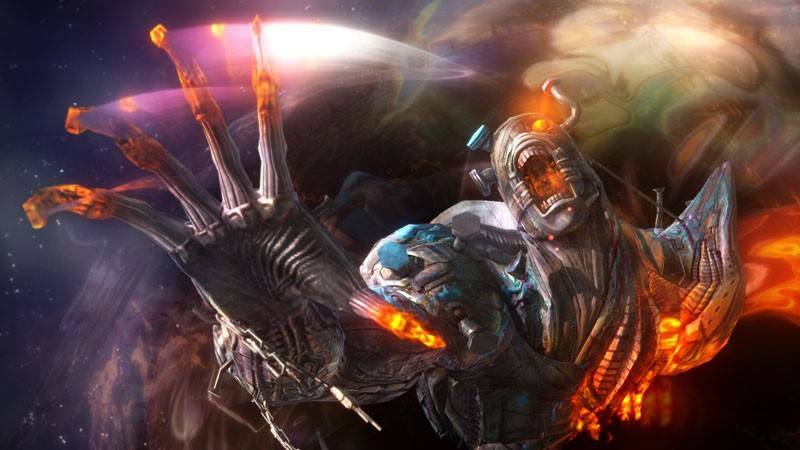 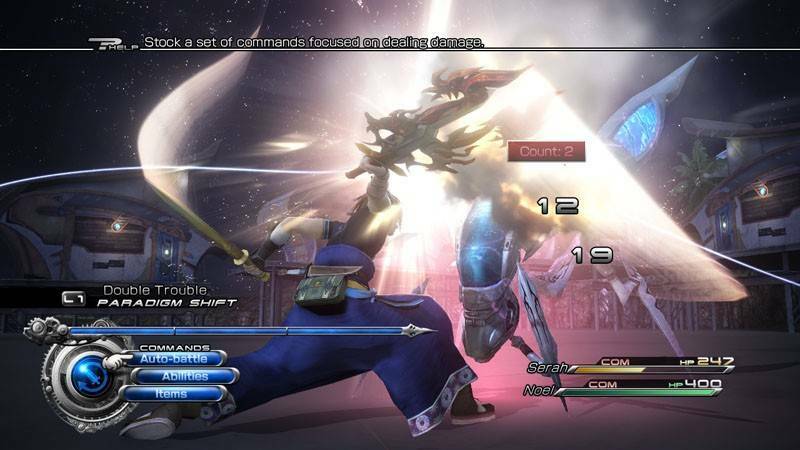 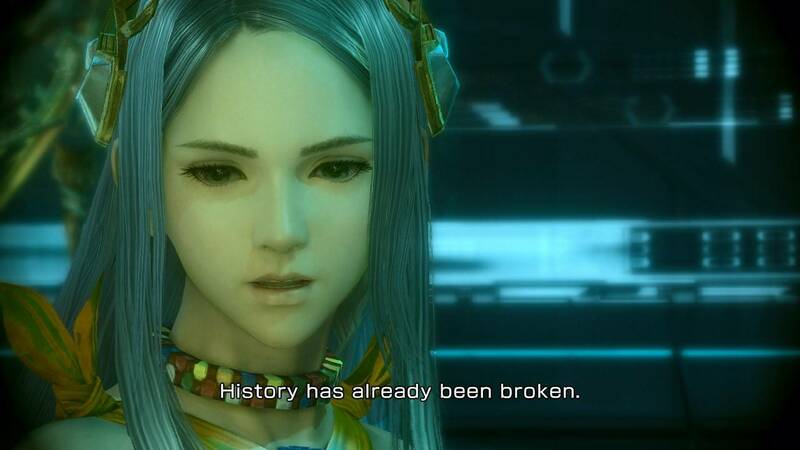 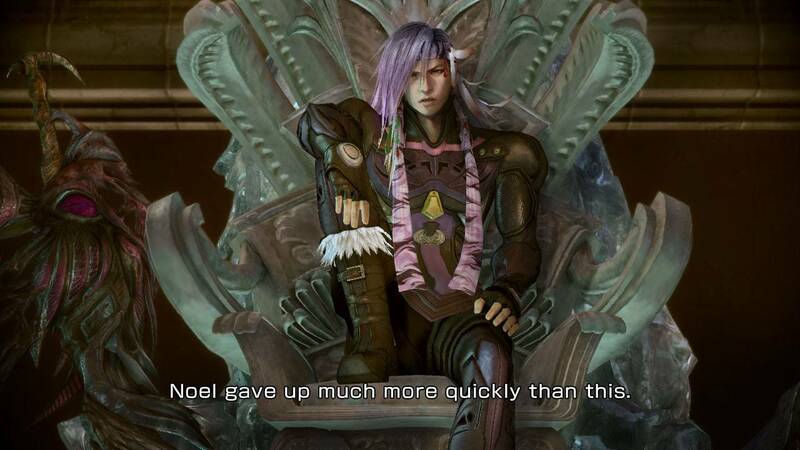 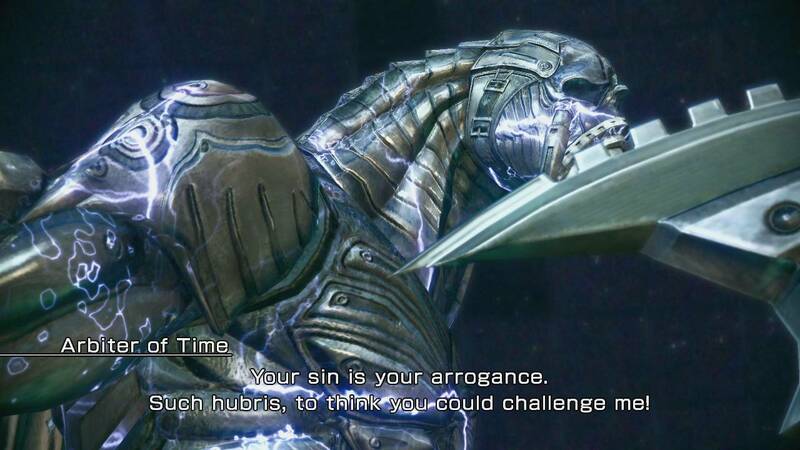 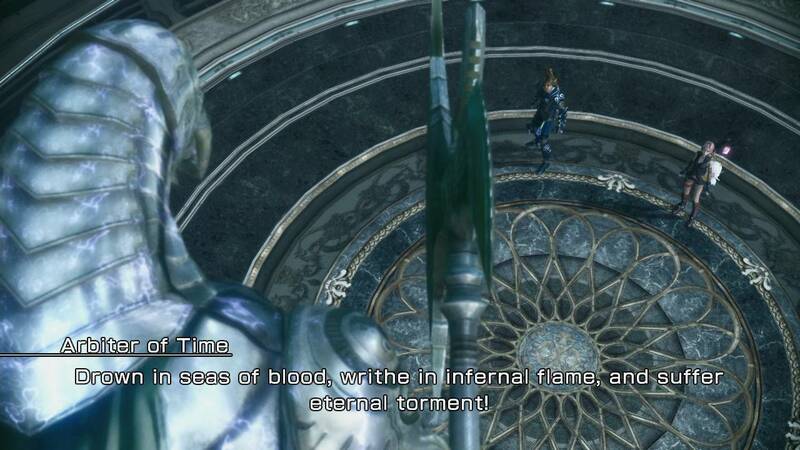 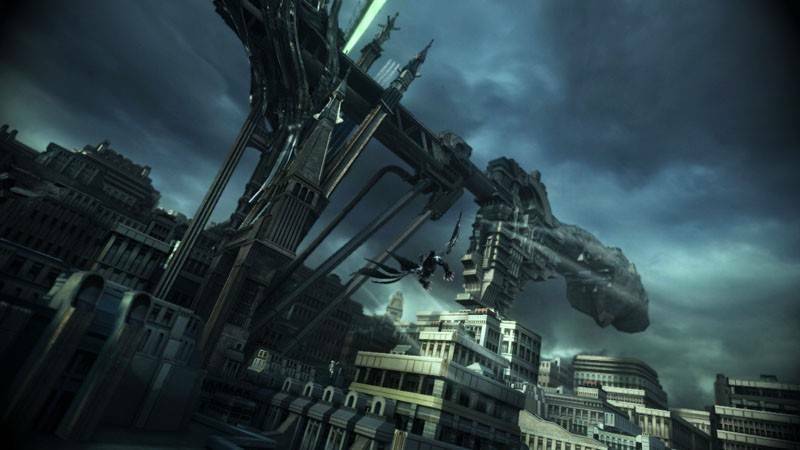 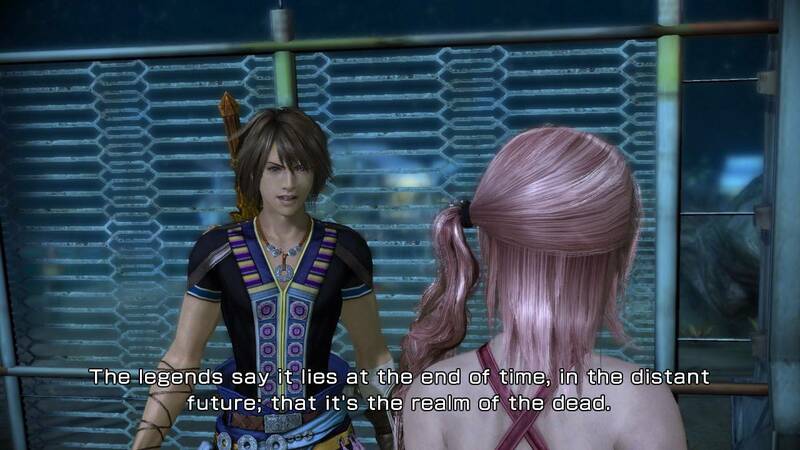 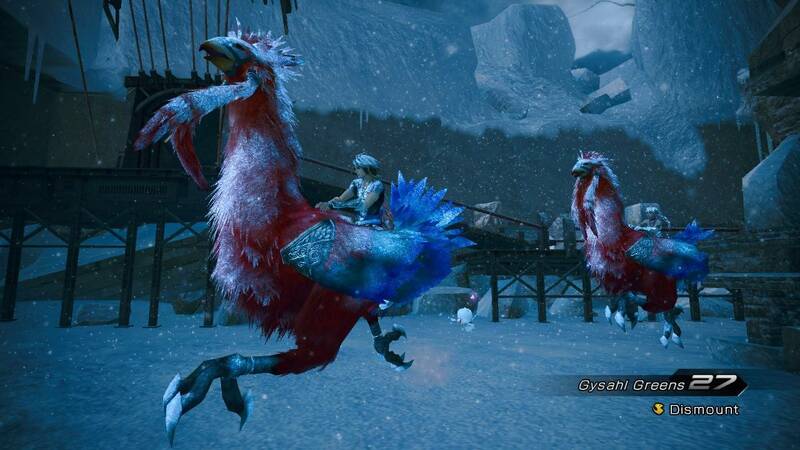 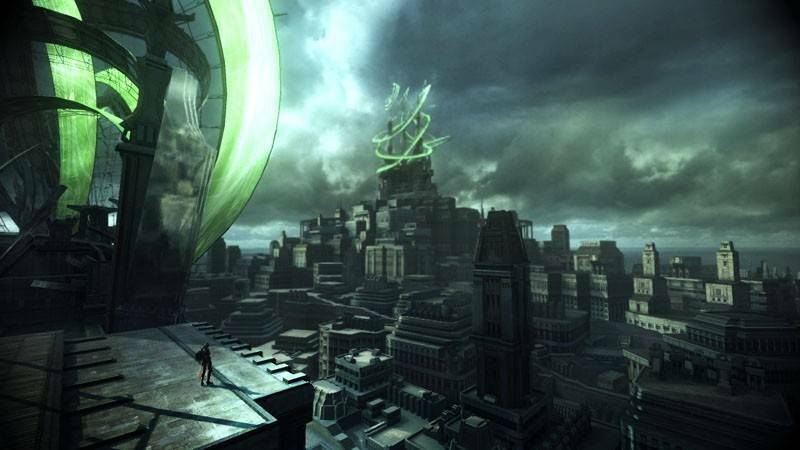 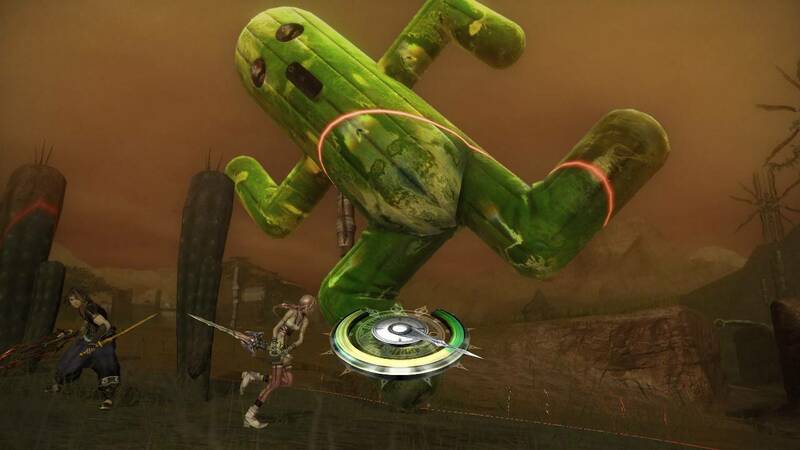 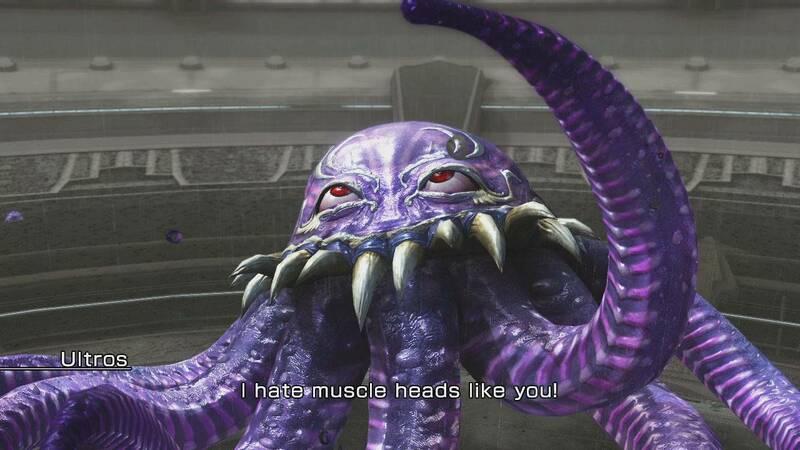 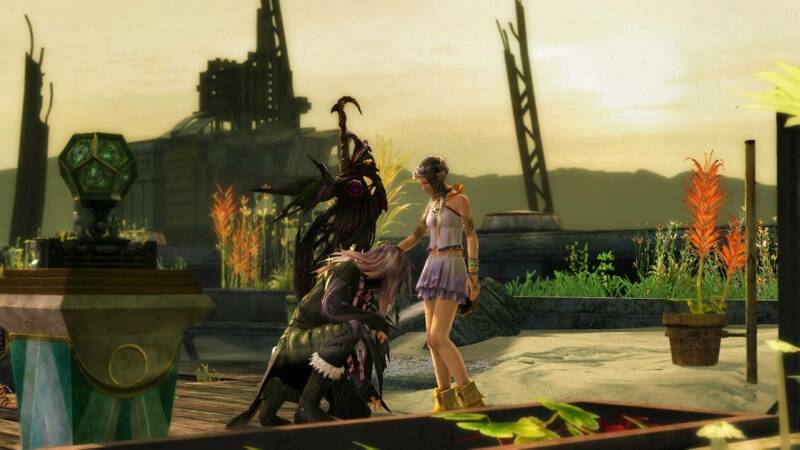 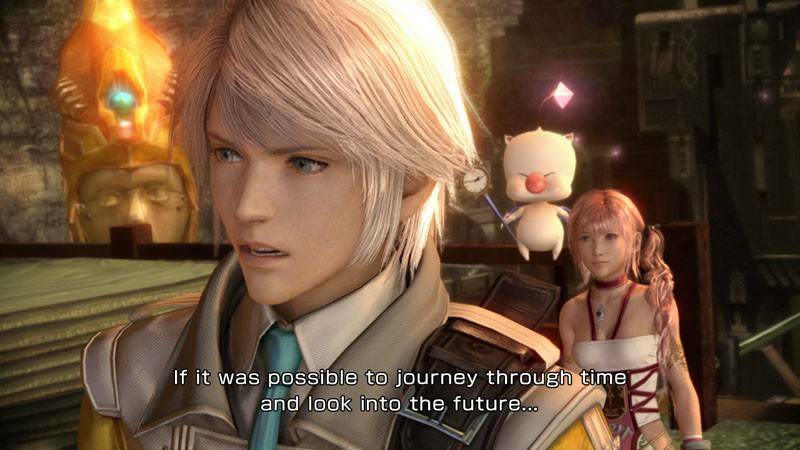 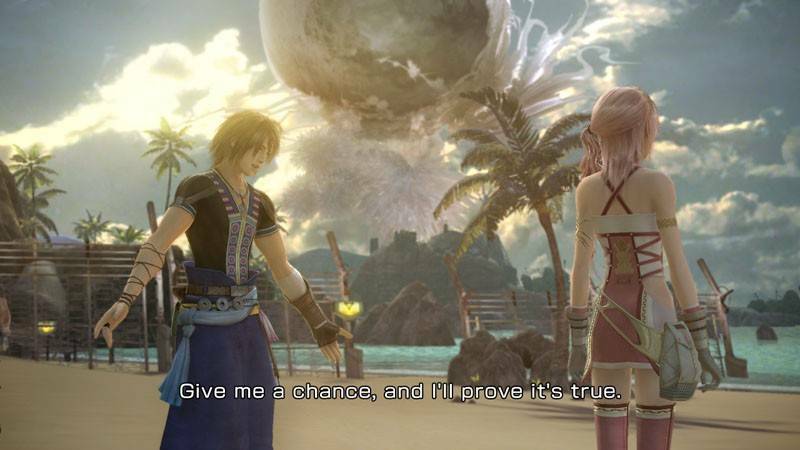 Reviews of the previous Final Fantasy XIII were...not all positive, so hopefully Square-Enix has learned from its mistakes. 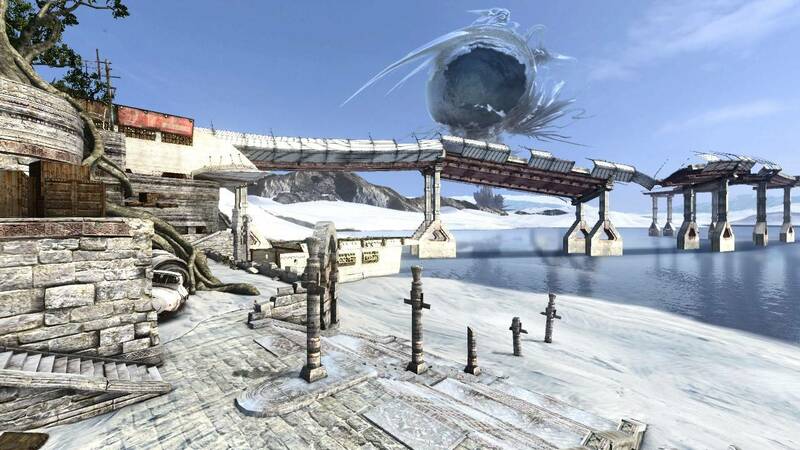 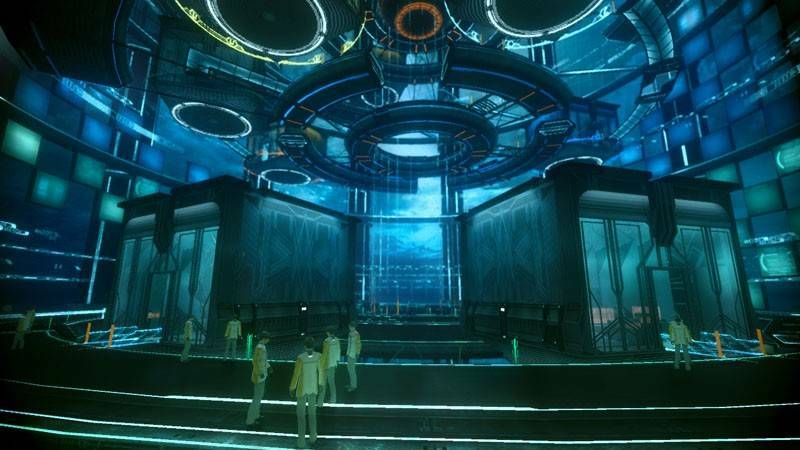 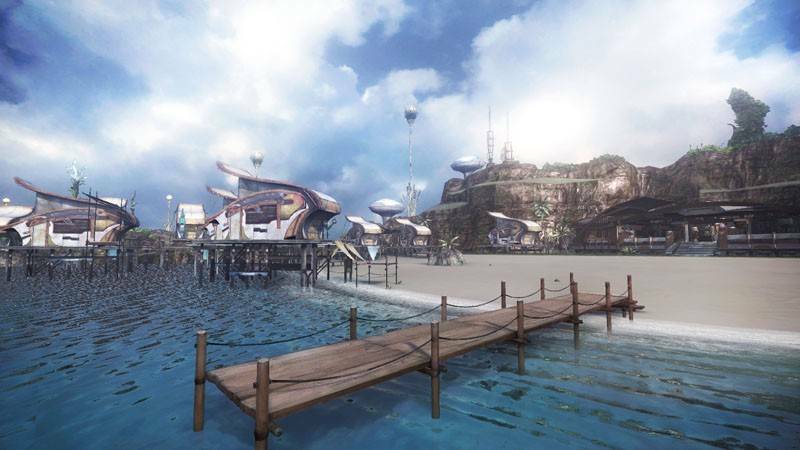 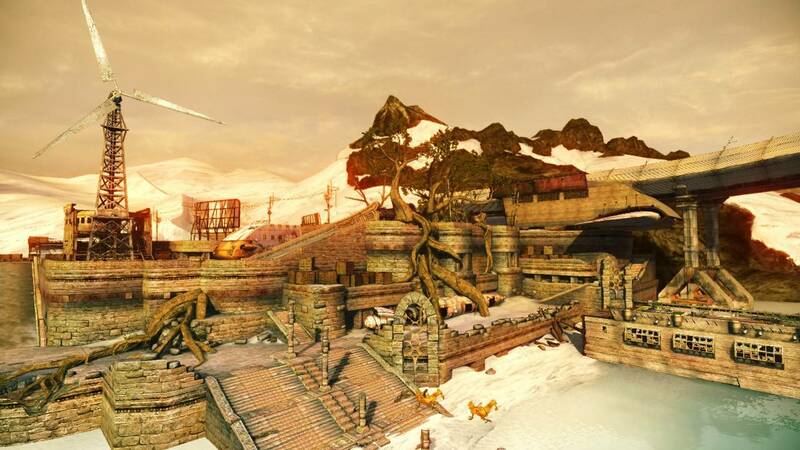 Though the sequel looks to try to add more variety and more content (like larger maps, as towns, for example), we'll have to wait until early next year to find out.